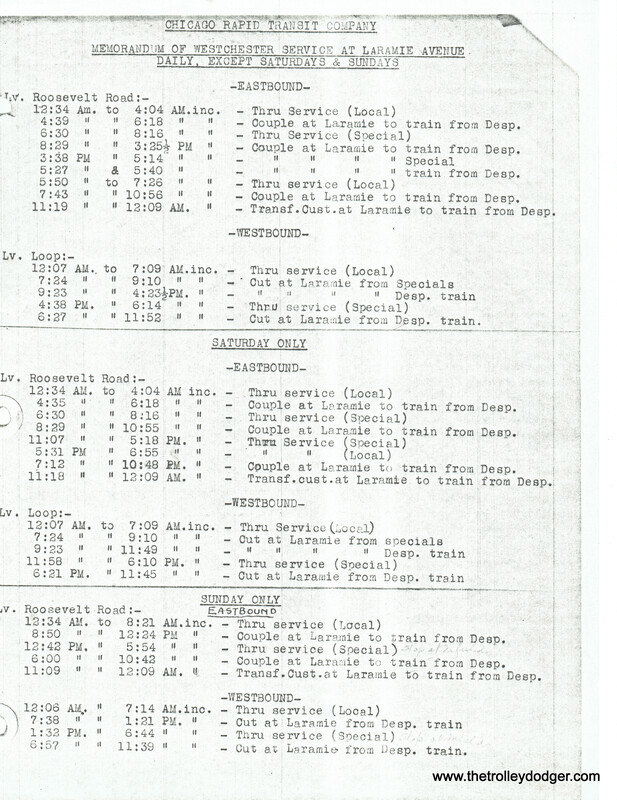 On the subject of the The Guy Wicksall Traction Collection*, I am, as you said (you were referring to me? 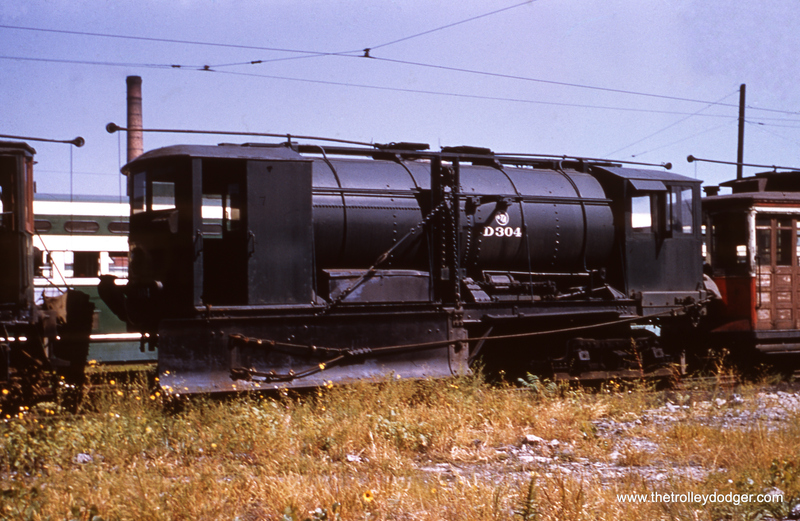 ), looking forward to seeing the Gladstone Branch material on it. 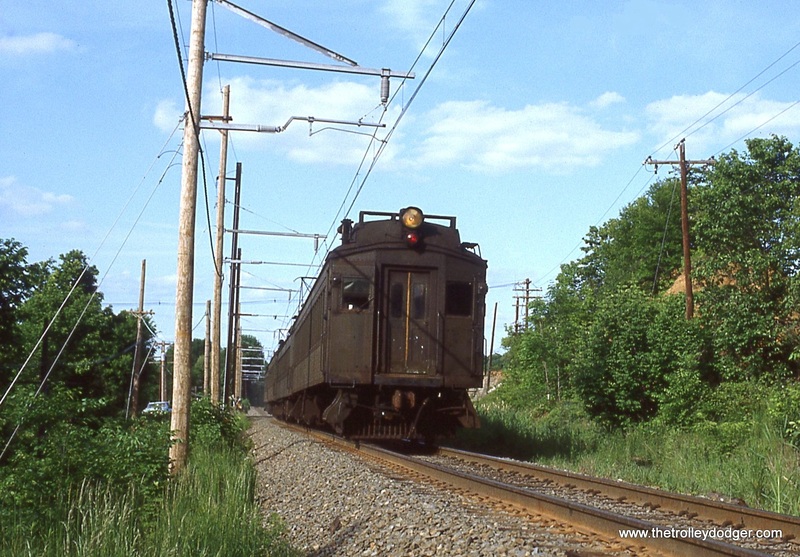 NJ Transit’s Gladstone operation is about as close as I ever got to riding and photographing a true Interurban Railroad. 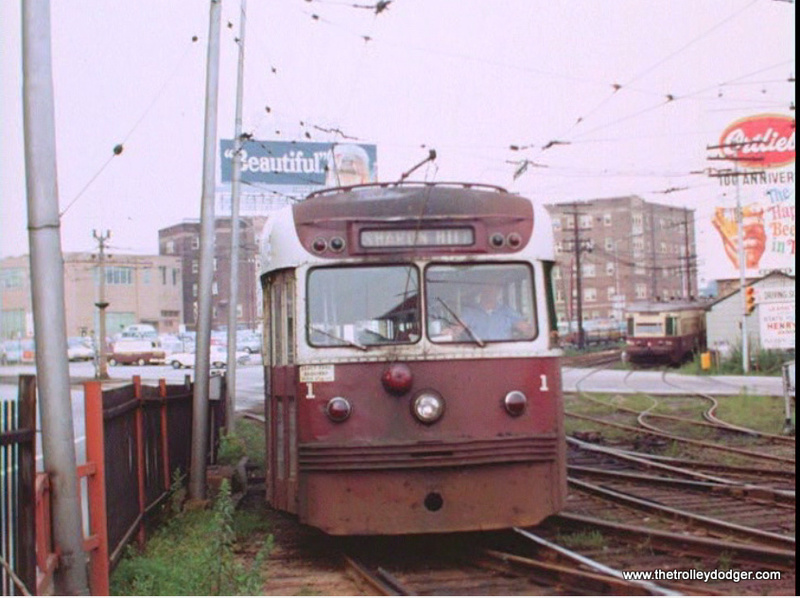 I think it was very close, with it’s DC electric MUs and wooden catenary poles. 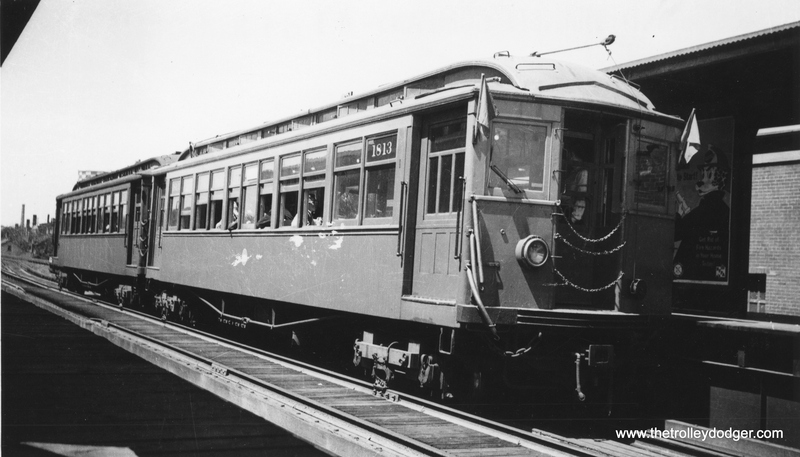 It sure had the “feel” of an interurban, at least it did to me. 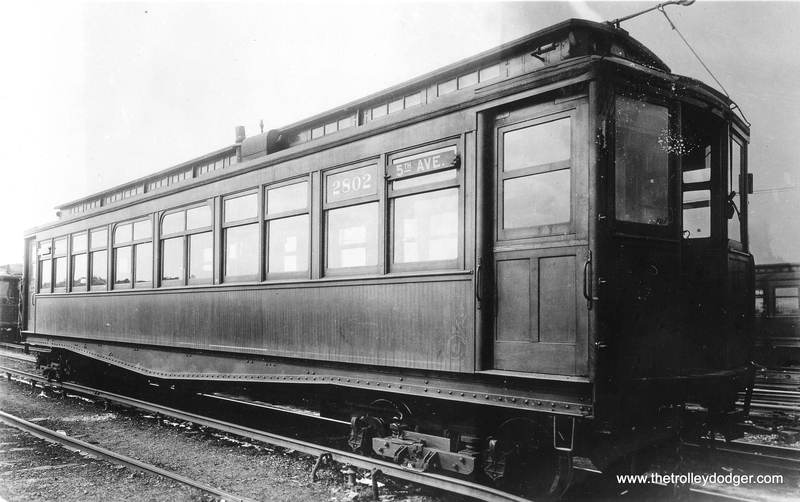 I attached two photos to illustrate my point. 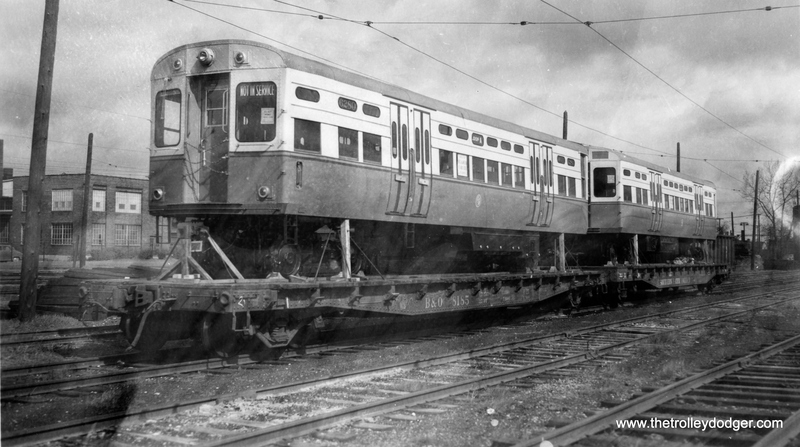 One of my “railfan regrets” is never getting over to SEPTA’s Norristown line and riding and photographing the Bullet cars. 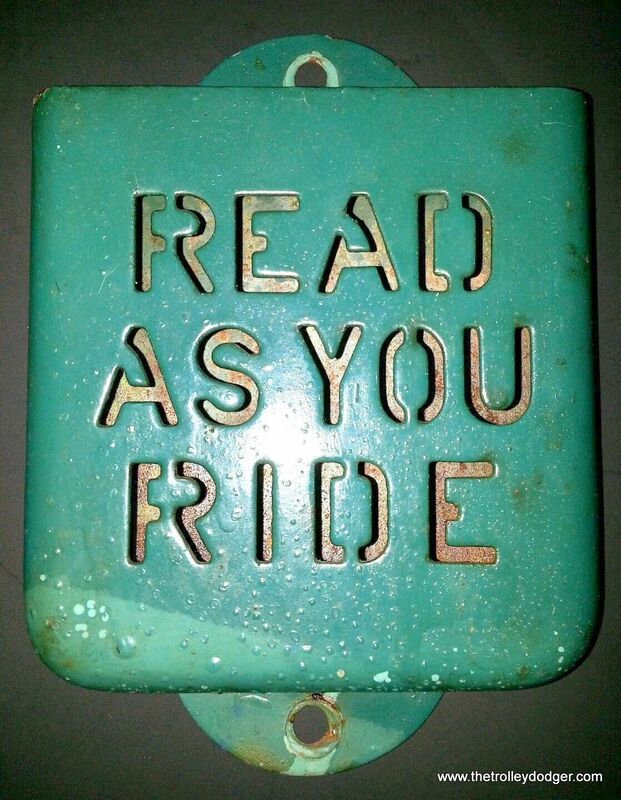 I always meant to, but somehow it never happened. 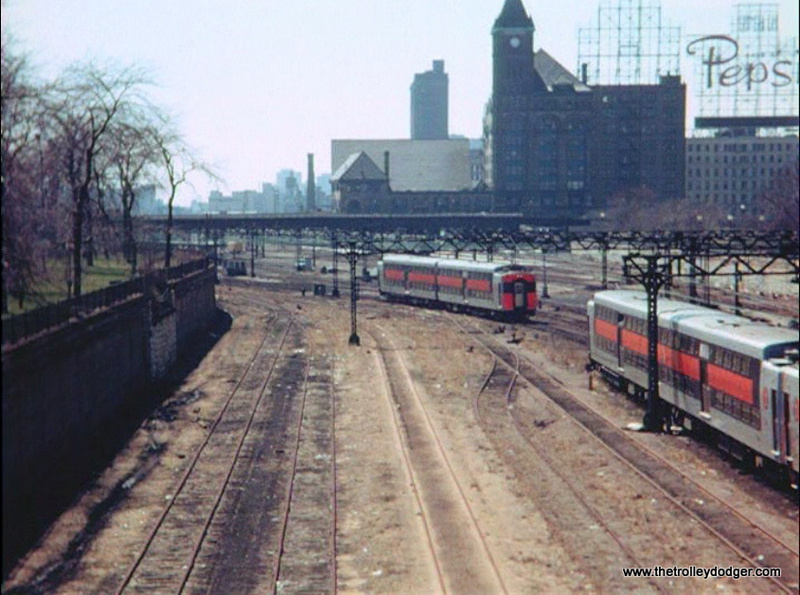 Another regret is that when I made a railfan trip to Chicago back in 1982 I did not ride the CSS&SB’s old MUs. 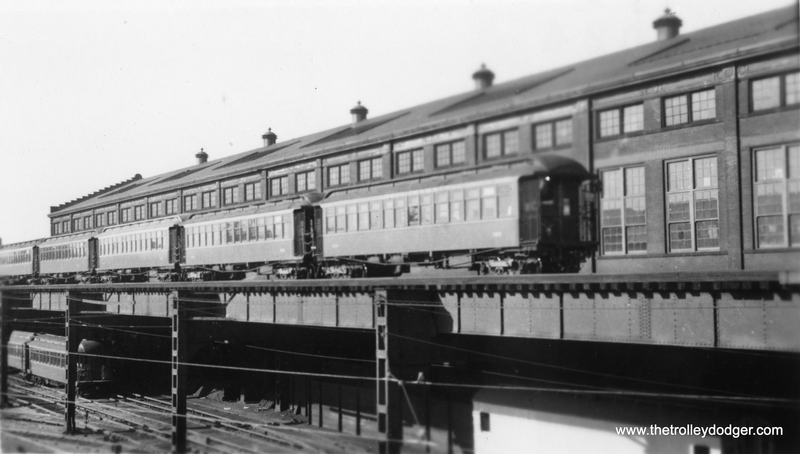 I did however, photograph ONE train of them, I attached the photos as well. 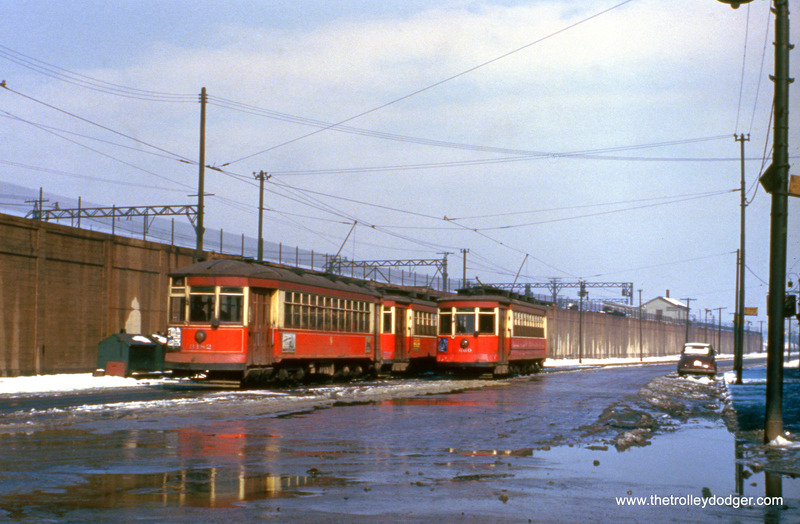 Looking at this CSS&SB photo gave me an idea for the Trolley Dodger. 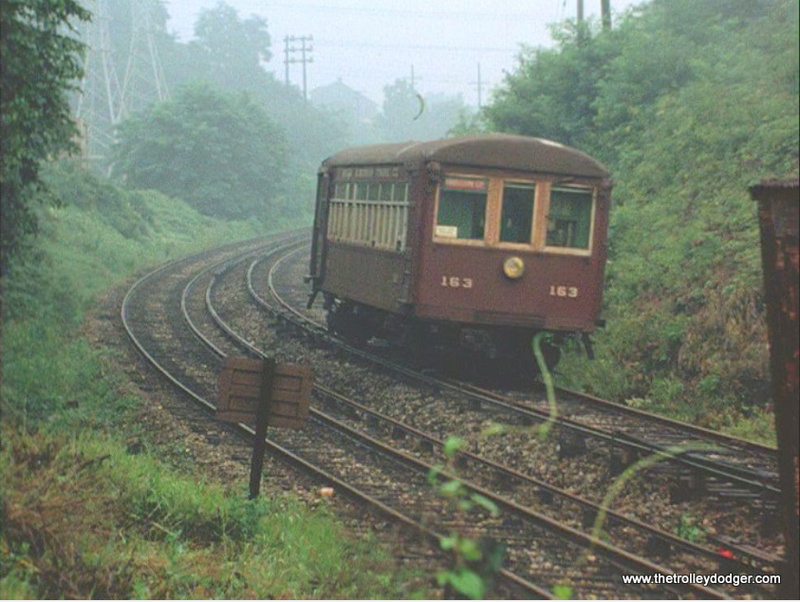 Perhaps you could ask people to send in a few of their traction photographs to use in a “Readers Photos” section. 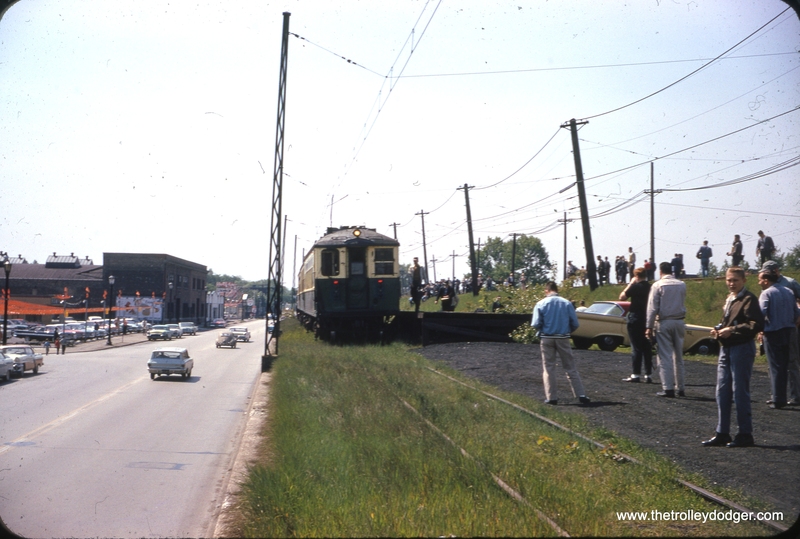 These photos would not necessarily pertain to the subject of the post, just a little gallery of unrelated traction photos. 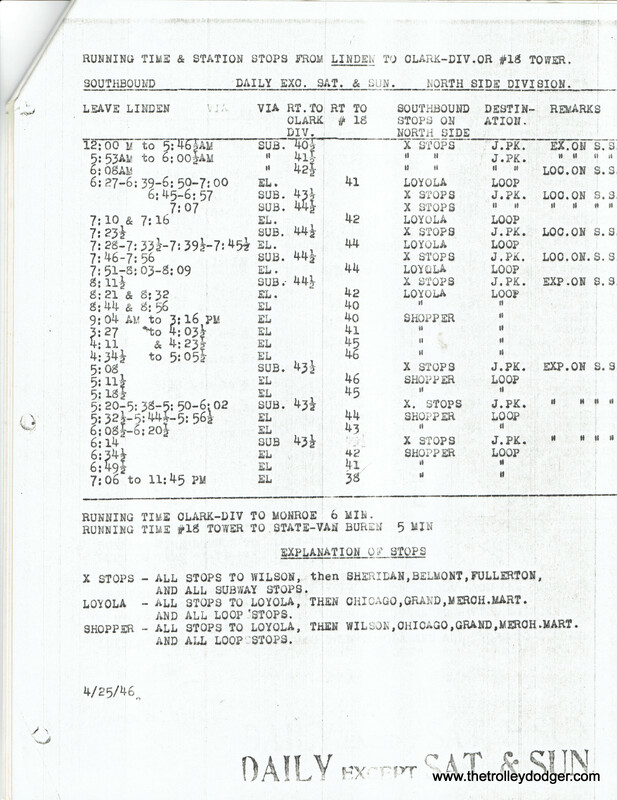 It might come in handy if you need to fill out a Trolley Dodger post that’s a little short. It’s just an idea. 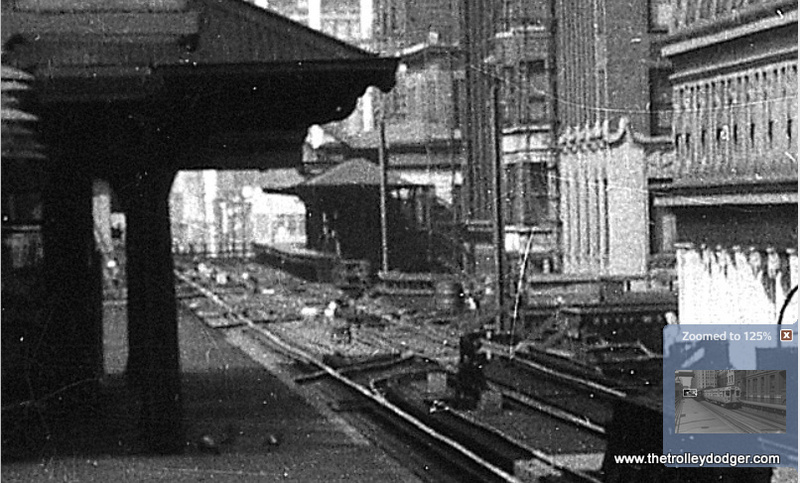 *See our post Guy Wicksall and His Films, October 11, 2016. Thanks! I will run your pictures. Once people see how it’s done, they will probably be inspired to send others of their own. And yes, I was referring to you. 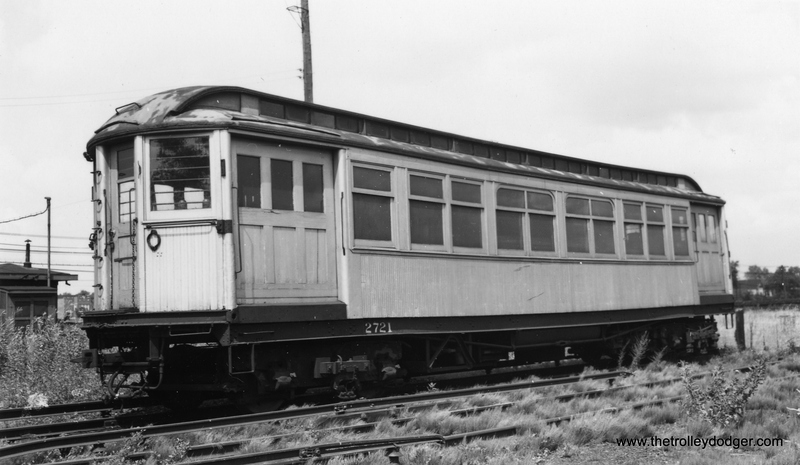 Does the Gladstone branch retain any of that interurban character today? 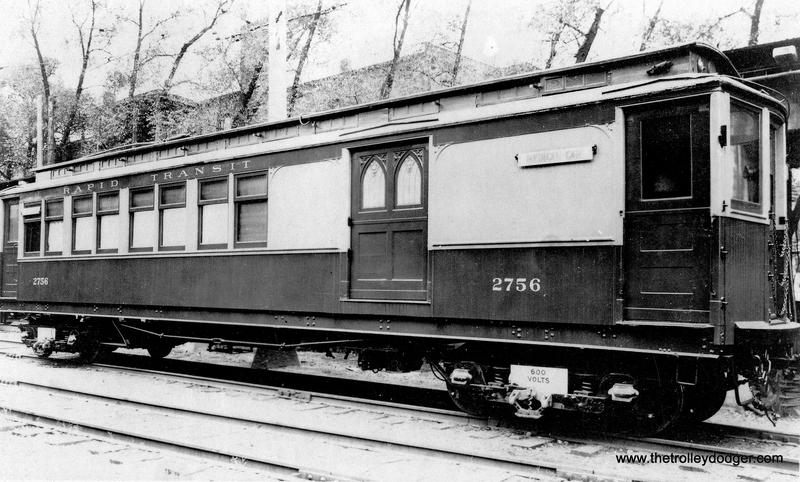 Interesting that it was so interurban-ish, yet was probably never classified as one. 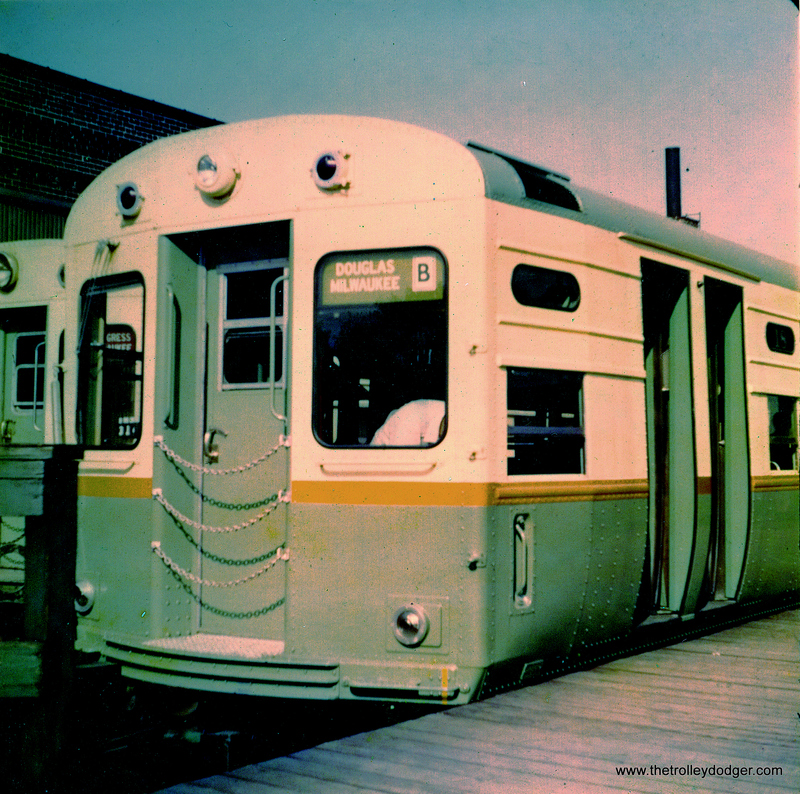 Unfortunately, I never got to ride it before the old cars were replaced. 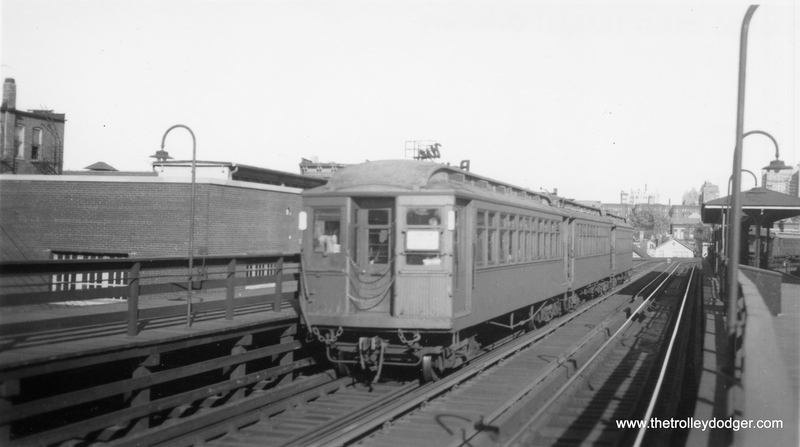 I’d say the Gladstone Branch does retain it’s Interurban look, too a lesser degree. 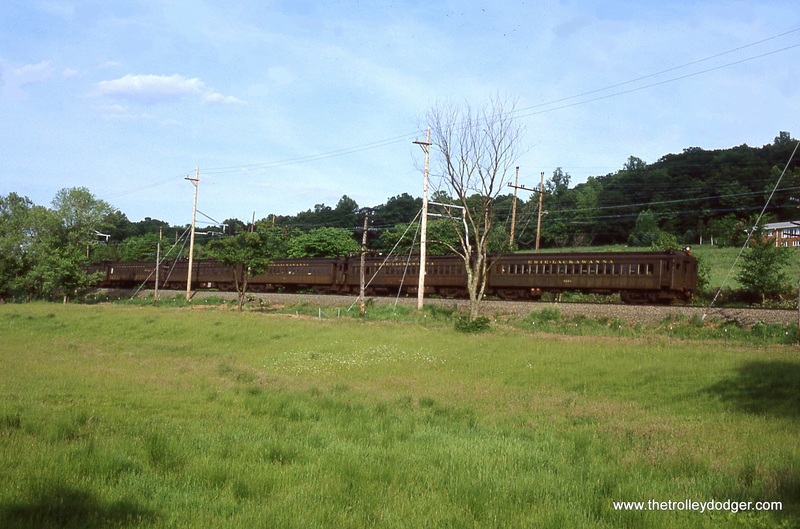 It’s still a single track main line with many passing sidings where, during rush hours, a lot of meets are done. 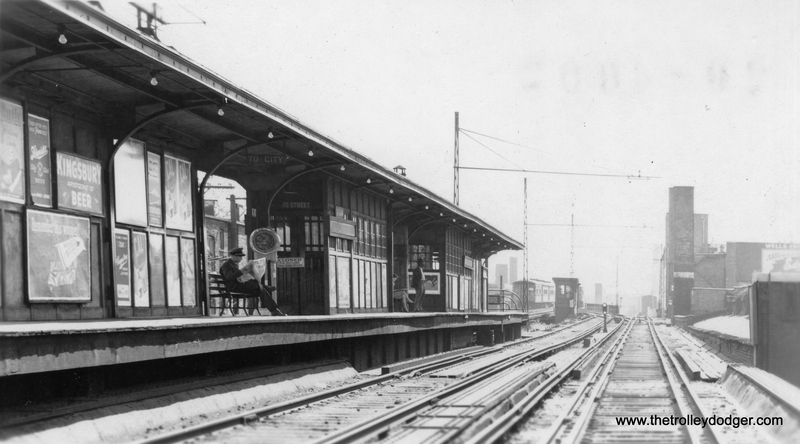 The headways are still rather short between trains and the Gladstone end of the line has not changed all that much. It is an affluent area and land owners like their large estates and are not so willing to sell out for strip malls and housing developments. 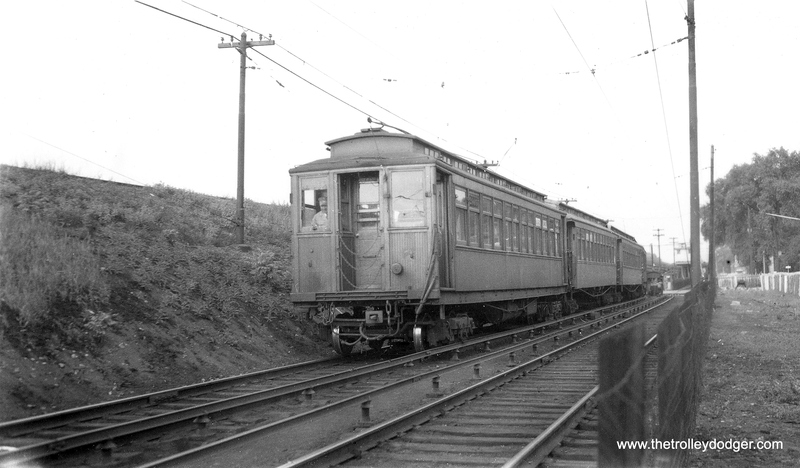 What mostly made me think of Interurban trains on this line were the original Lackawanna RR DC electric MU cars, With their replacement, a good deal of that “charm” disappeared (daily commuters on those cars would most likely disagree). 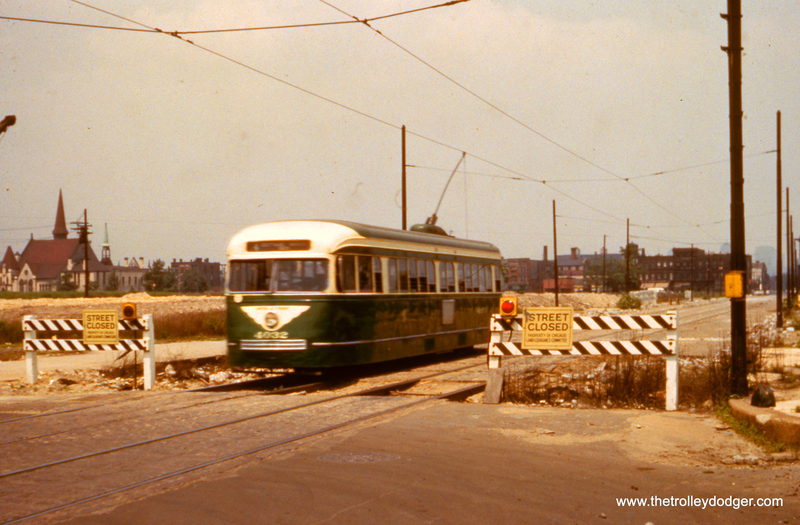 The wooden catenary poles have also been recently replaced with metal ones. 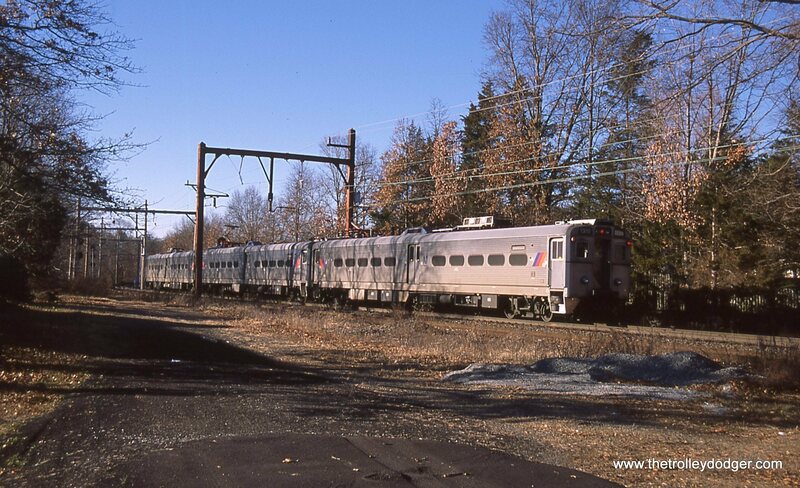 I’ve attached a recent photo of a NJT train of ARROW MUs departing the Far Hills station to show you how it looks now, still somewhat Interurban if you ask me. 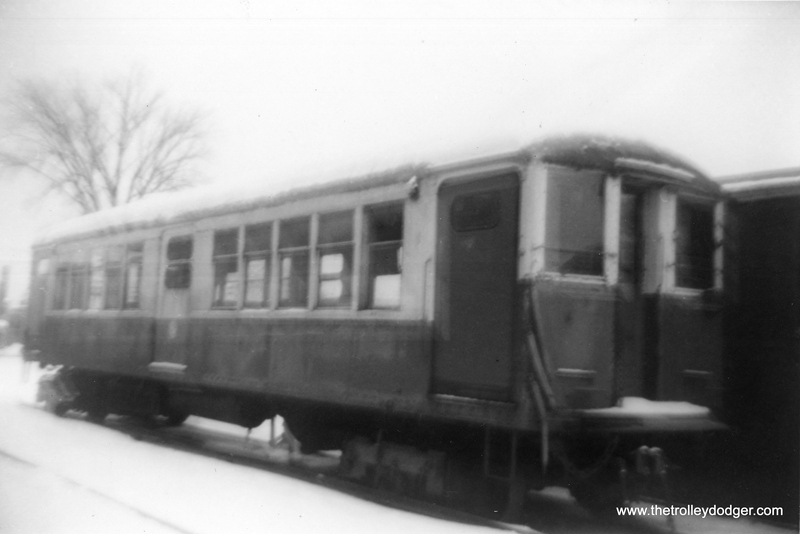 The photo was taken in December of 2014. 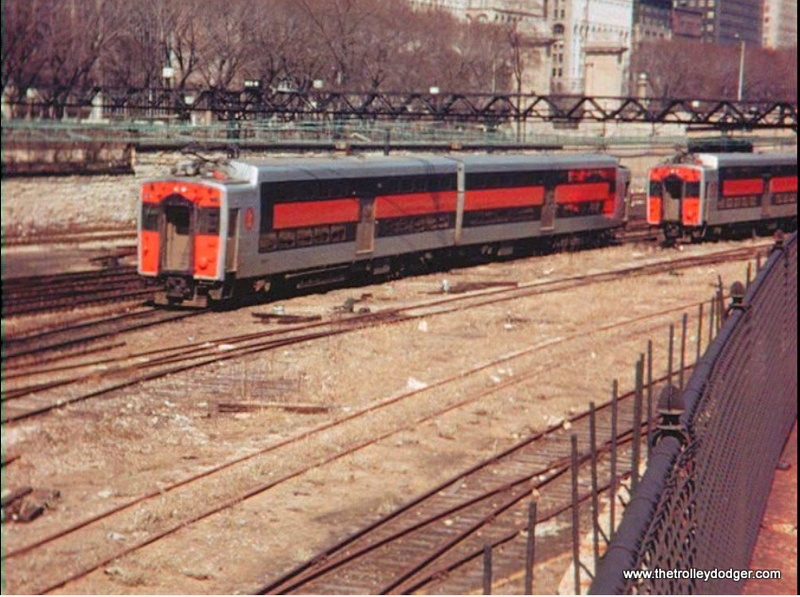 I forgot to attach a photo of the Lackawanna MUs in traction orange. 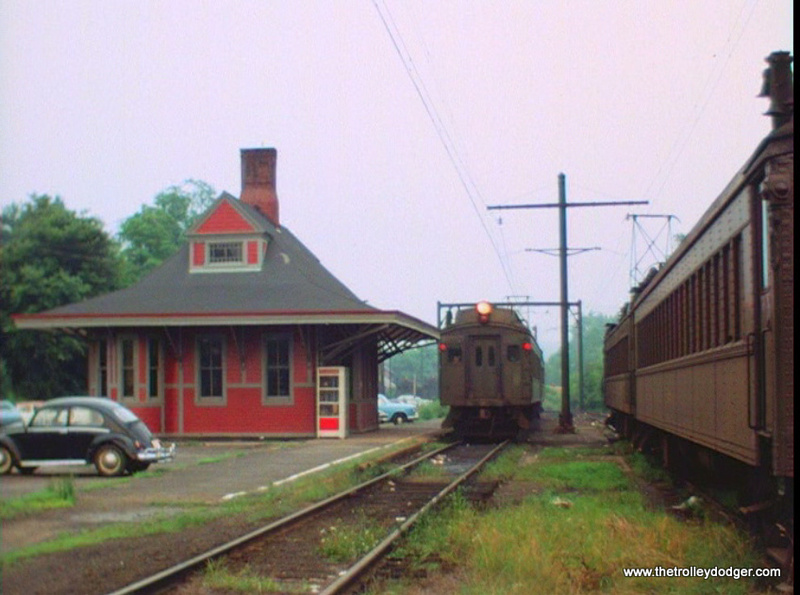 This scene, too me, has a very strong interurban flavor. 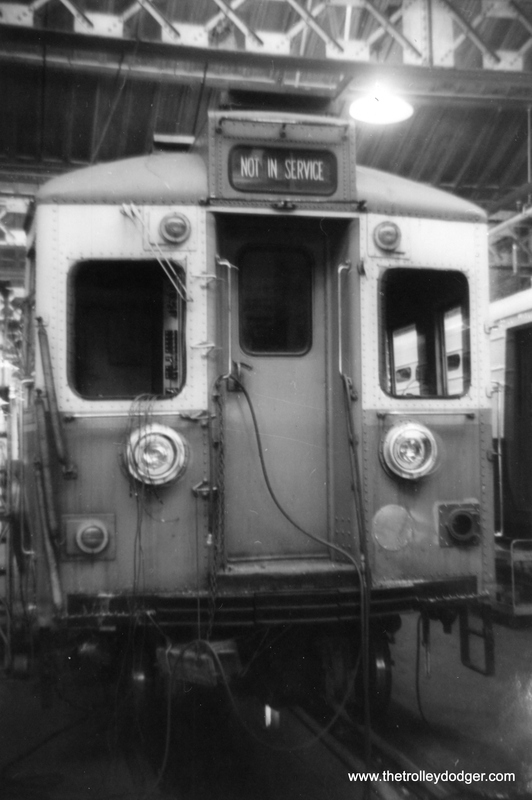 It was taken in the last weeks of DC electric service and the lead MU looks a little rough around the edges, but I really like the shot. 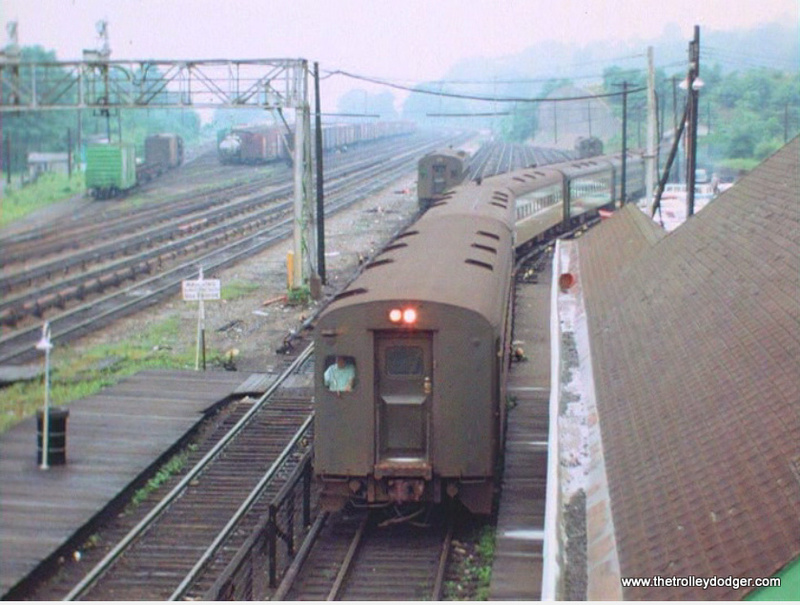 It was taken at Pond Hill Road near Millington NJ on August 23, 1984. 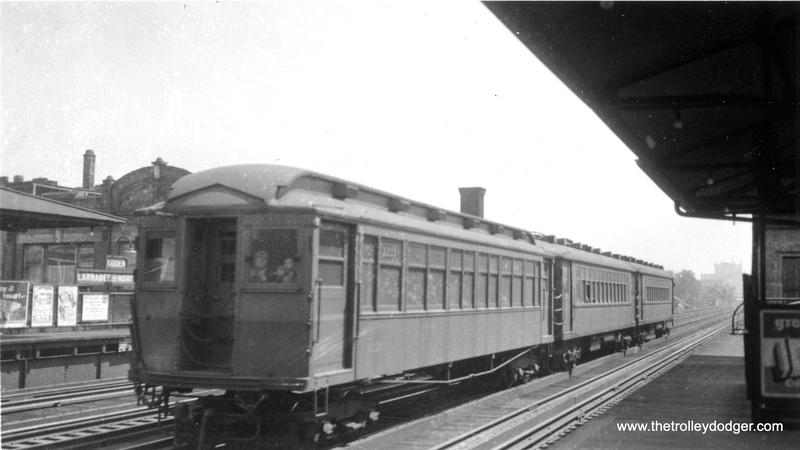 South Shore coach/baggage car # 108 is the last car of a afternoon rush hour train. 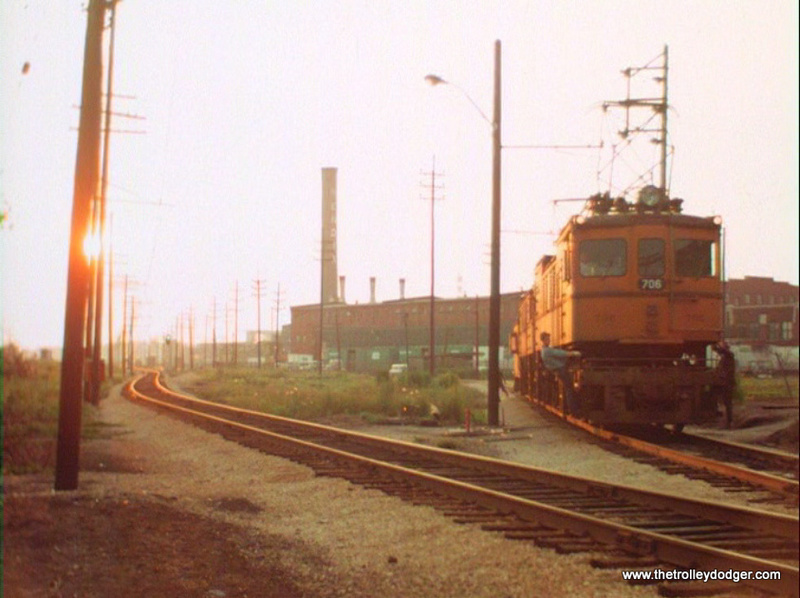 Seen from East Balbo Avenue, Chicago on June 23, 1982. 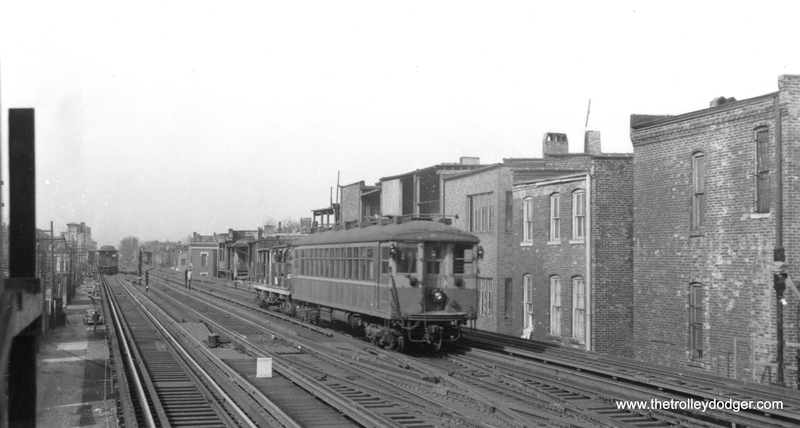 Hoboken sure don’t look like this any more! 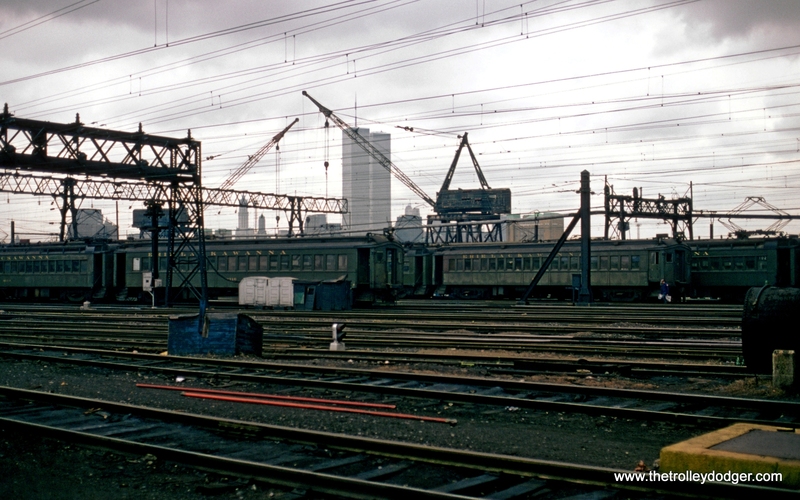 The Ex-DL&W MUs are gone, the cranes along the long slip are gone, and the World Trade Center Towers are gone. 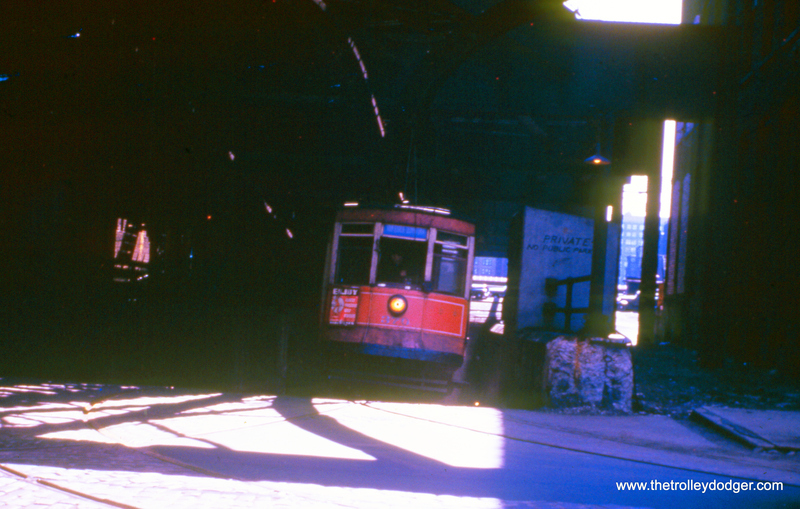 This Kodachrome slide was taken on a gloomy day in March of 1980, just outside of the MU shed. 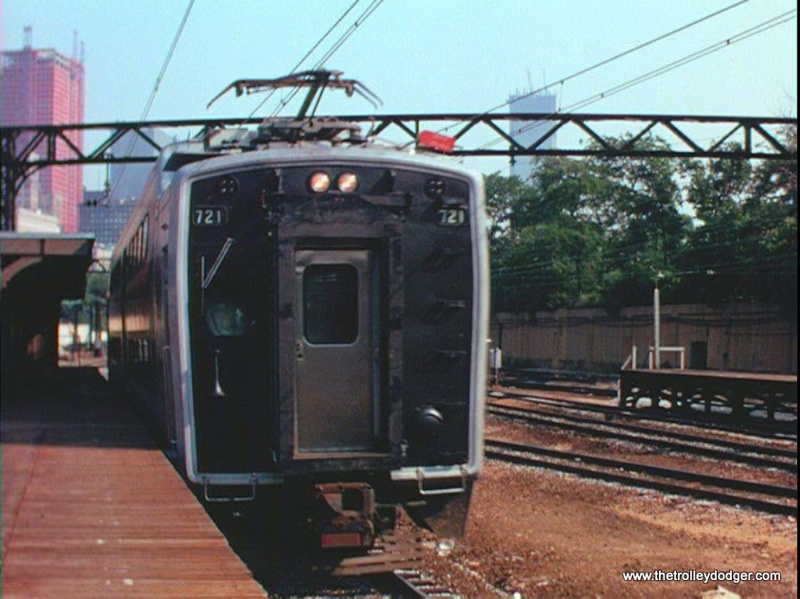 A nice broadside view of an afternoon rush hour Gladstone Branch train of NJ Transit (Ex-DL&W) DC electric MUs. 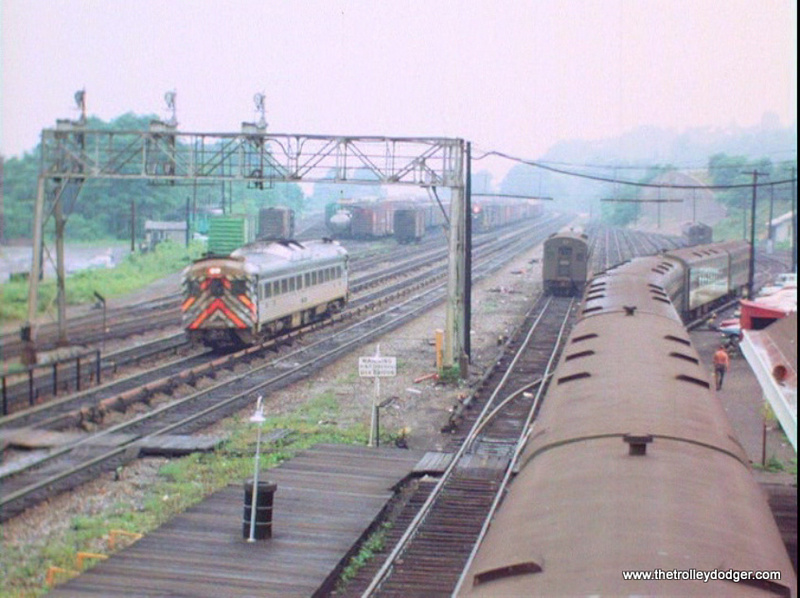 The train is approaching the station stop at Far Hills, NJ on June 2, 1983. 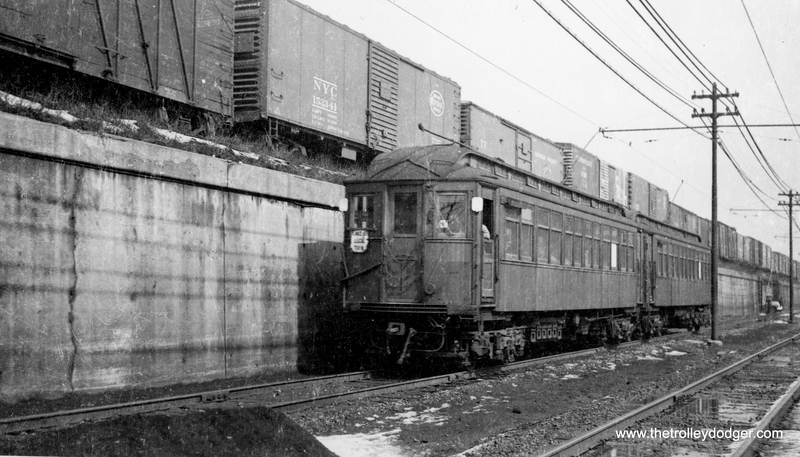 The Interurban RR look of this operation must not have been lost on someone in NJ Transit’s employ. 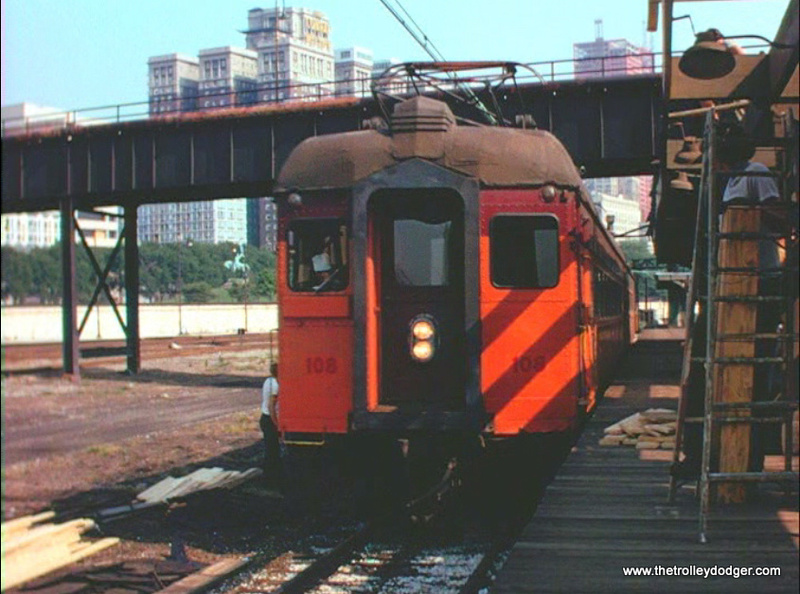 When these cars needed repainting they were not given another coat of olive green paint- NJT painted them in a nice bright paint job of traction orange! 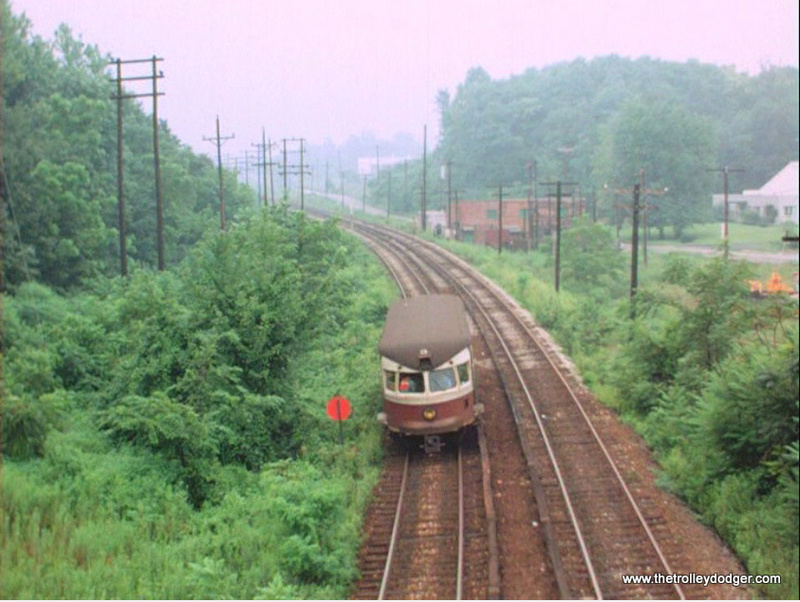 PS- I may be able to shed a little light on the mystery of the Lehigh Valley RR Baldwin switcher under catenary on the DVD. 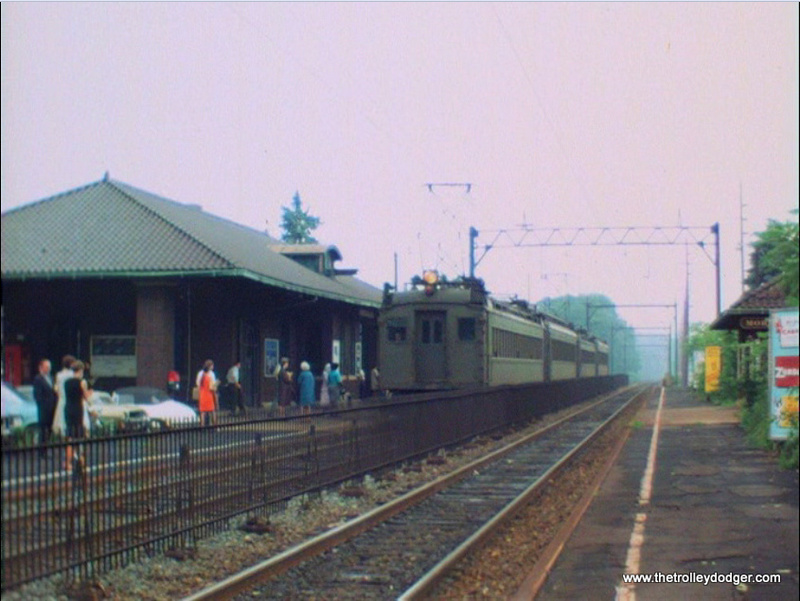 Mr. Wicksall says in the narration that the scene may have been filmed on the North East Corridor in New Jersey. I think that is correct. 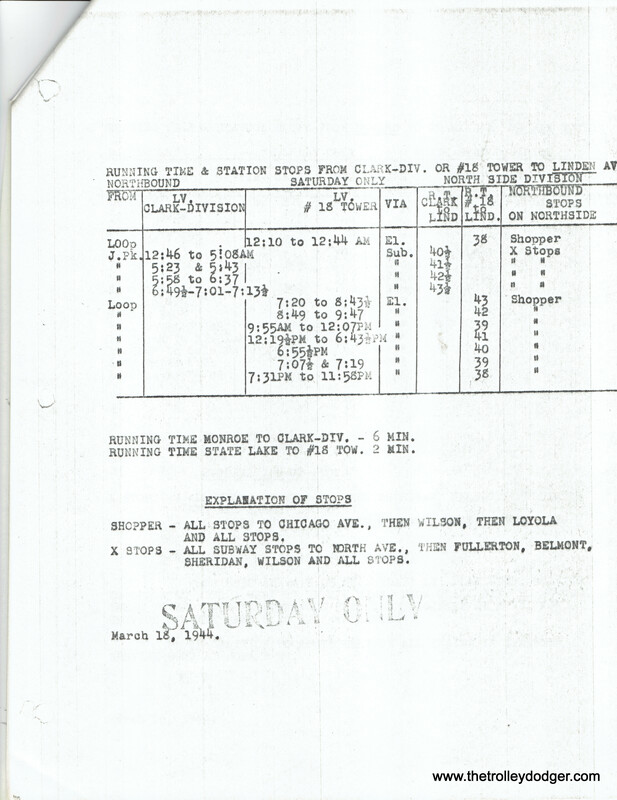 It may have very likely been shot between Edison, NJ (at the time it may still have been called Stelton) and Metuchen. 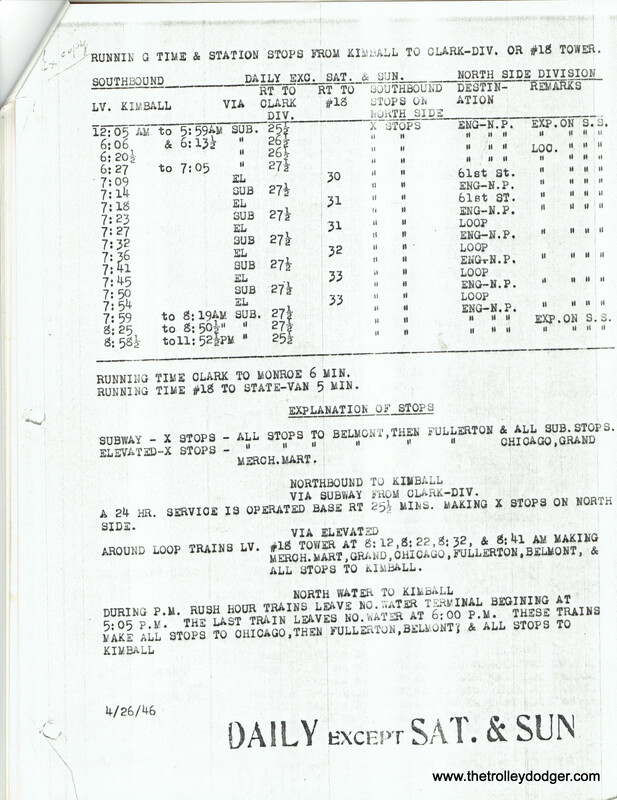 In this area was a former military base called Camp Kilmer. 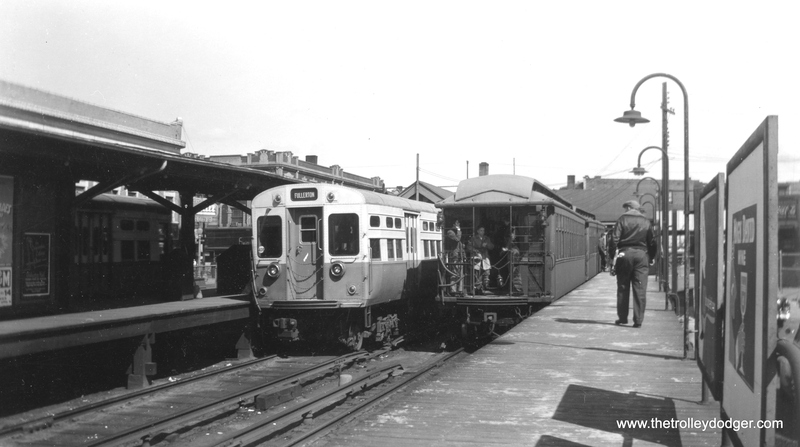 It was served by three railroads, the Pennsylvania (off the mainline), Lehigh Valley (off the Perth Amboy Branch), & Reading (off the Port Reading Branch). 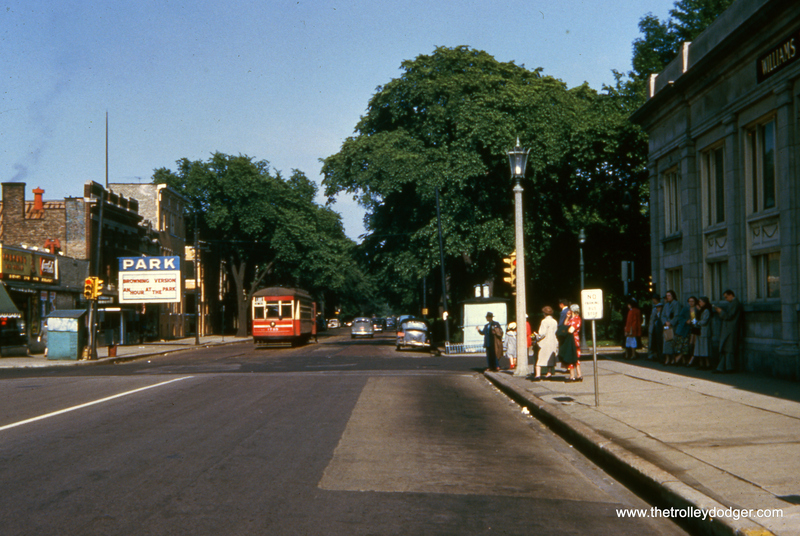 By the 1960s’ when that film was shot the base was closed and the land was being sold off for business redevelopment. 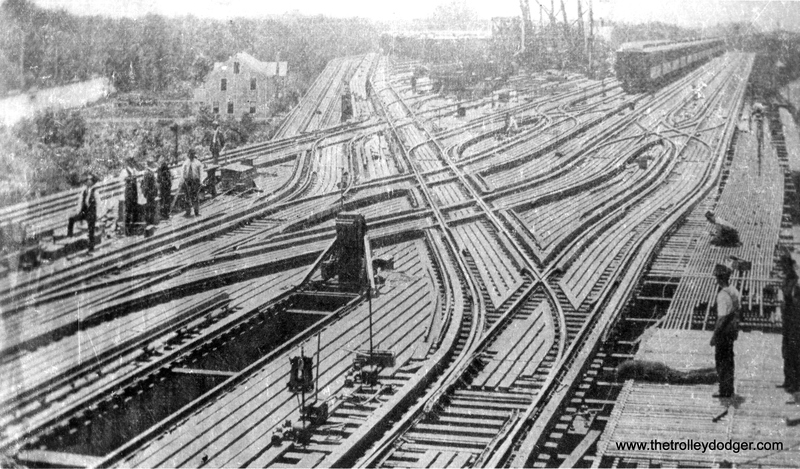 Before this happened some of the base trackage was removed and that may have caused one railroad to use the tracks of another while serving the various industries on the former base property. 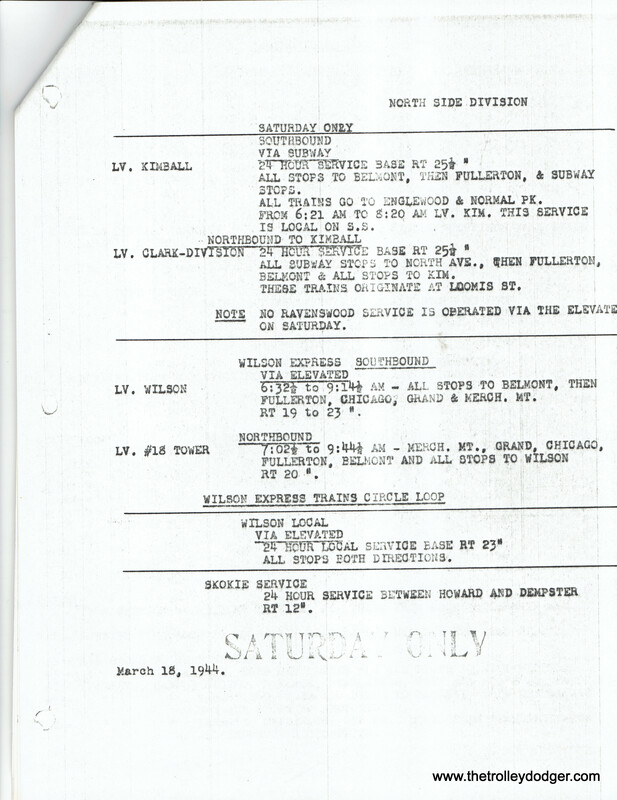 I know the relationship among the competing RRs was not always friendly there. 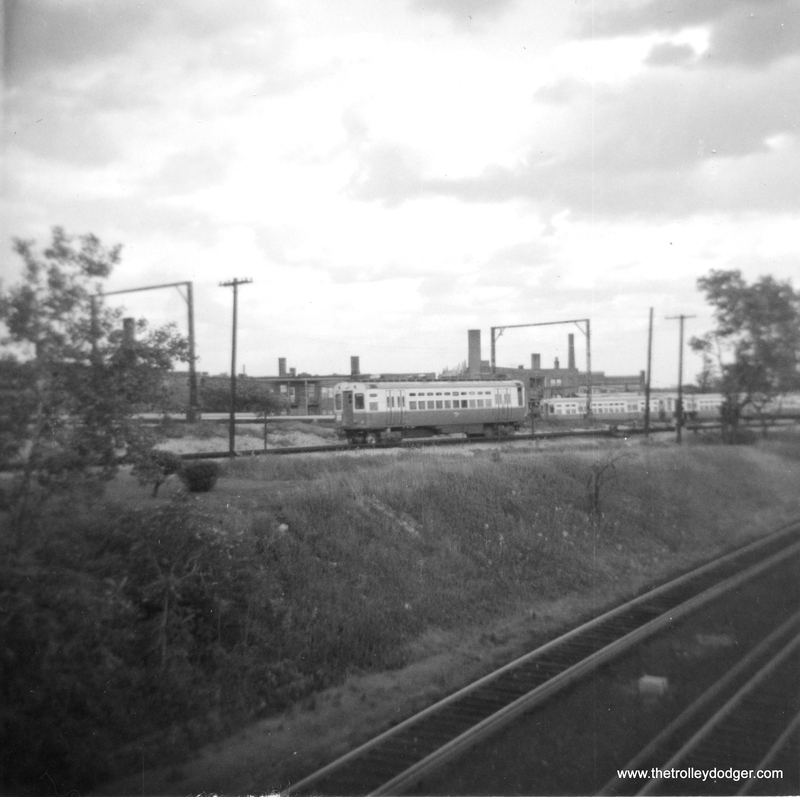 The Penn Central & Reading ended up in court fighting over who had the right to switch a chemical factory located on the Kilmer land. 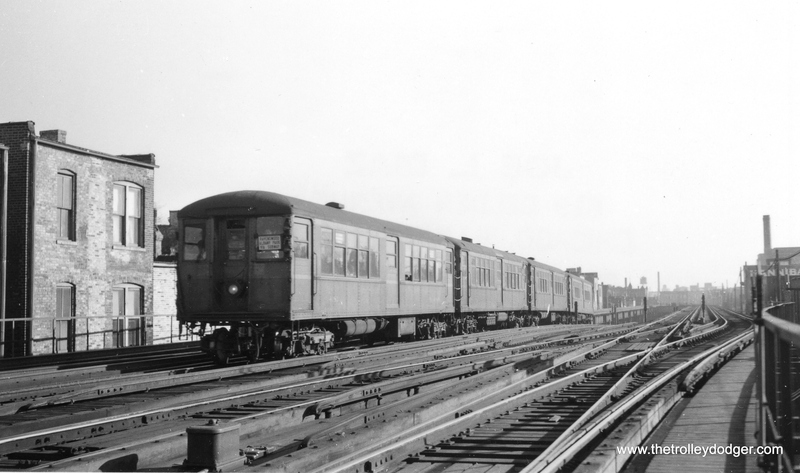 Anyway, that is, in my humble opinion, the most likely reason for the LV train having been seen on PC electric trackage. 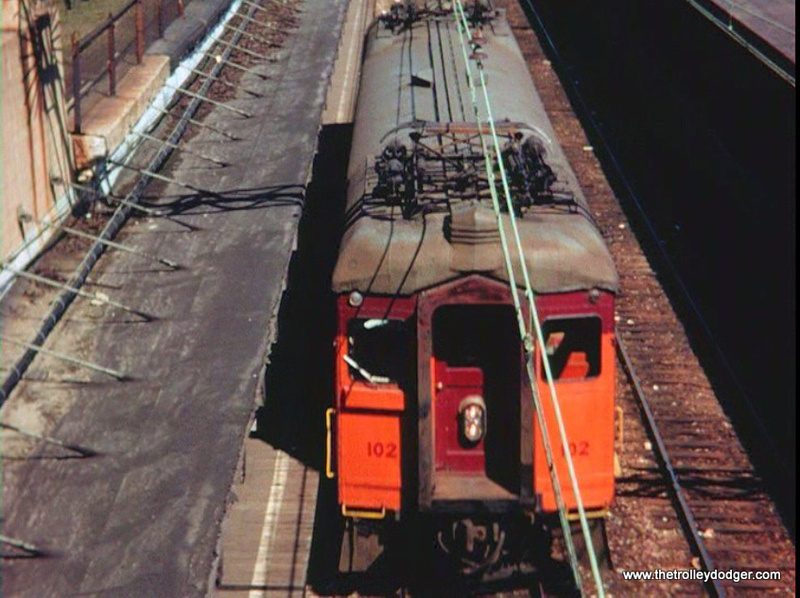 The only other place I know of that LV trains were regularly seen under PRR catenary was at “NK” tower in Newark, NJ where the “Hunter” connecting track linked the PRR NEC to the LV mainline. 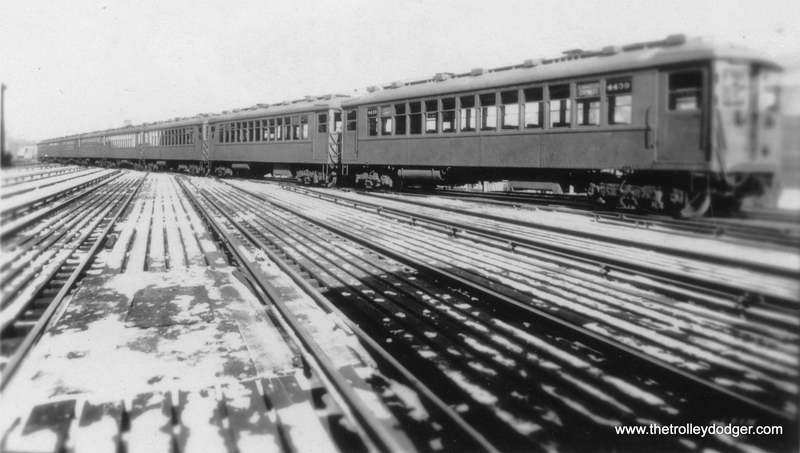 This was primarily a track used in the days of LV passenger service (which ended in 1961). 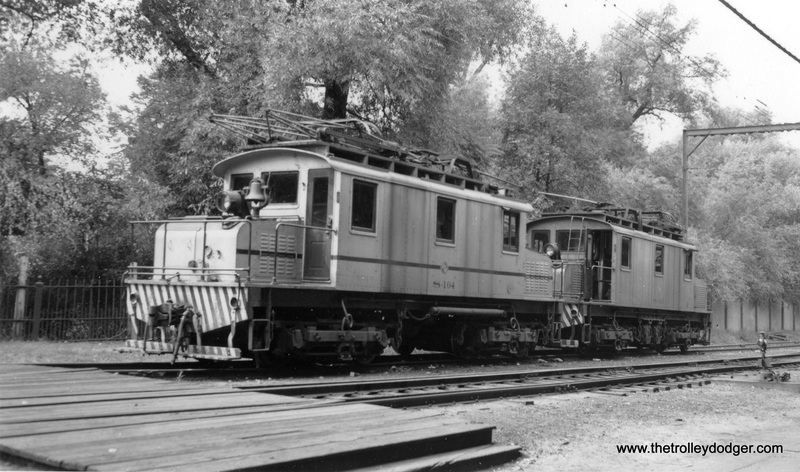 Here LV diesels or steam was changed for PRR GG-1s (and reverse) for the trip into or out of Pennsylvania Station, New York. 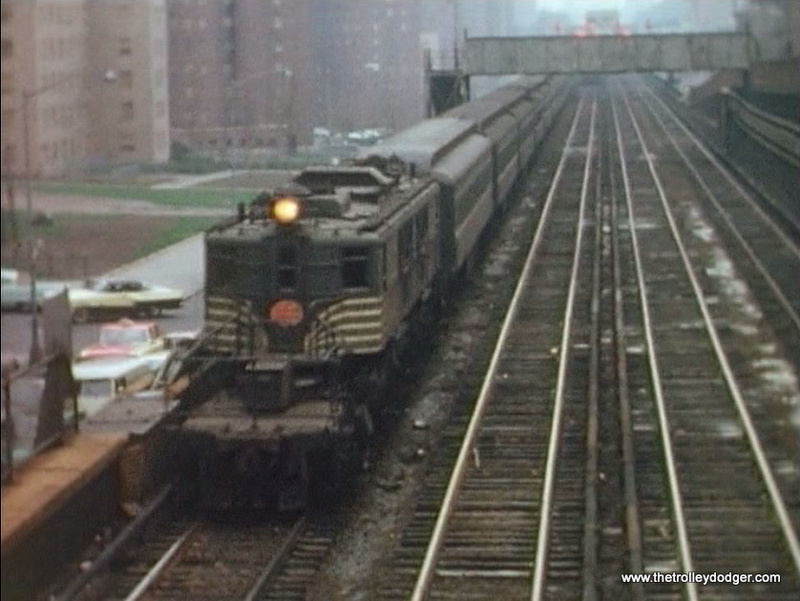 I believe a small amount of freight was interchanged here but the film footage on the DVD does not appear to have been shot here. Thanks! I will forward this to Guy. Hi Dave! Help! 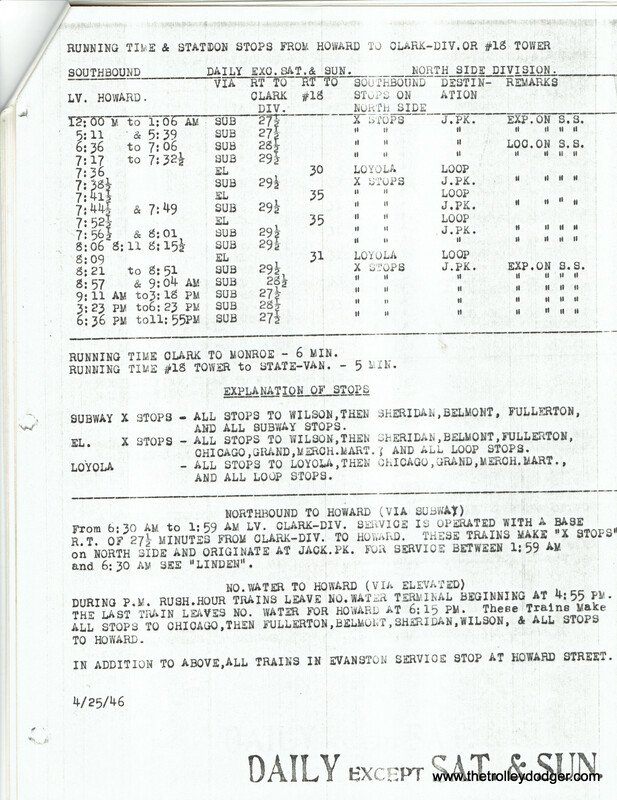 Need your help again. I don’t know what we have here. 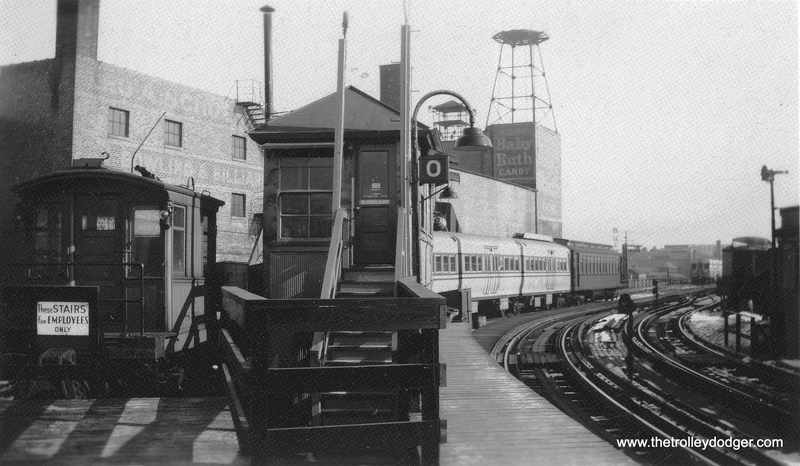 Overall view shows “Cobbs Gap” as it was called years ago. 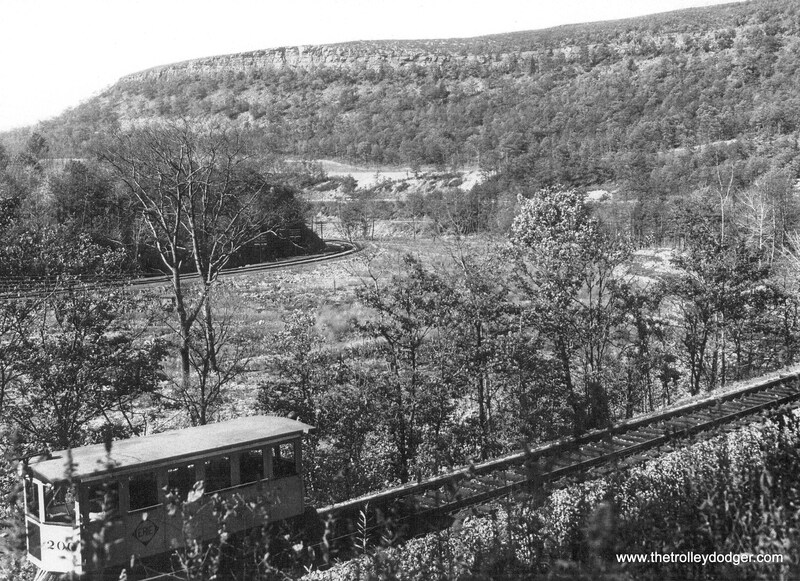 Present day PA Rt 435 runs below the cliffs, known as Greenville Cliffs years ago, in the background. 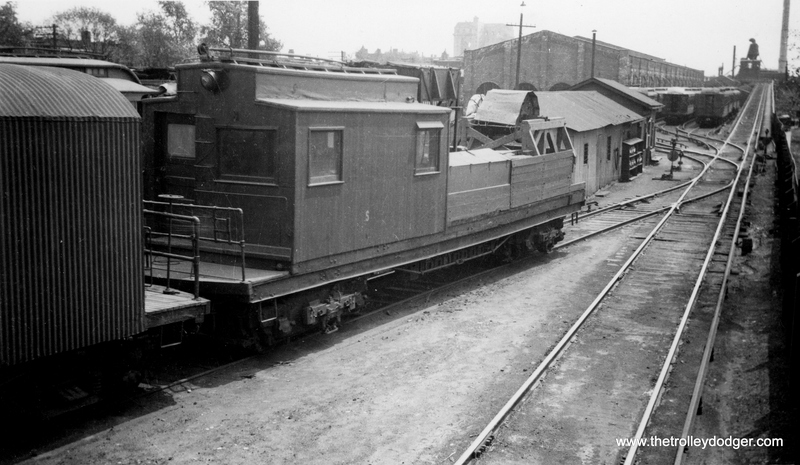 The second photo is a cropped enlargement of the same. 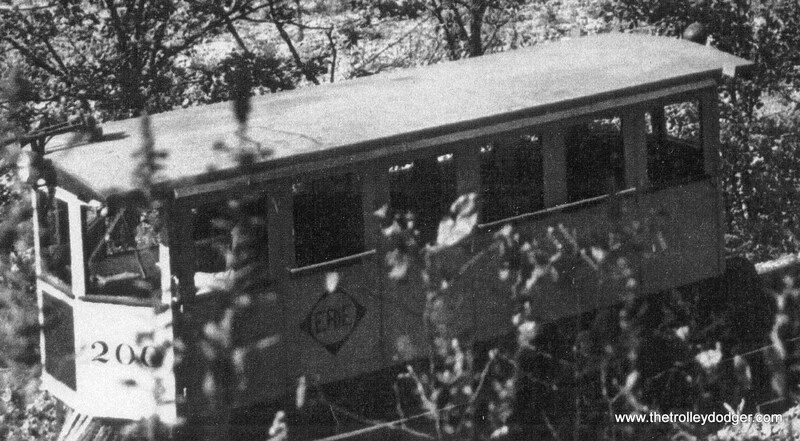 The car has the Erie logo, and the number 200. Thanks in advance. 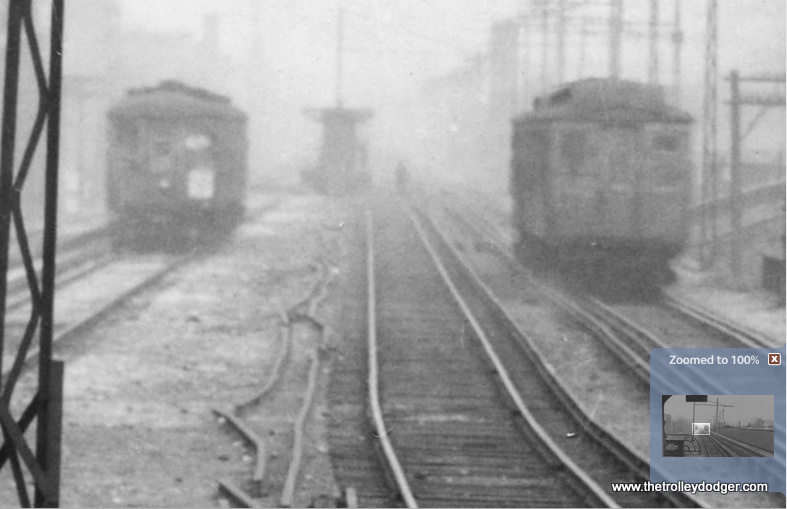 Hopefully some of our readers can shed some light on this mystery photo, thanks. 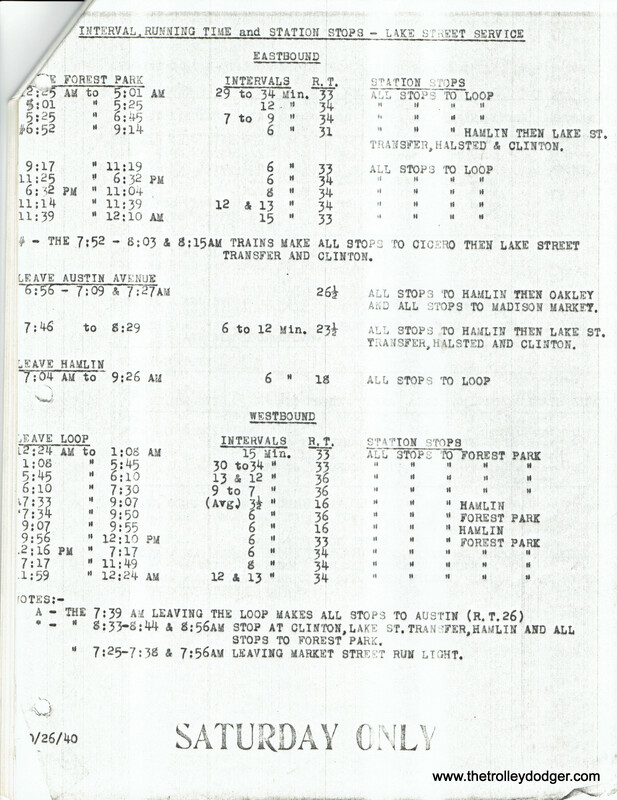 Andre Kristopans recently sent us several scans, including a CTA schedule summary for Westchester trains, fare changes over the years, and CRT schedules as of the CTA takeover. 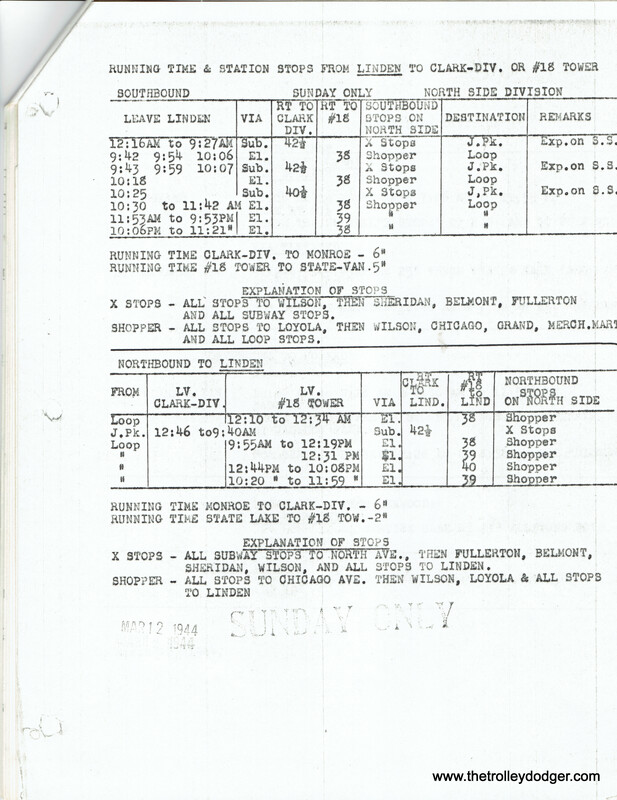 Note Sunday only North-South. 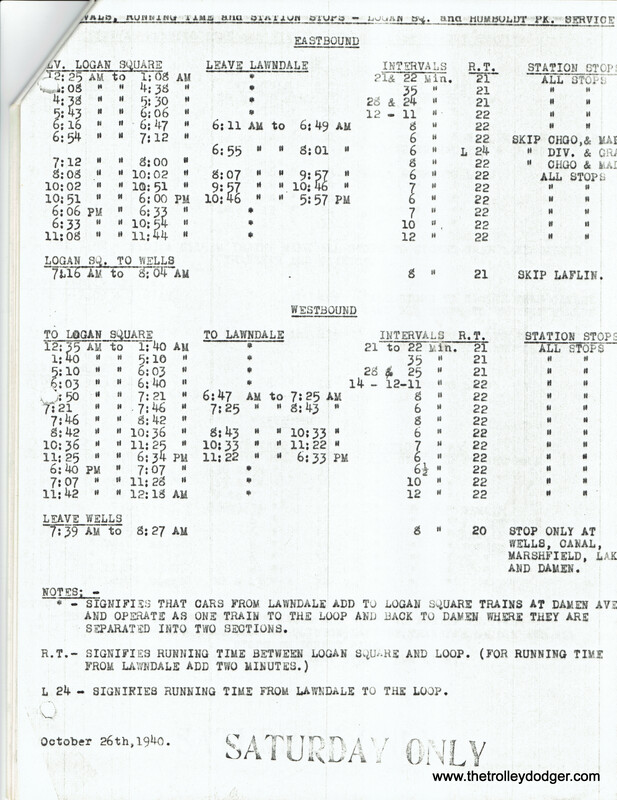 Other routes ran 24 hours terminal to terminal on Sunday. 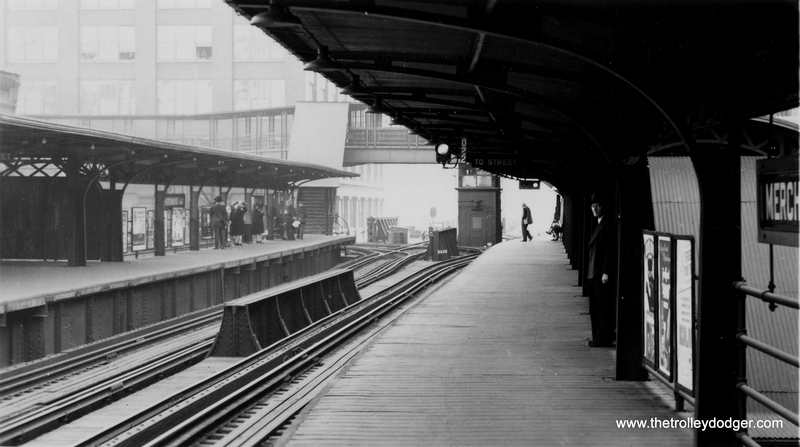 On 10/1/47 CTA raised the fare from 8 cents to 10 cents. 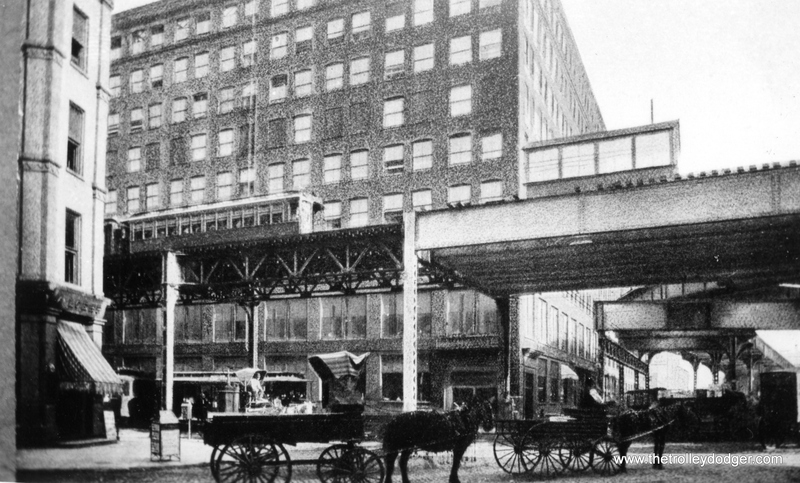 Chicago Motor Coach had already been 10 cents, so now inter-company transfers were free. 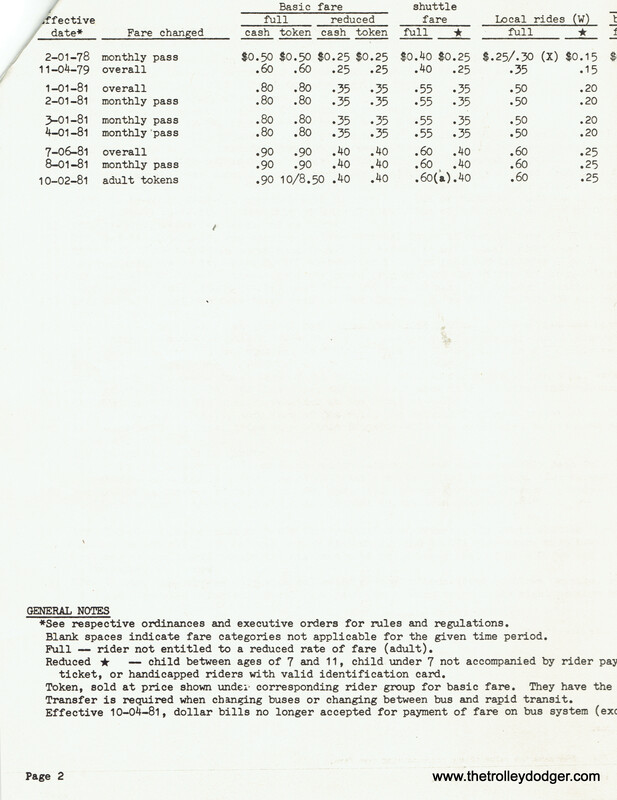 CTA kept raising the fares, to 11c 5/11/48, and 13c 6/20/48, while CMC did not follow to 13c until 9/18/48. 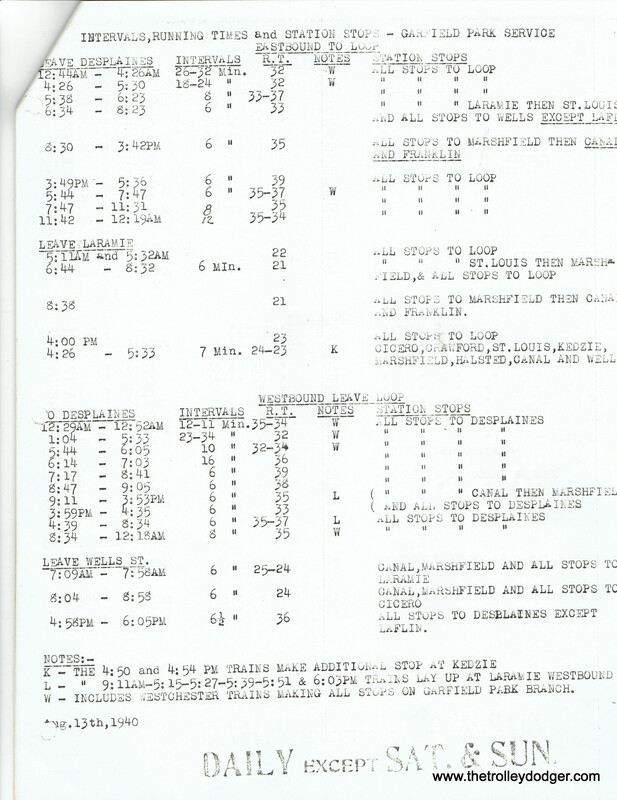 CTA again upped to 15c 10/15/49, while CMC did not follow until 11/8/51, but then CTA again went up, to 20c 6/1/52, which CMC did not match. 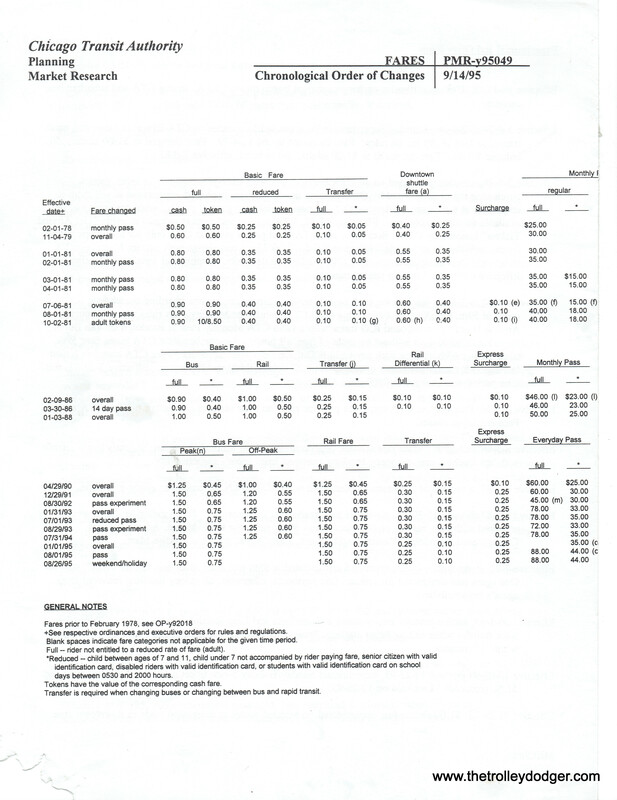 So much of the time, CMC fares were LOWER than CTA. 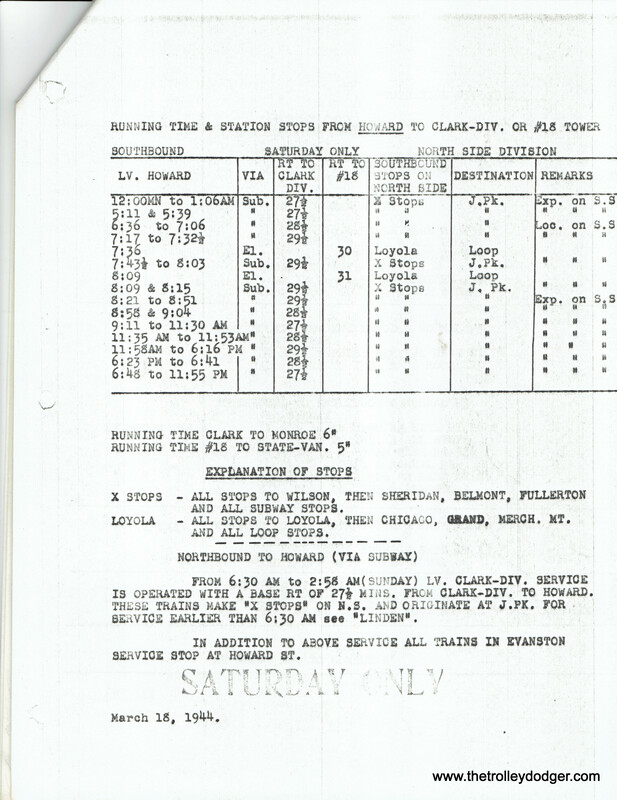 Transfers were free until 7/23/61, then charge 5 cents. 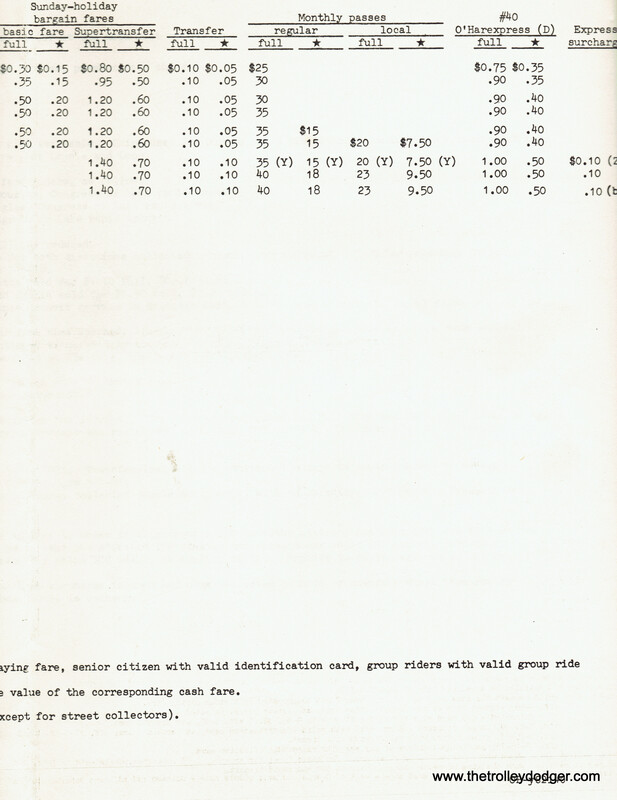 Went up to 10 cents 7/8/70. Thanks. 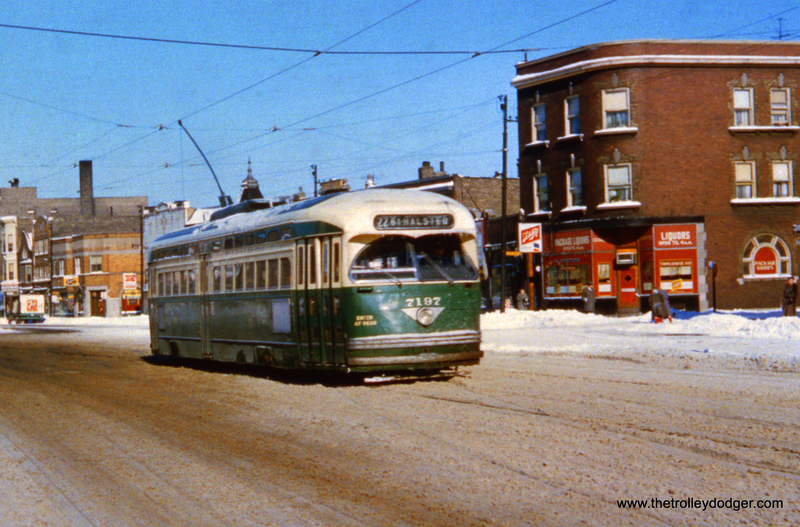 So, in 1952 if you transferred from CMC to CTA, you had to pay a nickel? Yes indeed! 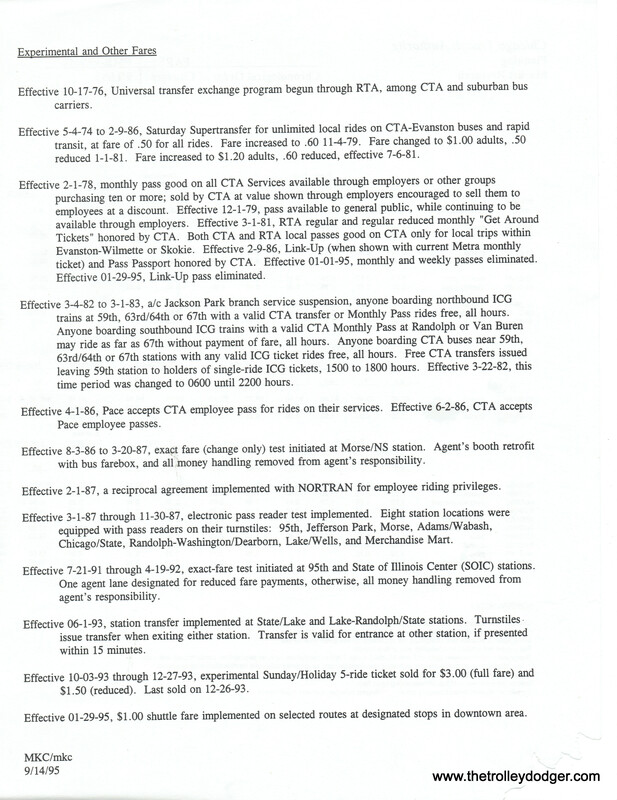 Additional amount was, as far as I can tell, paid to the receiving agency, in this case the CTA bus driver. 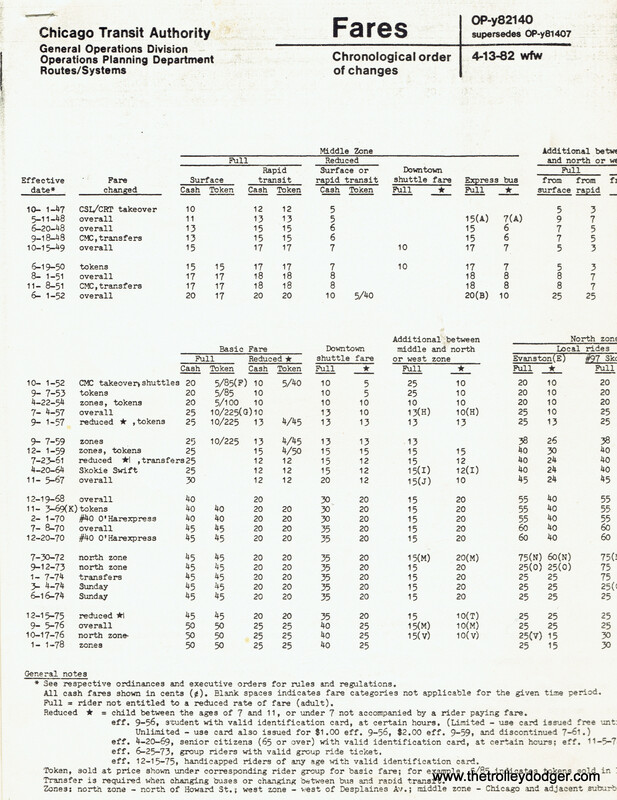 But you can tell that towards the end, passengers were probably not too happy with this, because until 10/1/47 the extra fare was the other way! 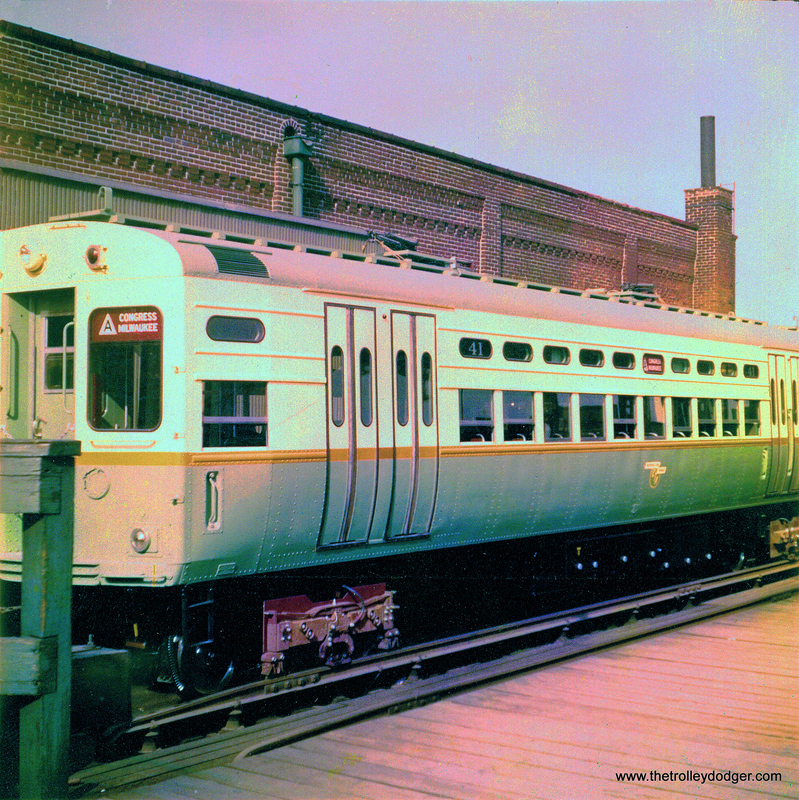 This is our 164th post, and we are gradually creating a body of work and an online resource for the benefit of all railfans, everywhere. 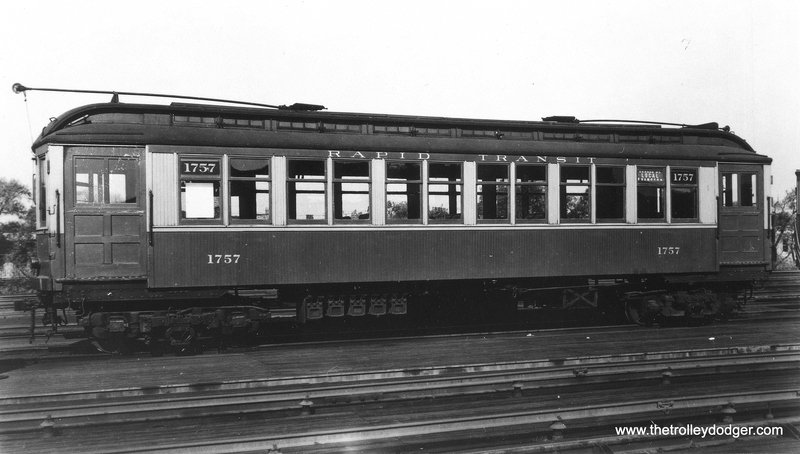 To date, we have received over 213,000 page views, for which we are very grateful. 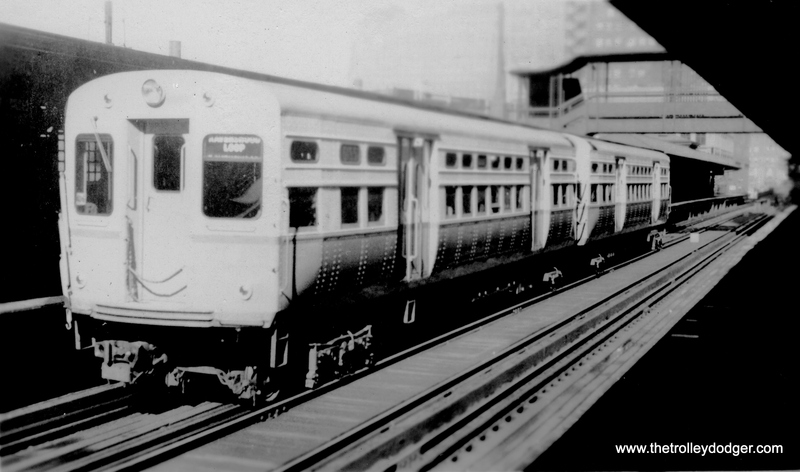 South Shore Line car 102 in downtown Chicago. 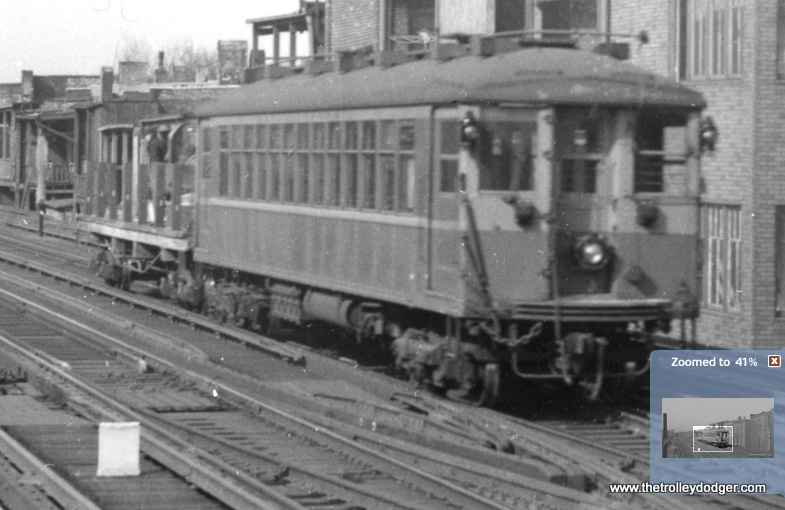 You probably have not ever heard of Guy J. Wicksall before, but he has been shooting movies of trains for a long time now. 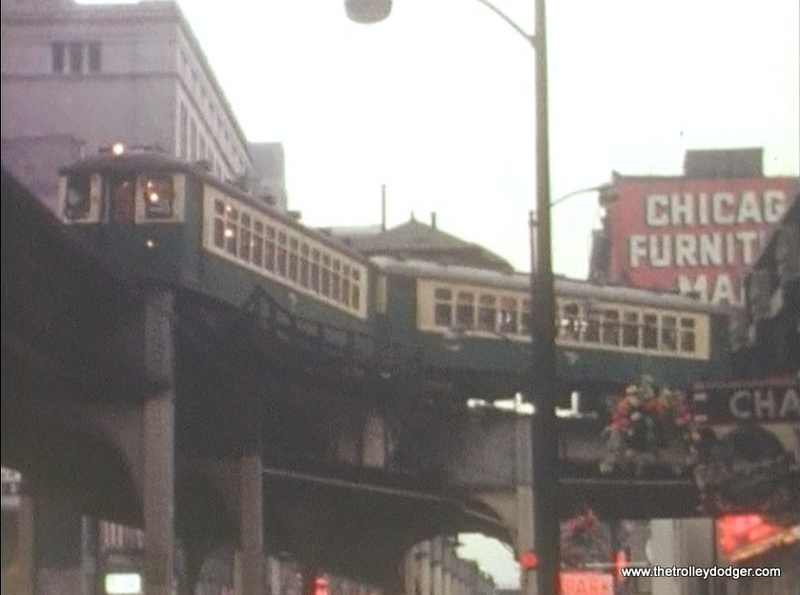 He recently had some of his rare 16mm color films converted to video. 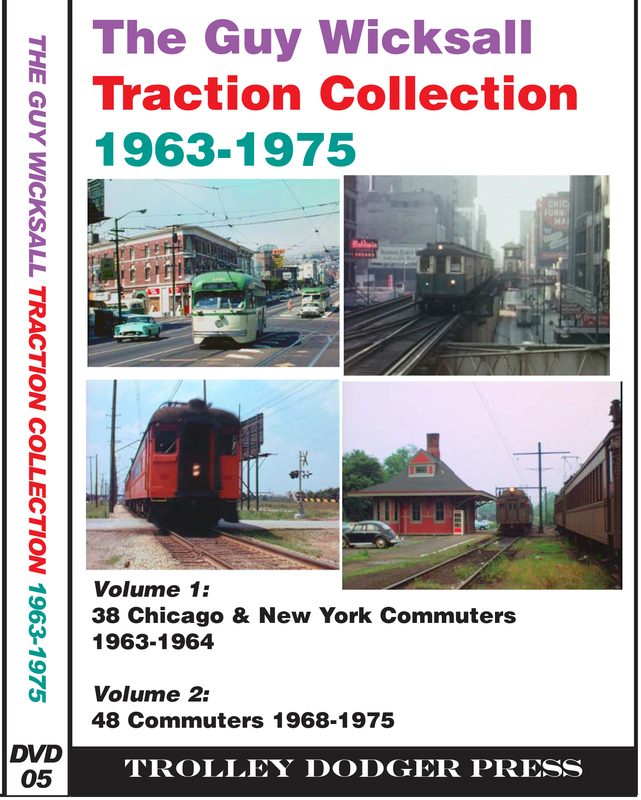 By special arrangement with the photographer, we are now able to offer our readers The Guy Wicksall Traction Collection (1963-1975) on DVD (details below, at the end of this post). 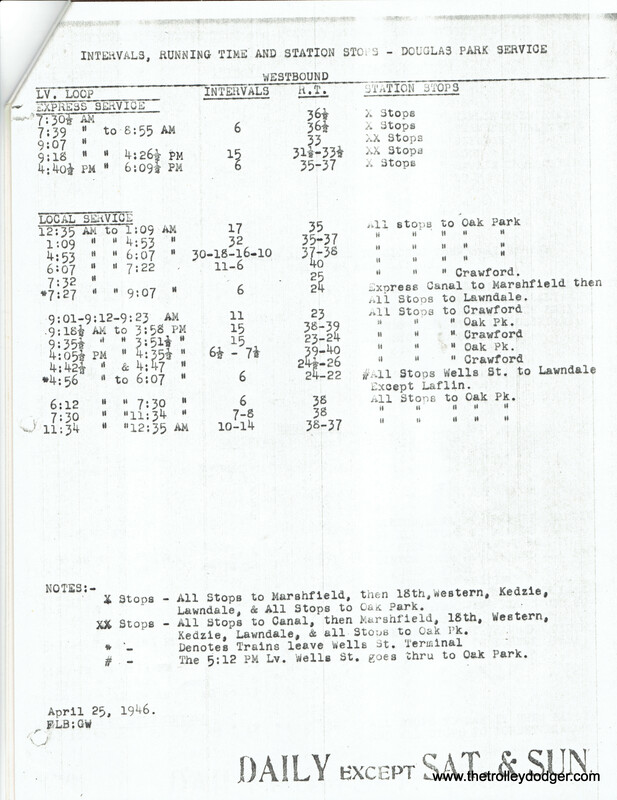 All the photos in this post are screen grabs from the Wicksall Collection. We figured the best way to introduce these films to you would be to go to the source, and discuss them with Guy himself. Here is an edited transcript of my conversation with the man behind the movies from October 10, 2016. 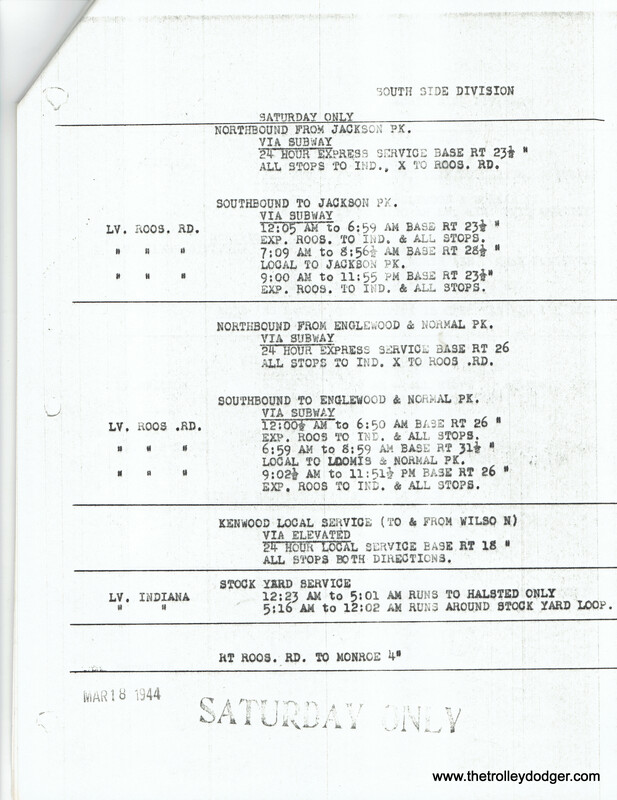 Mr. Wicksall is now 81 years old and lives in the Finger Lakes area in upstate New York. 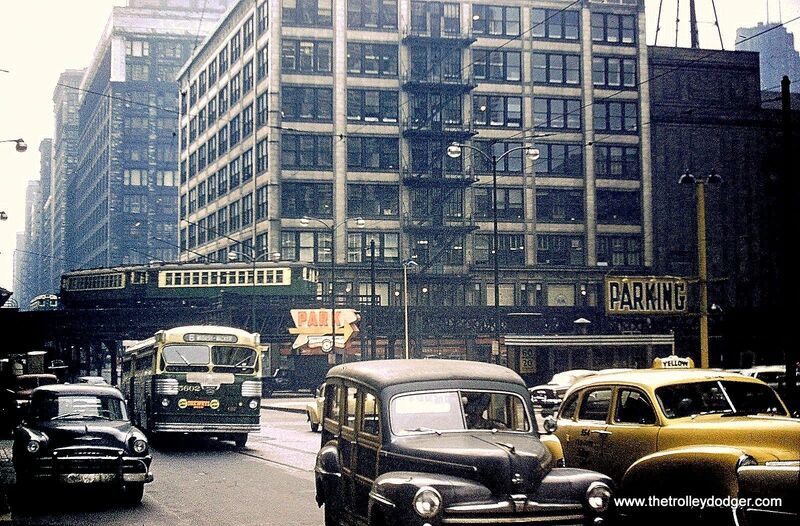 I started making movies in 1960. I have right now, some 59 DVDs. If I could ever get the money together, I have enough material for another 30 or 40. That’s pretty incredible. What subject matter would most of them be? 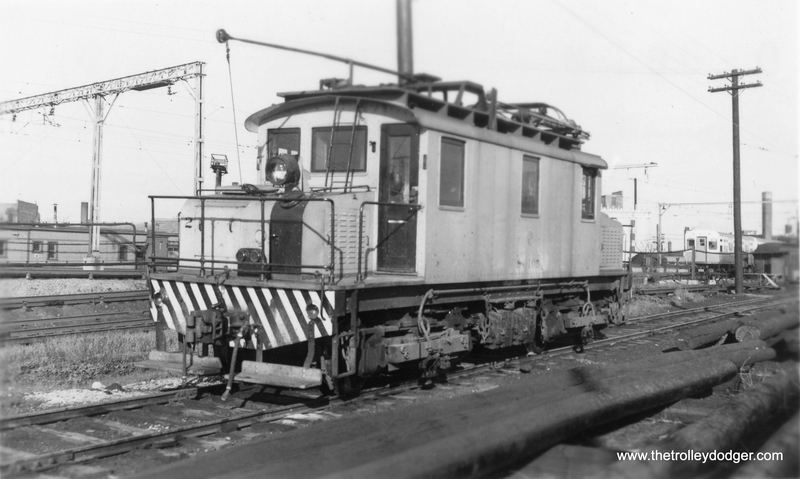 Most of it is anything that ran on steel rails (laughs), there are a few exceptions, I have a few of the aerial cable ways in Switzerland. 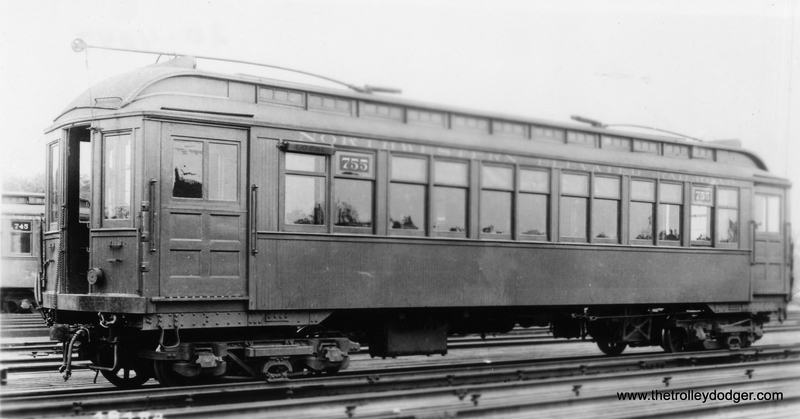 I have a real short piece, a 15-minute piece, on the Minnesota Transportation Museum trolleys. 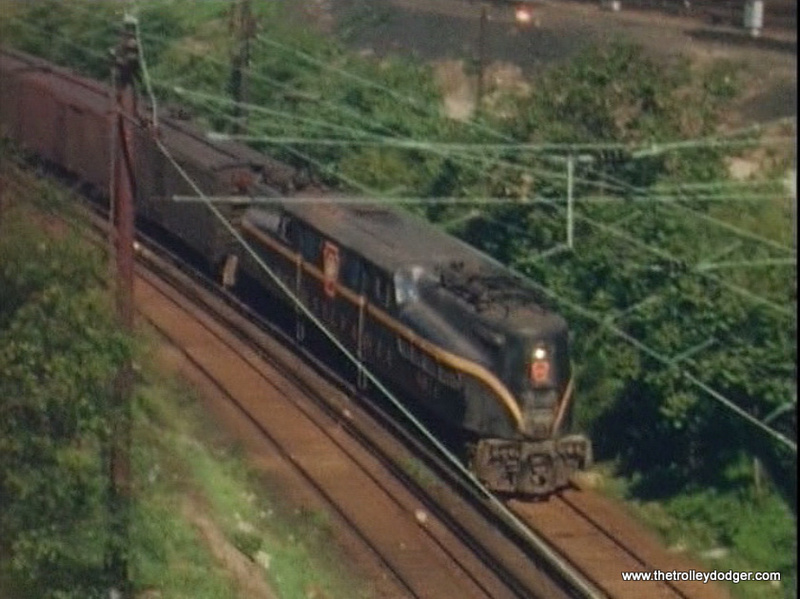 And what percentage of your film footage would you say is devoted to electric traction? Oh, probably 5 percent, maybe as much as 10 when you count in the European stuff. 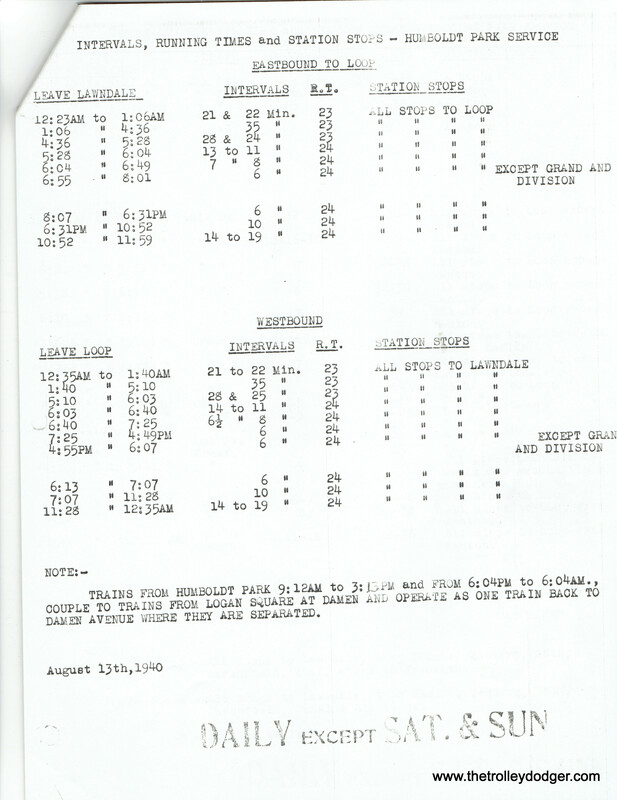 And was it all 16mm that you shot? Not all of it. 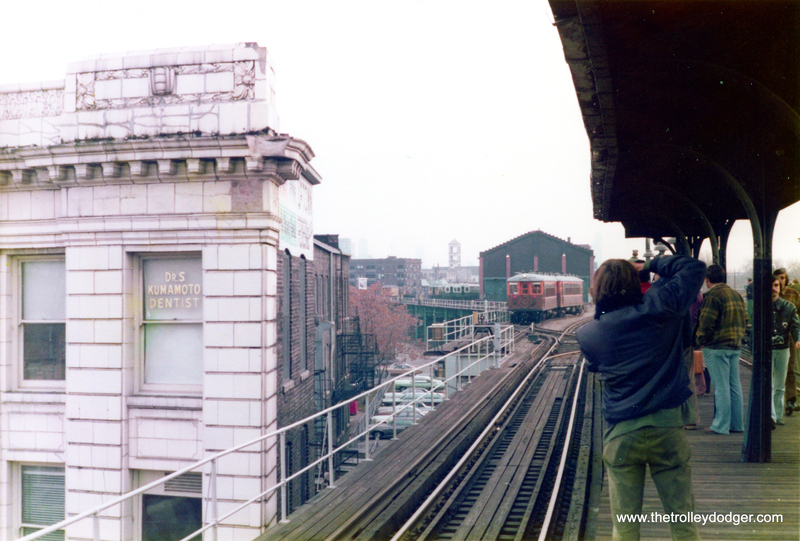 The first few years I was shooting 8mm. 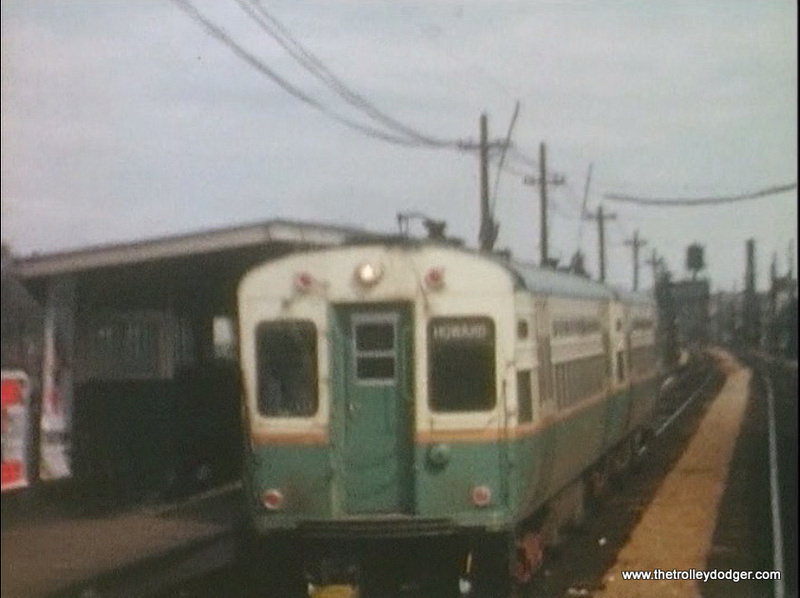 When Kodak came out with their Super 8, my local photo shop loaned me a sample of Kodak Super 8 film, and I looked at that, and compared it with the 8mm, and decided that the 8mm wasn’t suitable, and the Super 8 wasn’t any better, so I changed at that time to 16mm. 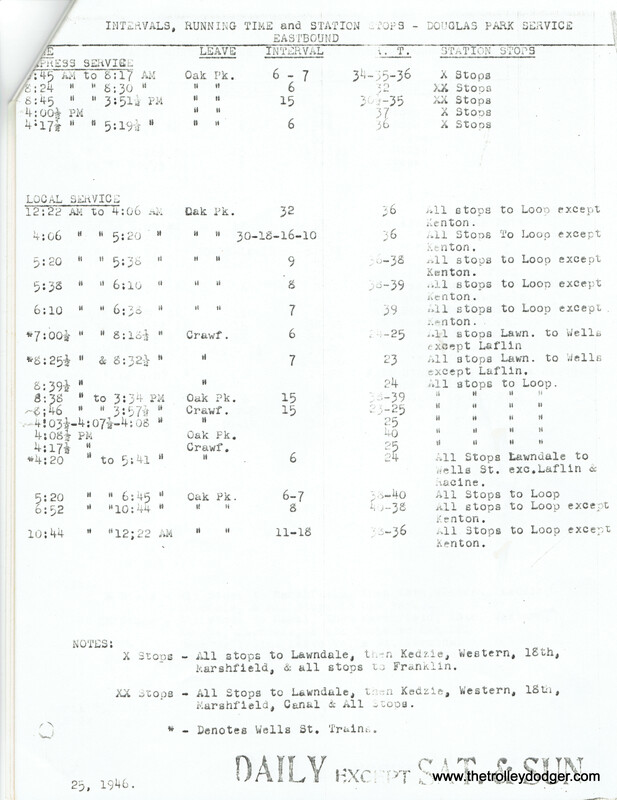 And how much larger is the 16mm film area that the 8mm? Oh, well, it’s at least four times the area. 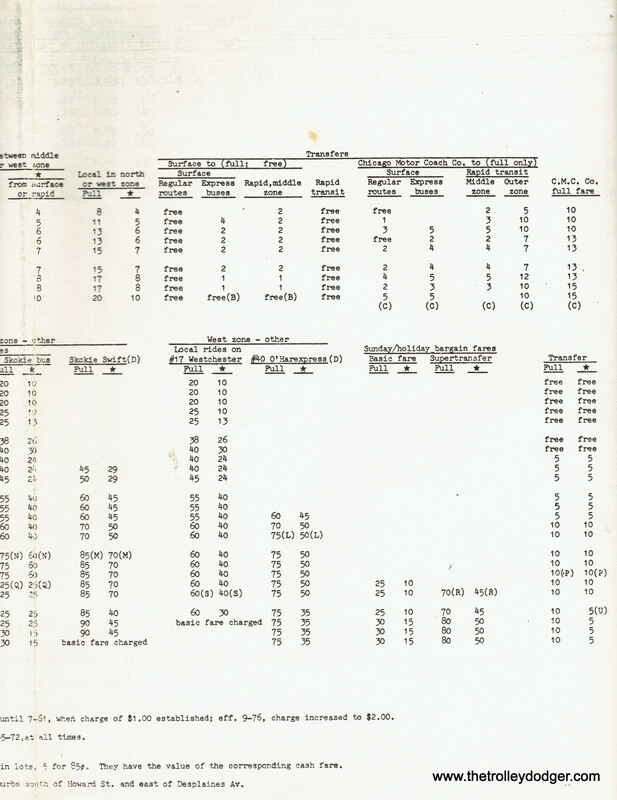 That makes a tremendous difference as far as the quality is concerned. 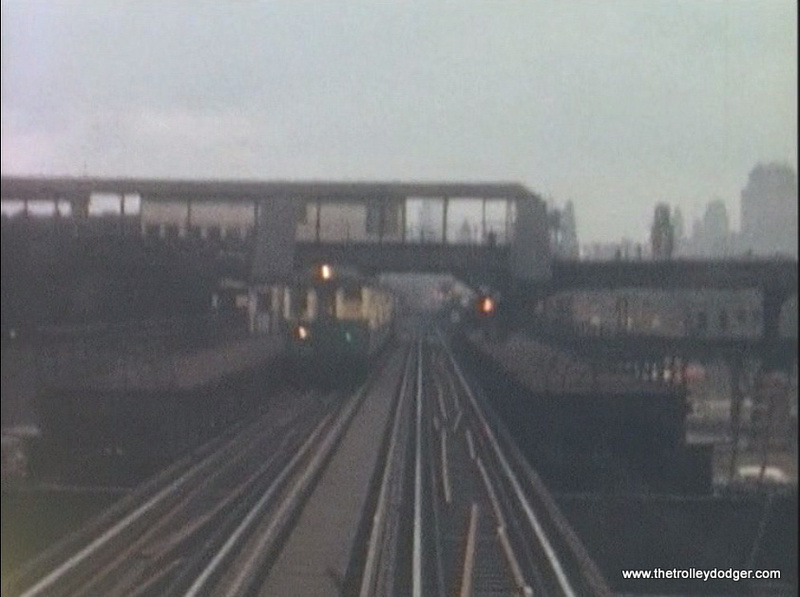 I’m very pleased with the excellent quality of the films that you made, because I am used to seeing videos made up from 8mm, where the picture is so fuzzy that if you made a screen shot of it, you’d hardly know what it was a picture of. Right. I know what you mean. 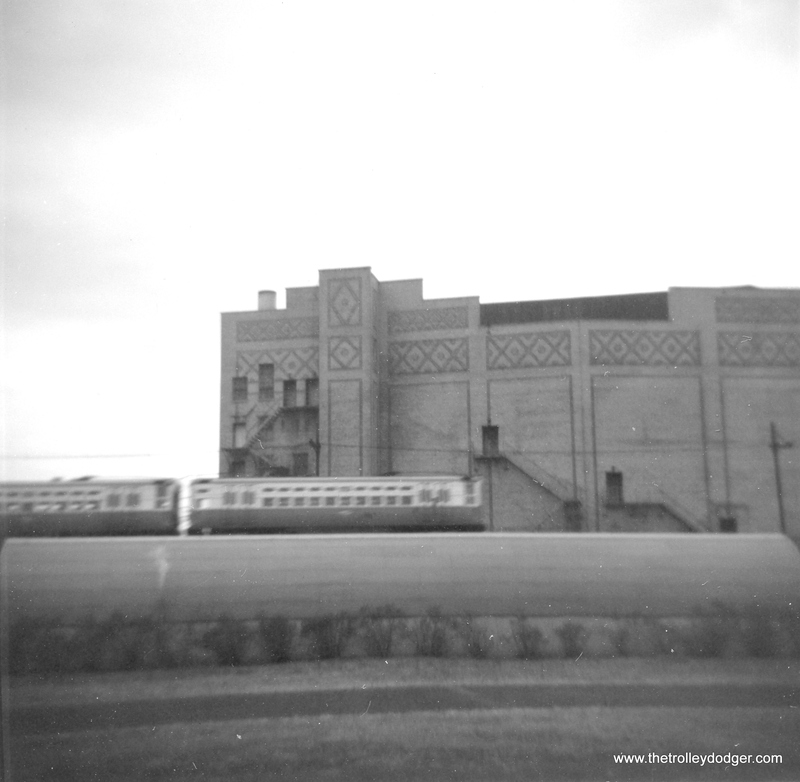 And, talking with people, it seems that the Super 8 got worse as the years went by. They tried to push the speed, it hurt the quality of the image. 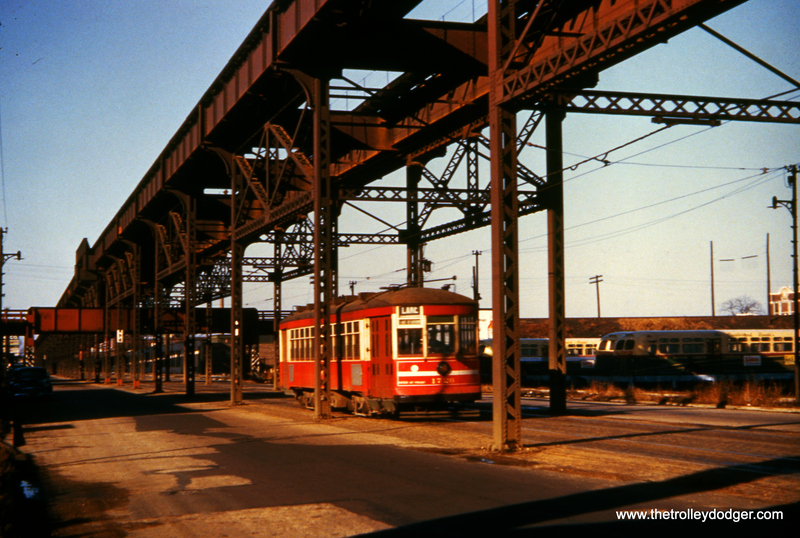 Was it Kodachrome or Ektachrome, or both? 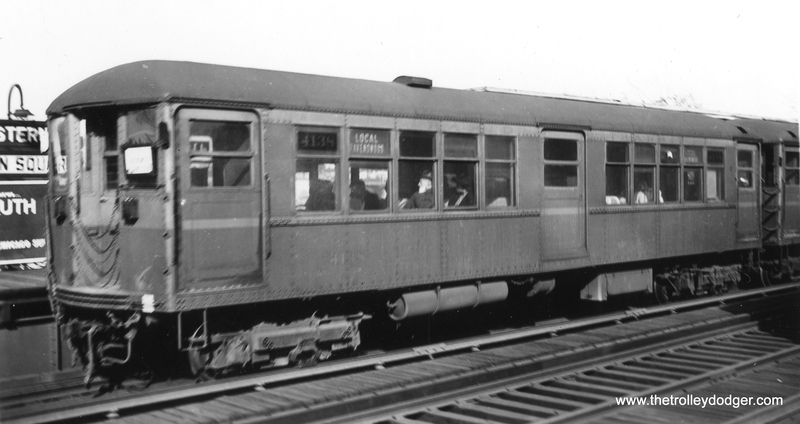 What was the film speed back then? Well, I started out with 25 ASA, and I think I got to 64 at some point. 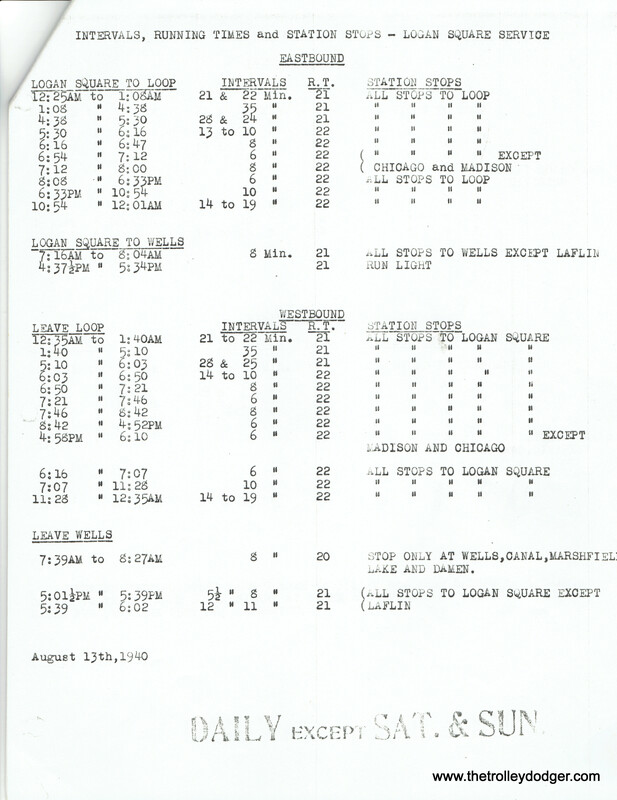 And what kind of film was available for 16mm? 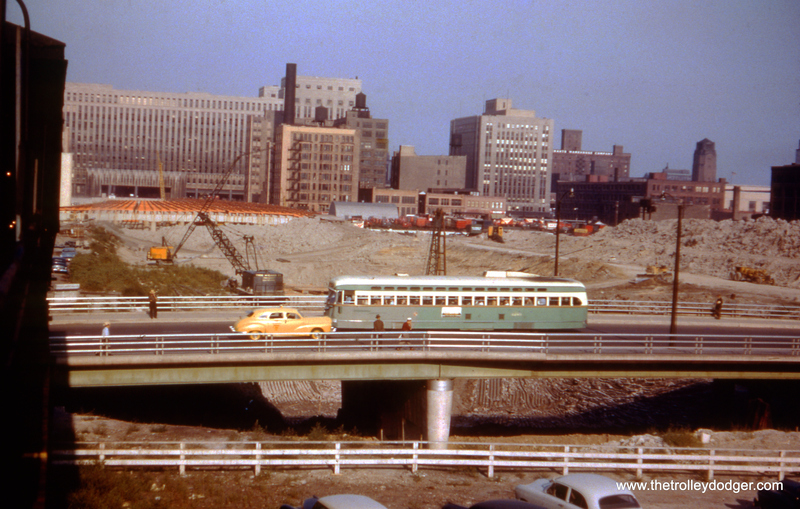 Was it also Kodachrome? Yes. 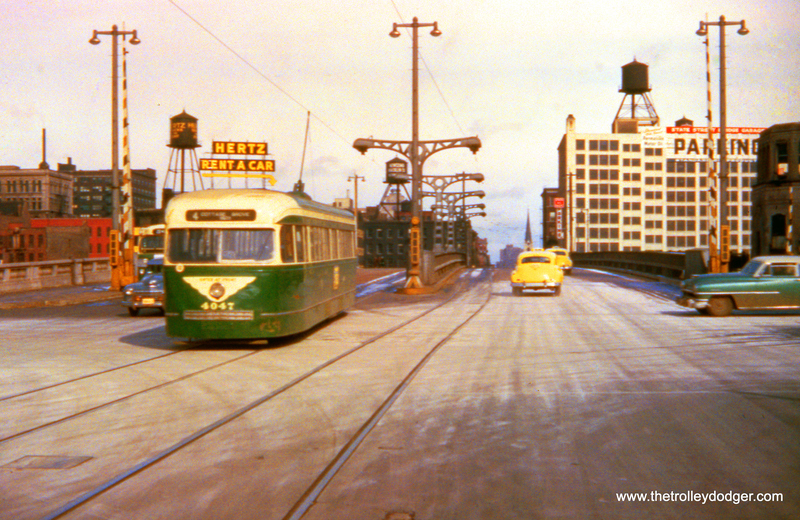 I always shot Kodachrome on the 16mm. And then, at some point, did you switch over to using video? Yes, I got pushed into it by the cost, when I started shooting 16 it was about $9 for a 50-foot reel, and it went to $70, and I just couldn’t stand it anymore. I had to go to something that was a little more reasonable. 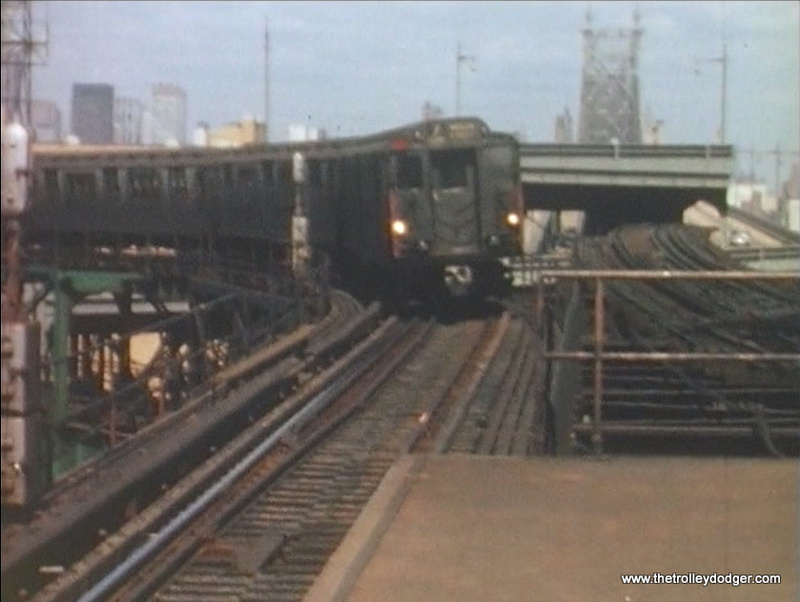 Unfortunately, I lost a little quality on the early Hi8 camera I used. Sure. But now they keep coming up with new formats for the video, they’ve got this new one called 4k, which is the best one yet. Well, the big problem is they keep changing formats so quickly. Now I’ve had three different video cameras with three different setups. A couple used Hi8, and the last one is digital video on SD cards, and things keep changing. 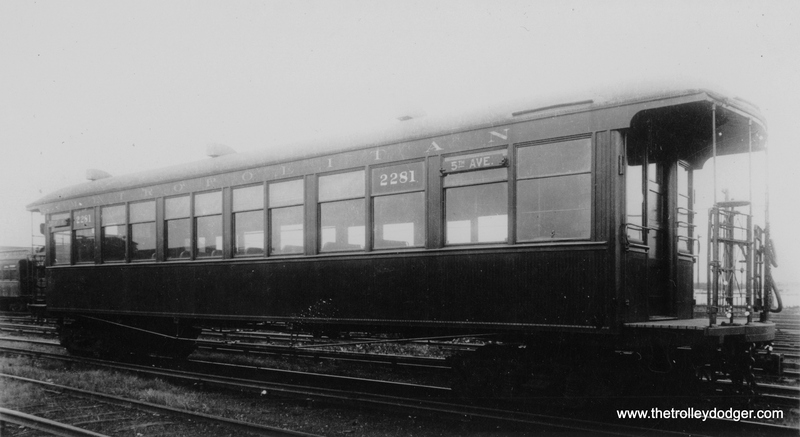 Regarding some of the film on the two traction discs, I could ask you a few questions. 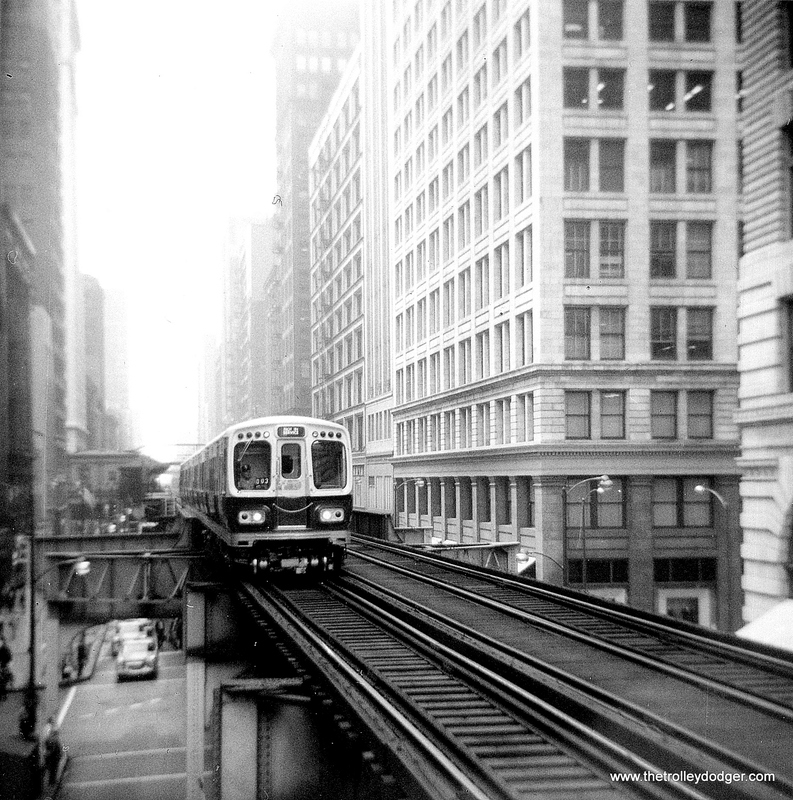 You made some business trips to Chicago, is that how you ended up making some films around Chicago? 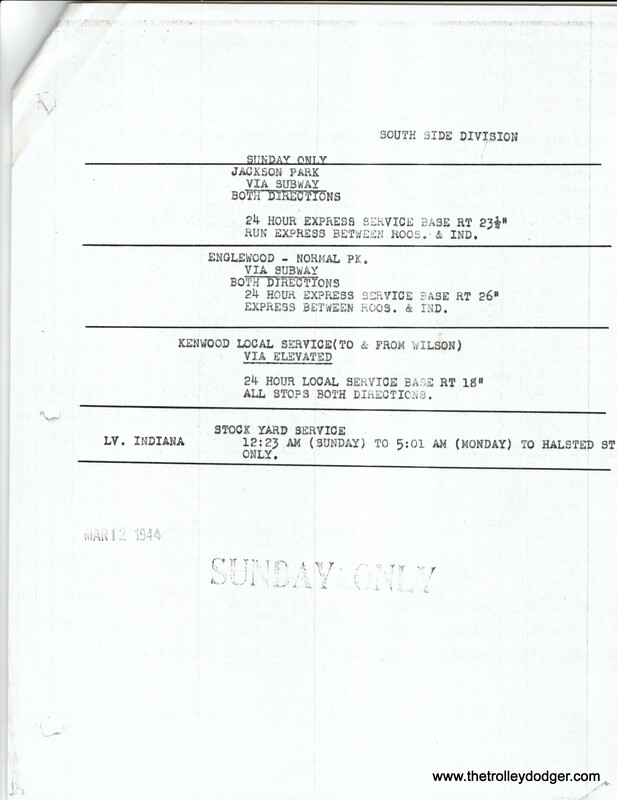 Some of it was business trips to Chicago, and some of it was just plain vacation. 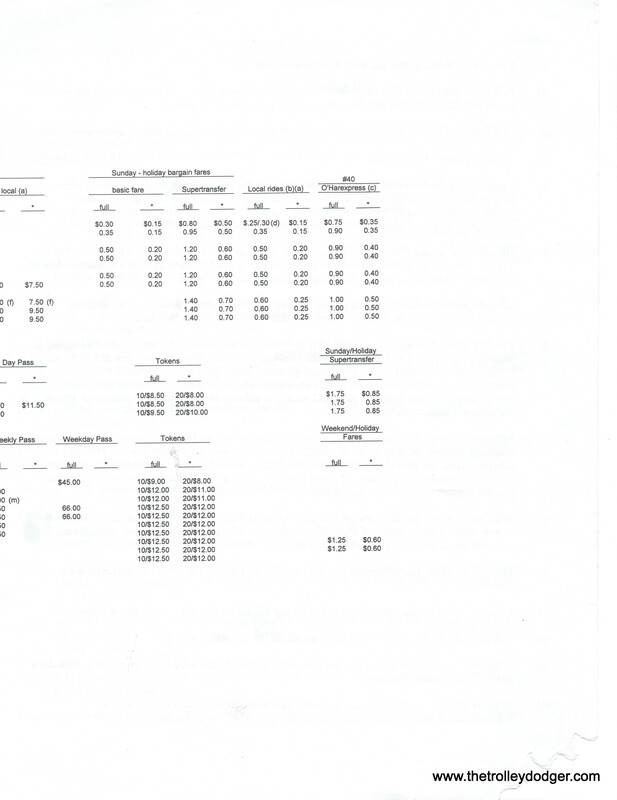 I didn’t get a lot of business trips. 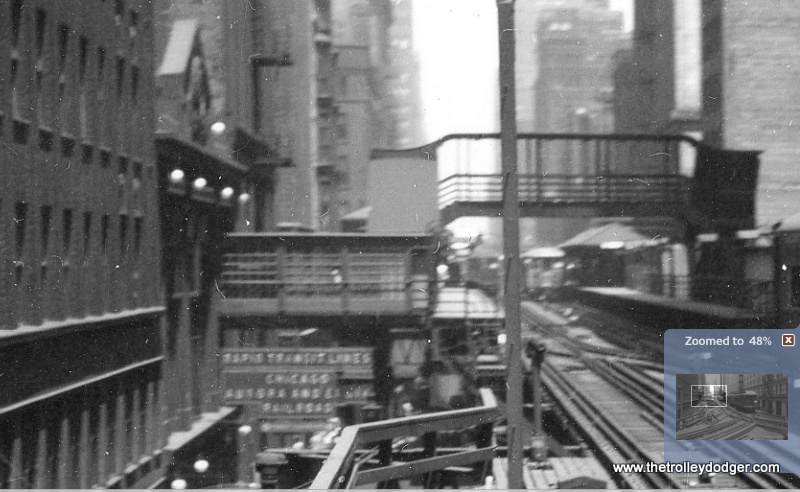 The stuff shot in New York was on business trips, and some of the stuff shot in Chicago was on business trips, but not all of it. 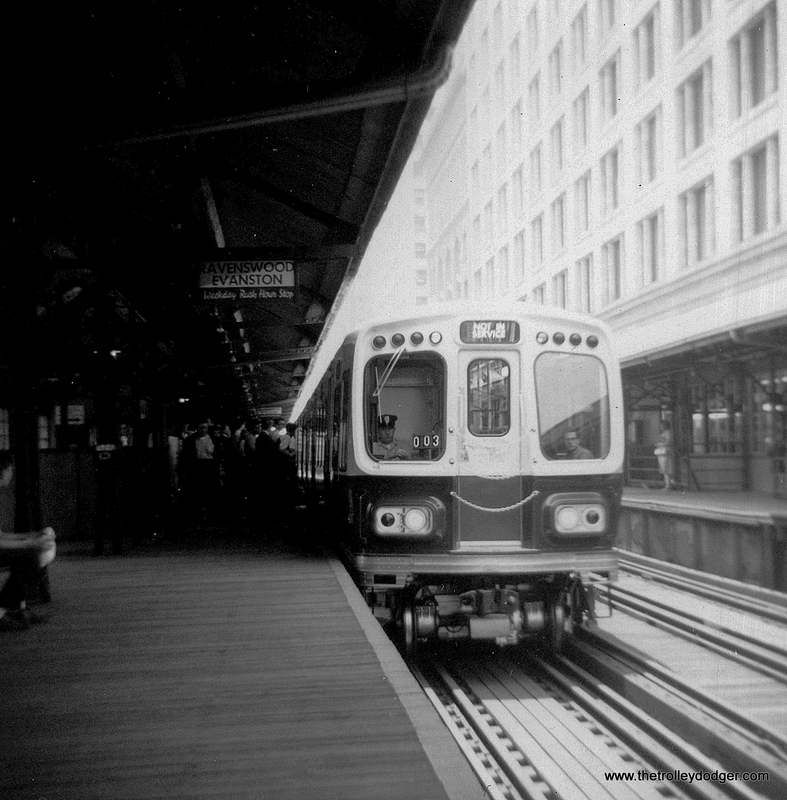 In ’63 or so, you took some film on the “L”. 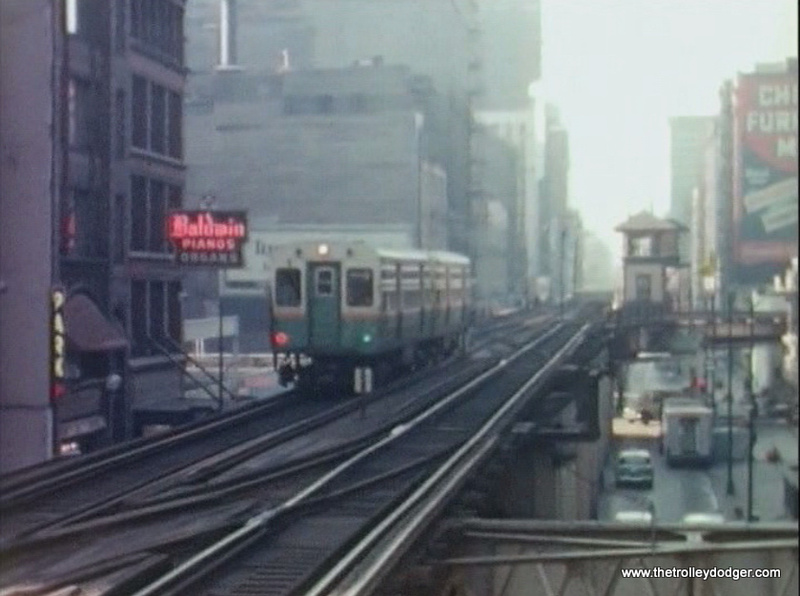 It looked like you were at what they now call Adams and Wabash station, watching some trains come around into the station, and you’ve got some footage where you rode out on the Lake Street “L” to Oak Park. 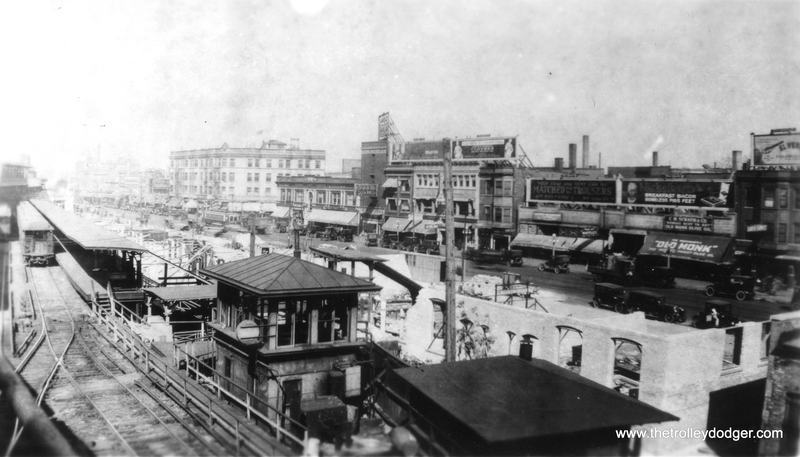 That was the year after they had elevated that one section, the outer end of the Lake Street “L”, it ran on the ground for 2 ½ miles on the west end, and I saw that you had a glimpse there showing the track was still in place, even though you were up on the embankment. 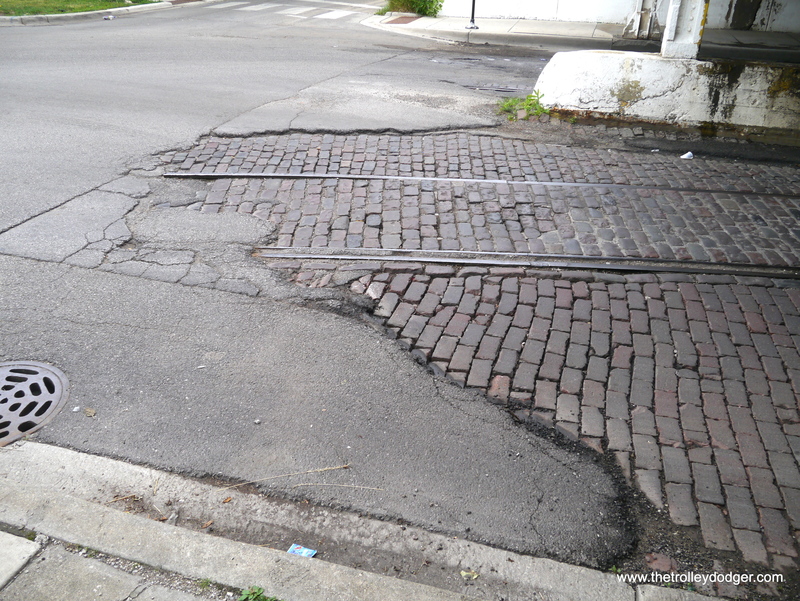 But it looks like they had paved over the grade crossings. I was wondering a little bit what that track was. 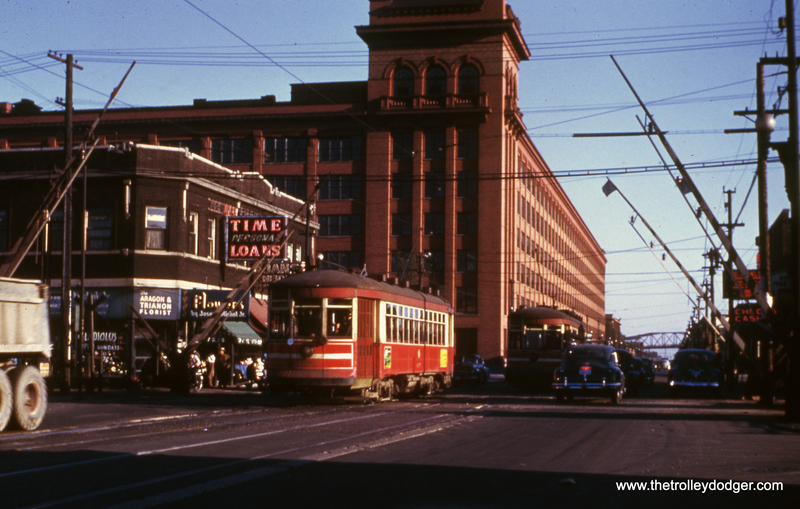 Until October 28, 1962, the west end of the Lake Street “L” ran on the ground, west of the Laramie station. 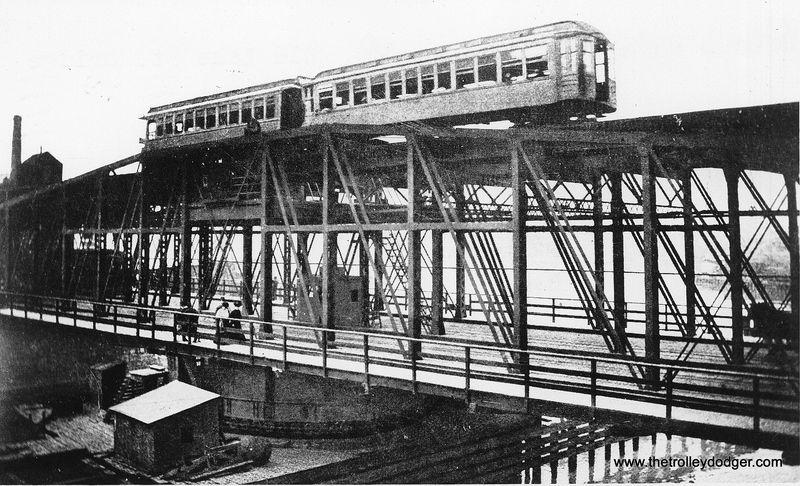 There was a ramp that went down to ground level and it ran parallel to the Chicago and North Western embankment there, using overhead wire. 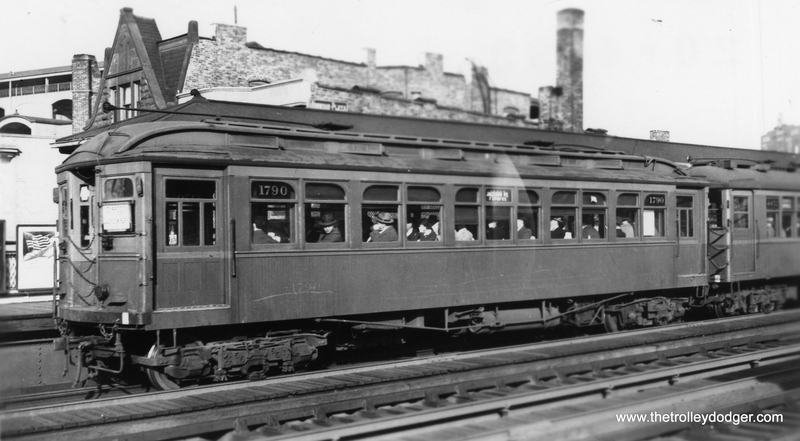 They had trolley poles on the trains, and clearances were very tight. 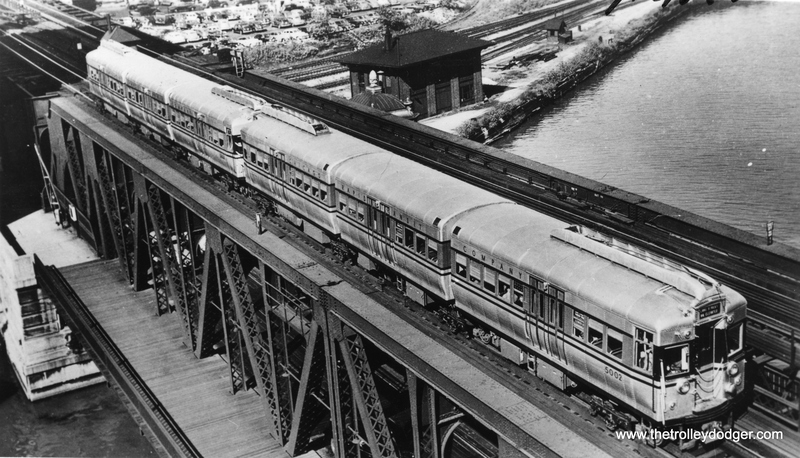 There were something like 22 grade crossings, blind crossings, where you could easily have an accident where a vehicle would run under that viaduct and run right into a train. It was kind of dangerous. 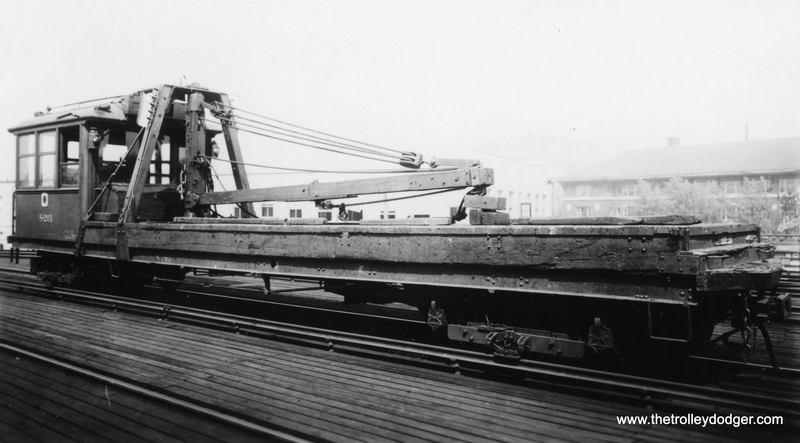 These were manually operated gates, so there was a lot of manpower involved. 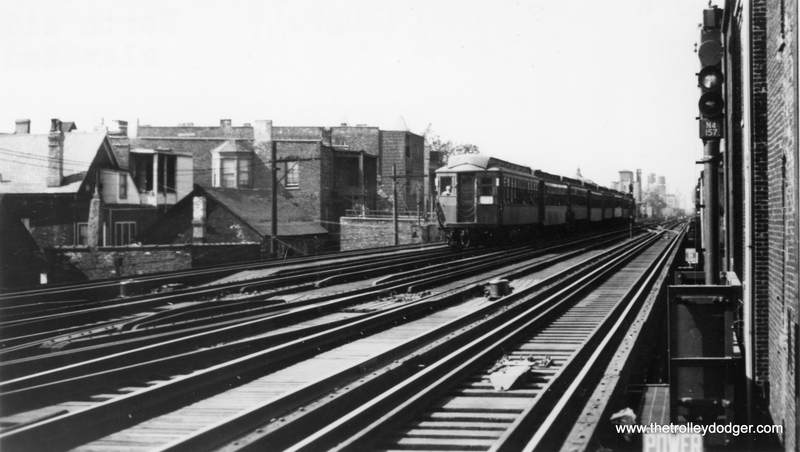 The CTA wanted to reduce expenses, improve the running time, and safety, so they made a deal with the Chicago and North Western in the 1950s to relocate the tracks onto the embankment, which had probably been put up sometime around 1910. 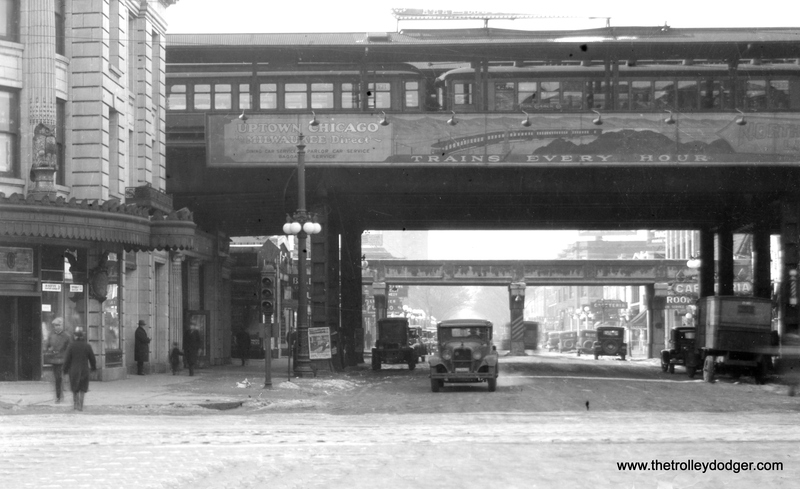 It was a big project which involved a variety of different government bodies, the Village of Oak Park, the City of Chicago, the Chicago Transit Authority, the State of Illinois, and it was a “win-win” situation, because everybody benefited from the relocation of the tracks. 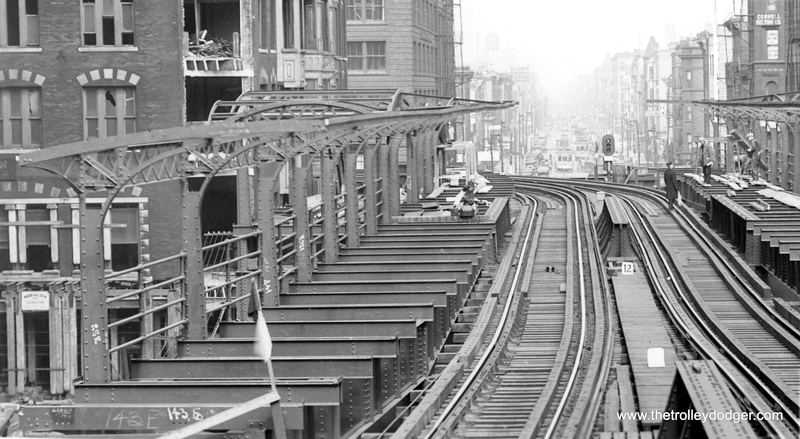 When they got rid of those tracks, that made the street wider, and it allowed for more parking, and of course there were a lot of improvements based on the quicker running time for the trains, and since it was grade separated, there weren’t going to be any more accidents with pedestrians and vehicles. 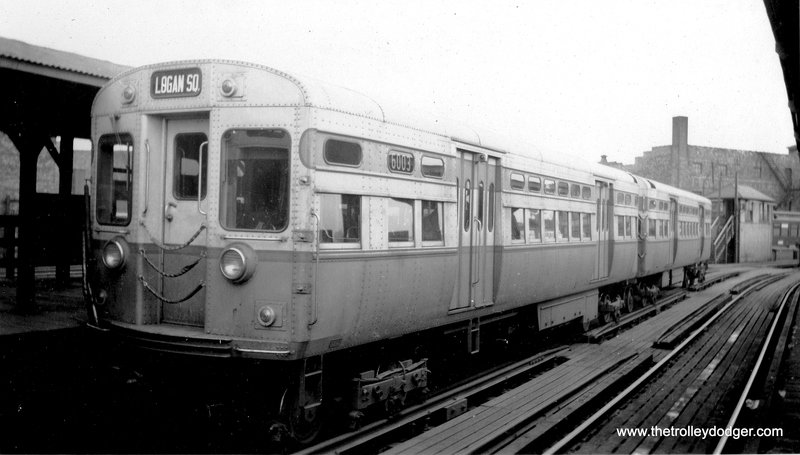 I grew up in the area around Oak Park, so we rode those trains many times when they ran on the ground. 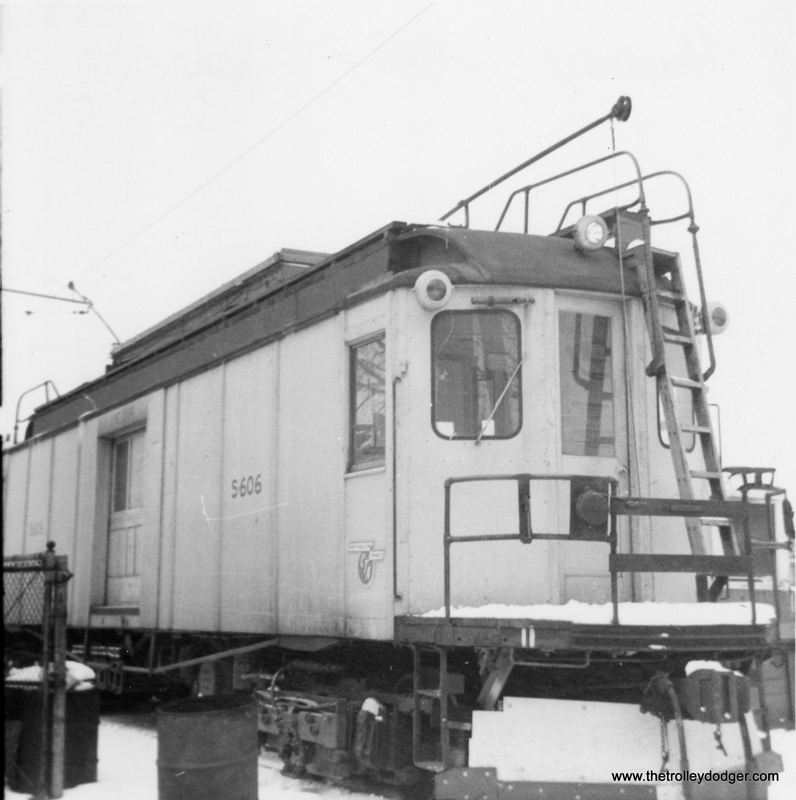 The clearances were so tight that they couldn’t run the 6000-series “L” cars, which had curved sides, and just that little bit of extra room was enough that they couldn’t run those cars on that part of the line. 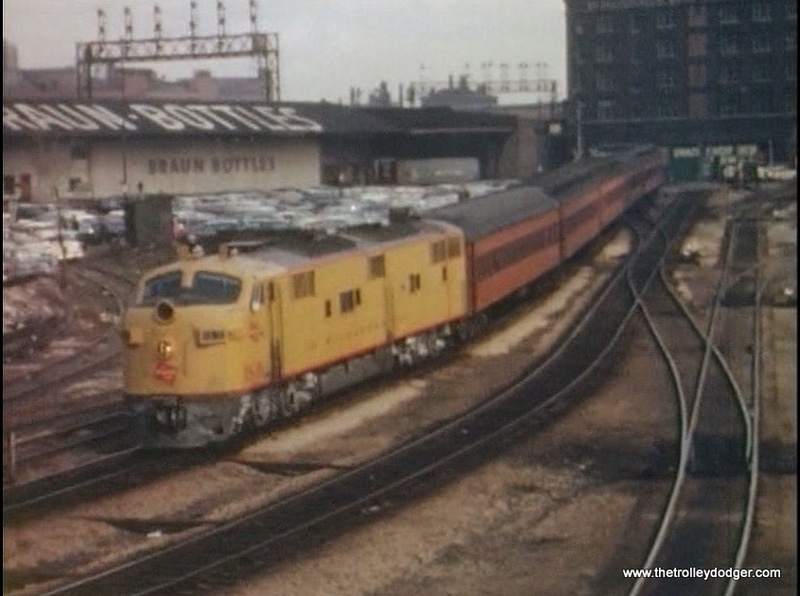 I noticed also that you had taken some film showing trains going up the ramp out of the old Hamlin Yard, which was near Lake and Pulaski. You remind me of what was in that video. A lot of it, I’ve forgotten. Of course, it’s been a few years, I’ve had some time to forget stuff. 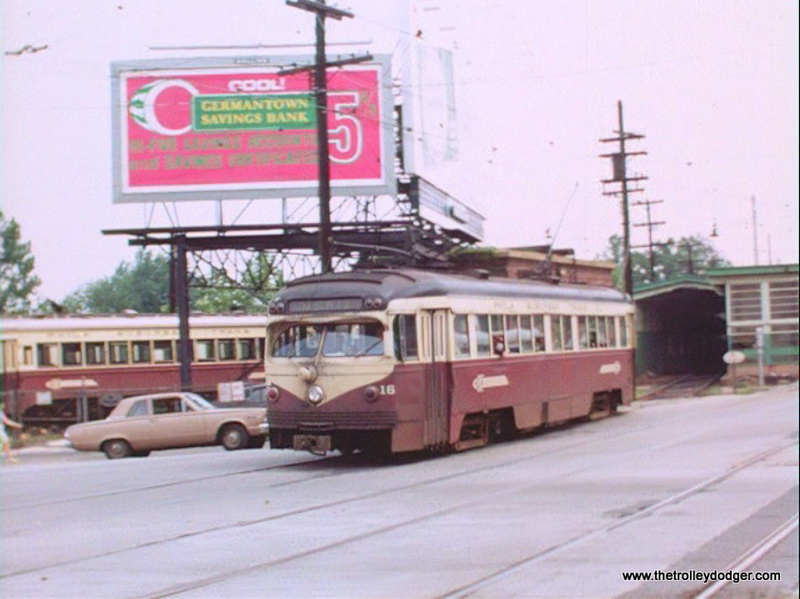 Yeah, for car storage then, they really didn’t have a proper yard as such at the end of the line, which was in Forest Park, just west of Harlem Avenue. 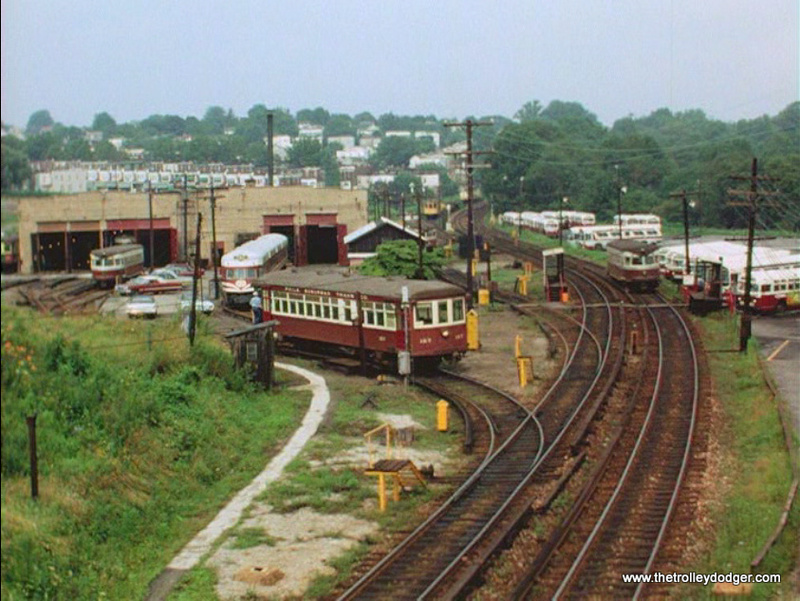 For car storage, they had this Hamlin Yard, across the street from West Shops, used by the Surface Lines. 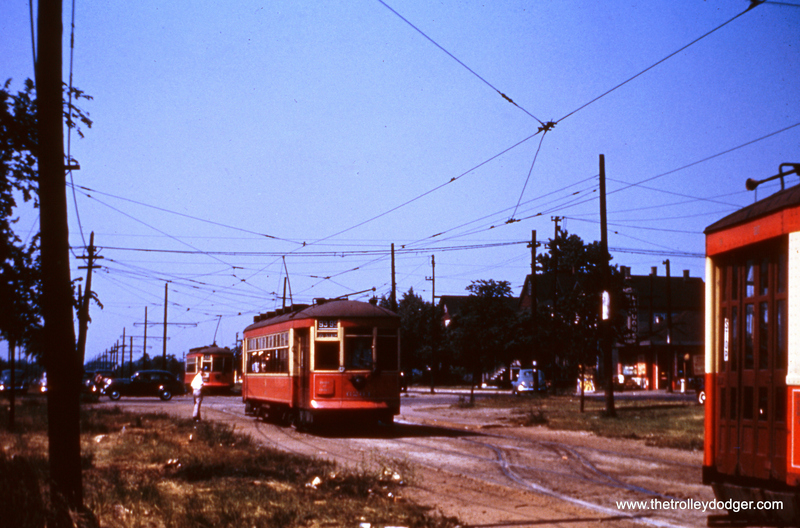 They had streetcar trackage running in and out of there, where they had overhead wire. 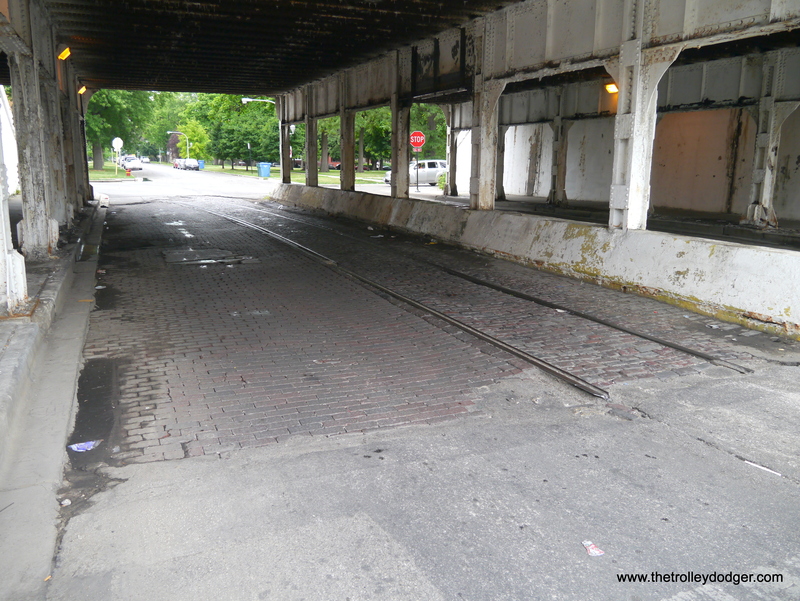 They also had a third track on the Lake Street “L” where they stored some cars. You had some great shots of all of that. 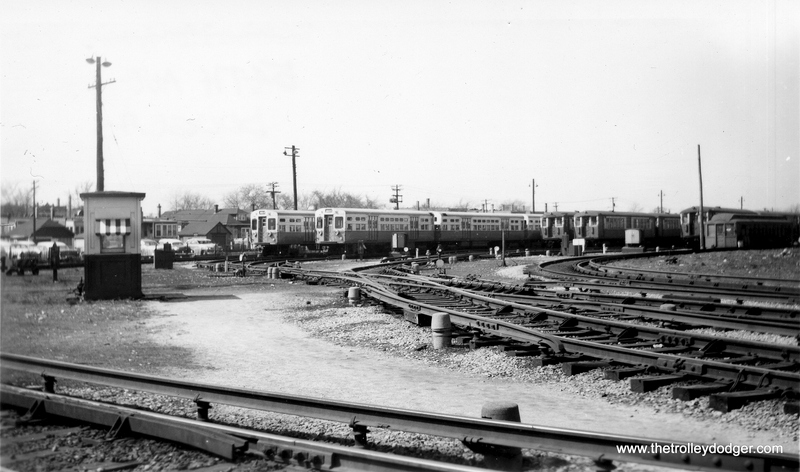 And then you had shots of the South Shore Line and the Illinois Central Electric, showing the old IC cars from 1926, plus the Highliners, the bi-levels that were replacing them back in the ’70s. All great stuff. 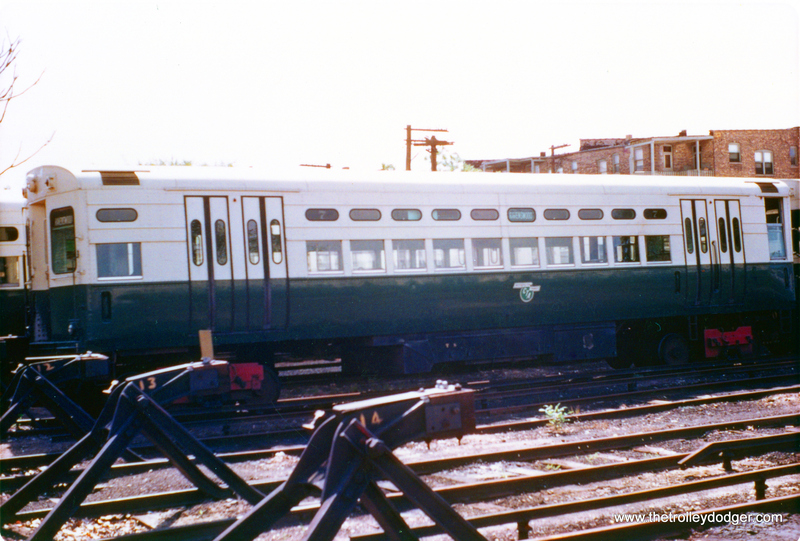 Those first generation Highliners have now been retired, just within the last year or so, and they’ve been replaced by something very similar, but more modern. 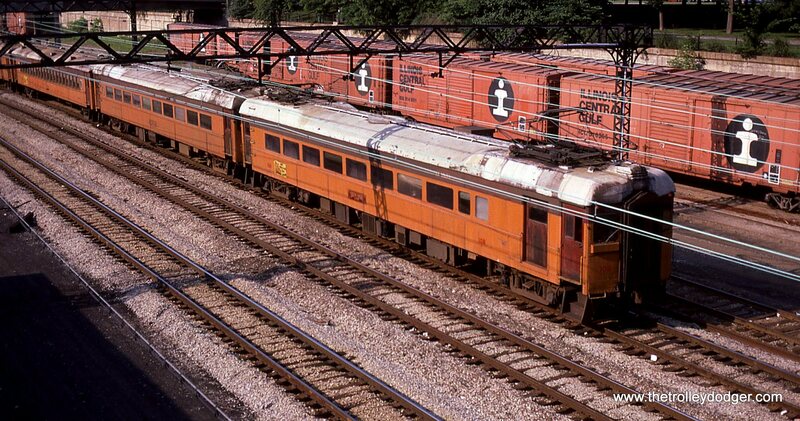 That’s the thing about a lot of this railfanning. I’ve been at it long enough that sometimes, the things have been replaced, and sometimes the replacements have been replaced. Right. 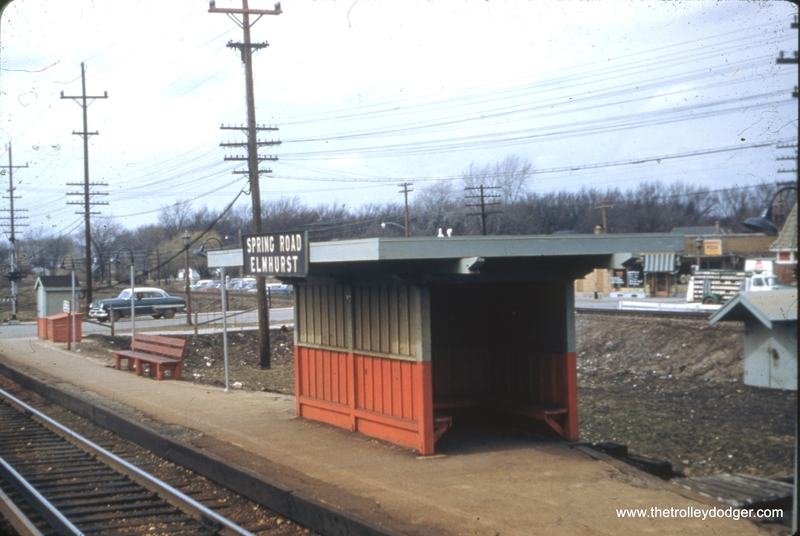 And on the South Shore Line, all those old cars have been replaced. 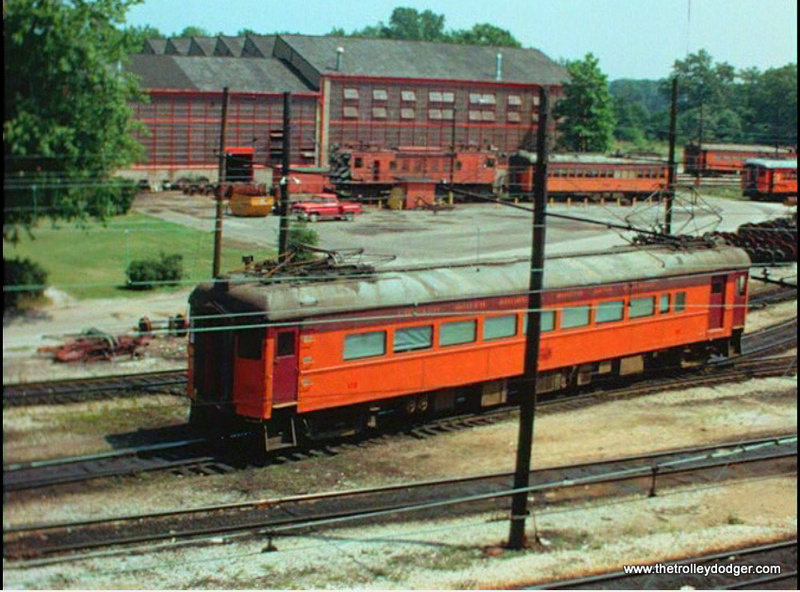 I think that many of them have been saved, by many railway museums, and there are a few of them that actually operate some, like the Illinois Railway Museum, and the East Troy Electric Railroad in Wisconsin. 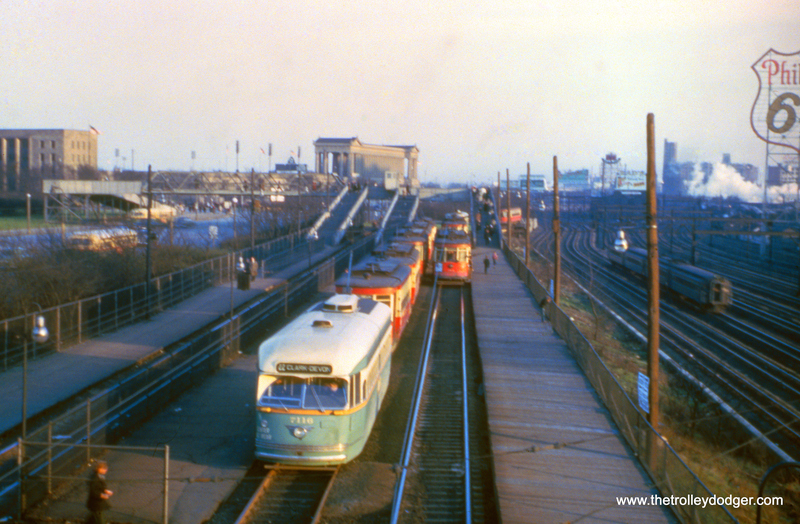 I did ride those cars a few times in their twilight years. 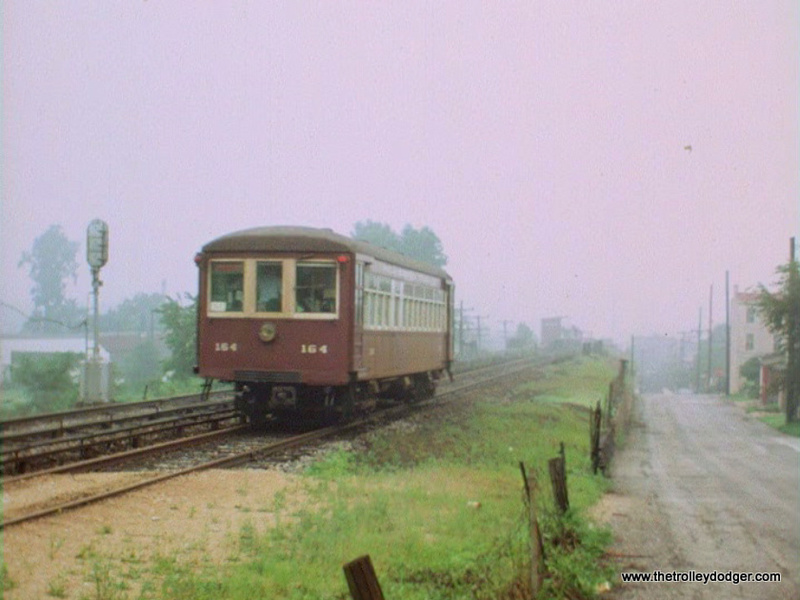 Those cars were replaced by some Japanese-made vehicles around 1981, and now they even have some bi-levels of their own. 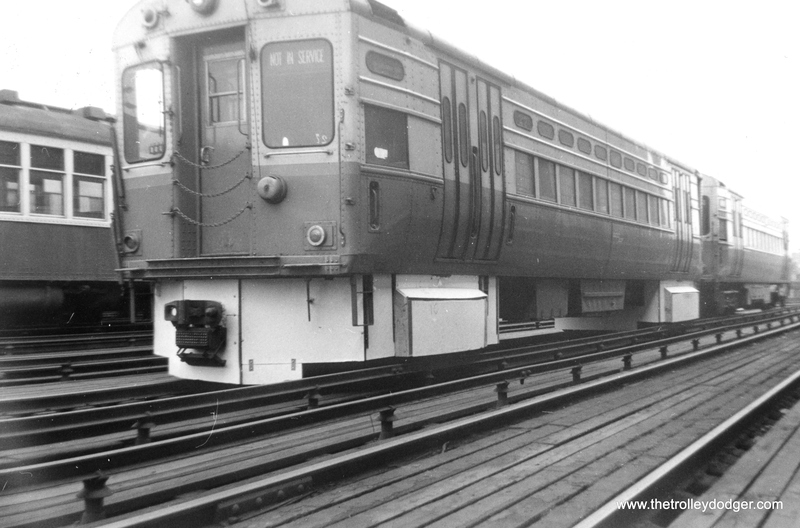 They piggybacked on an order of cars for the Metra Electric, which runs the service now that used to be the Illinois Central suburban. 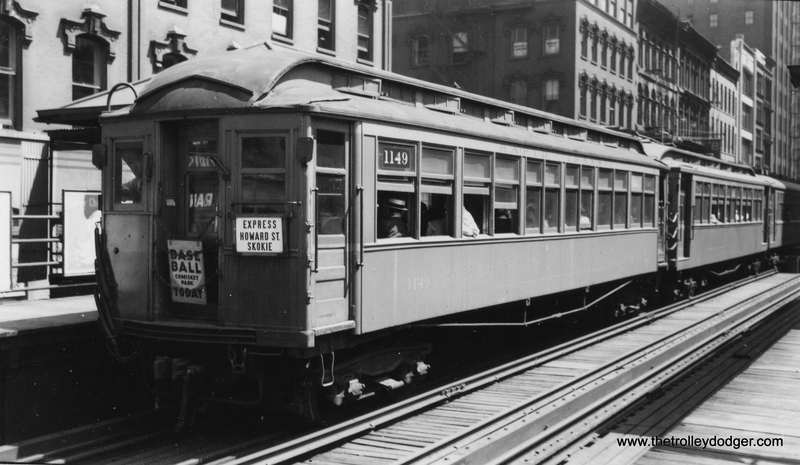 They just use them during weekday rush hours. 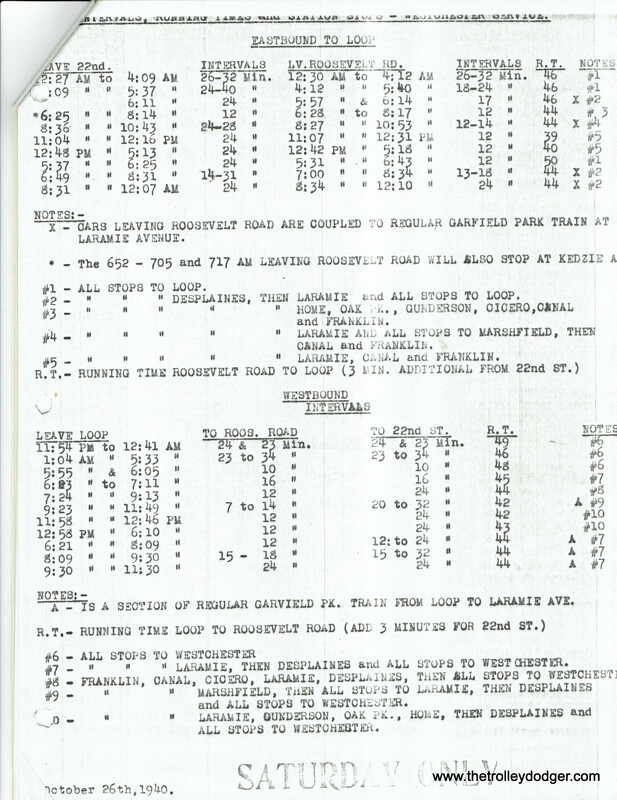 There is even now some talk of double-tracking the rest of the line out to South Bend. It’s been a lot of changes. 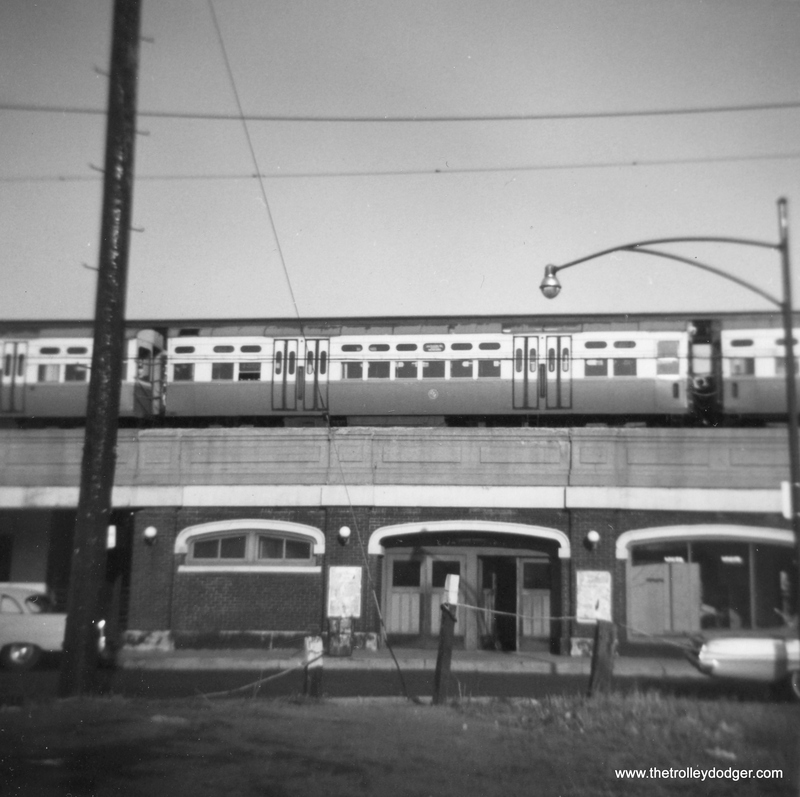 Your first shots there of the South Shore Line were taken in 1971 or so. 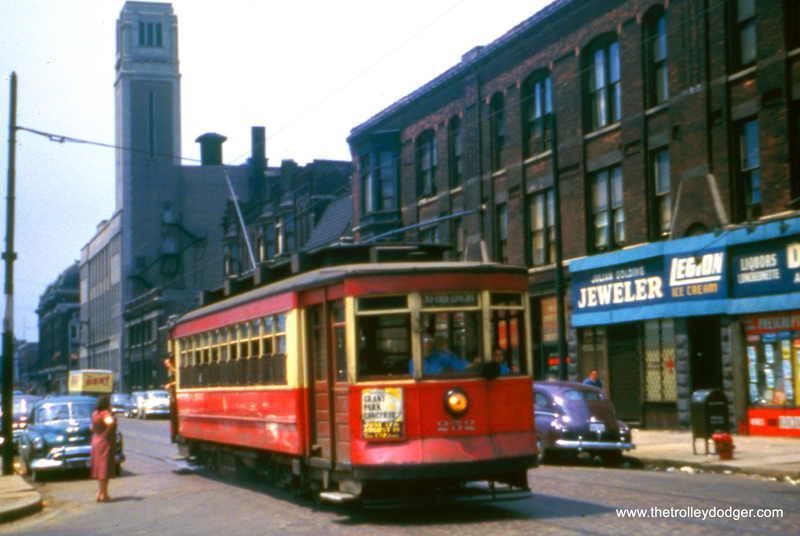 Up until the summer of 1970, they ran all the way into downtown South Bend. 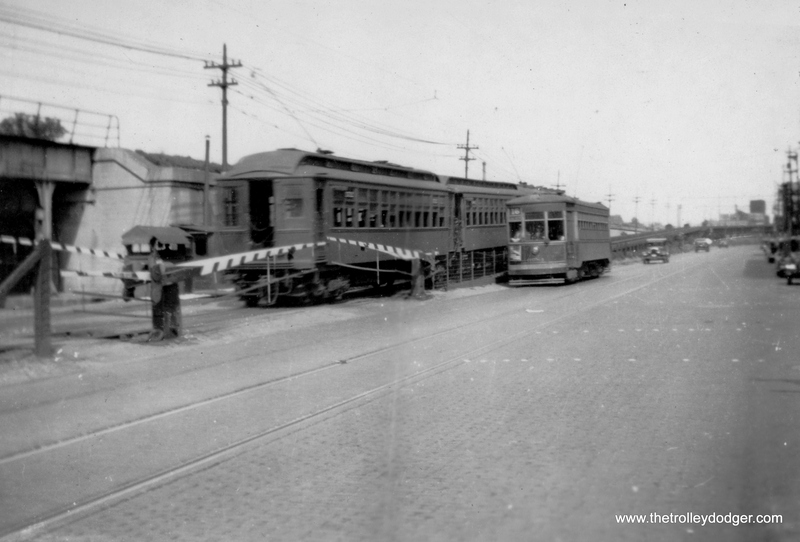 They had some street running there, which they cut back to the outskirts of town. 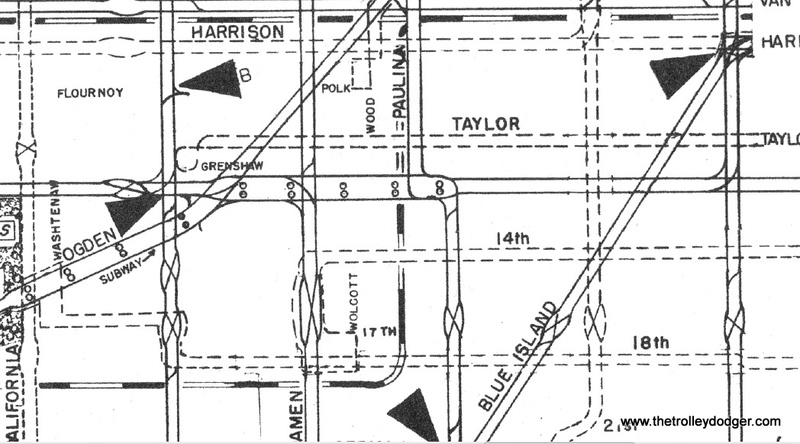 Since that time, they built some new track to a nearby airport. 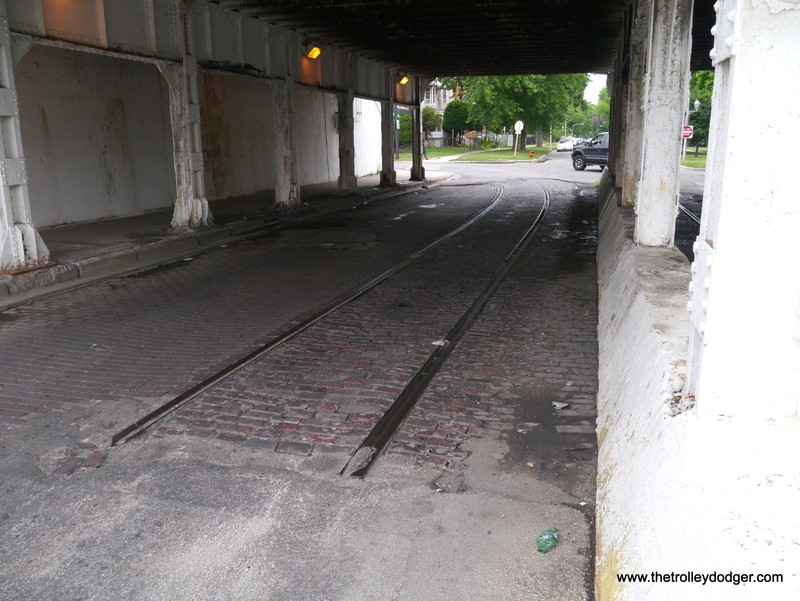 There’s always been talk about grade separating the track that runs on the streets through Michigan City, but they haven’t done that yet. 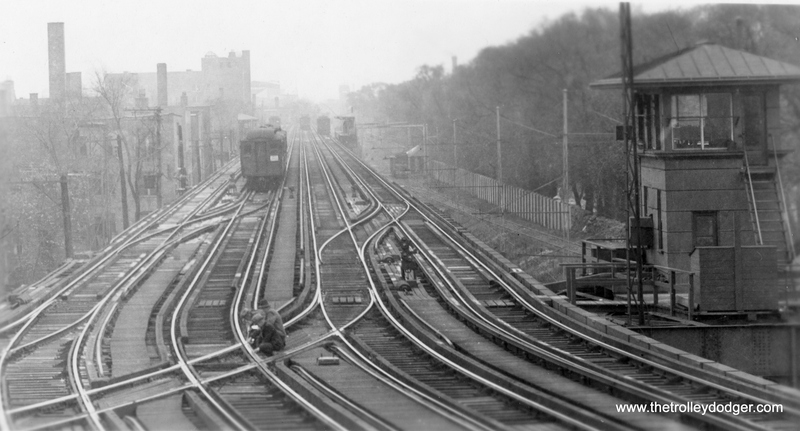 They keep arguing over which route they would use. 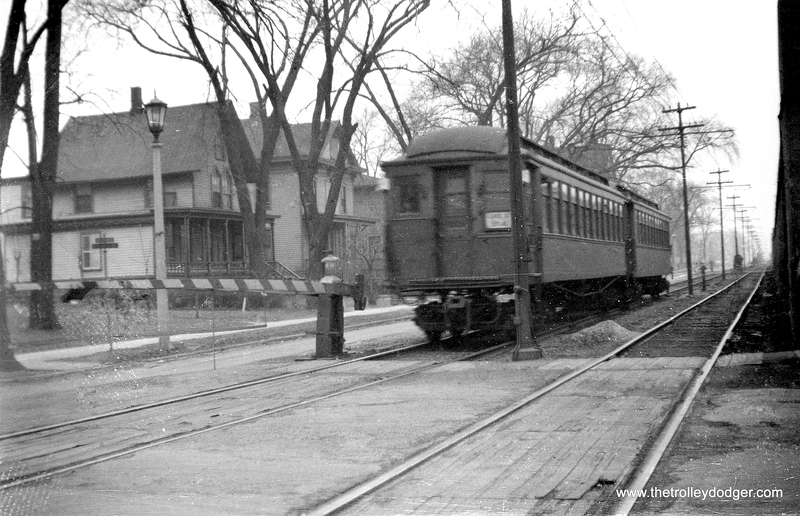 So, at the moment, all those South Shore trains run right down the street through Michigan City, like they have for many, many decades. 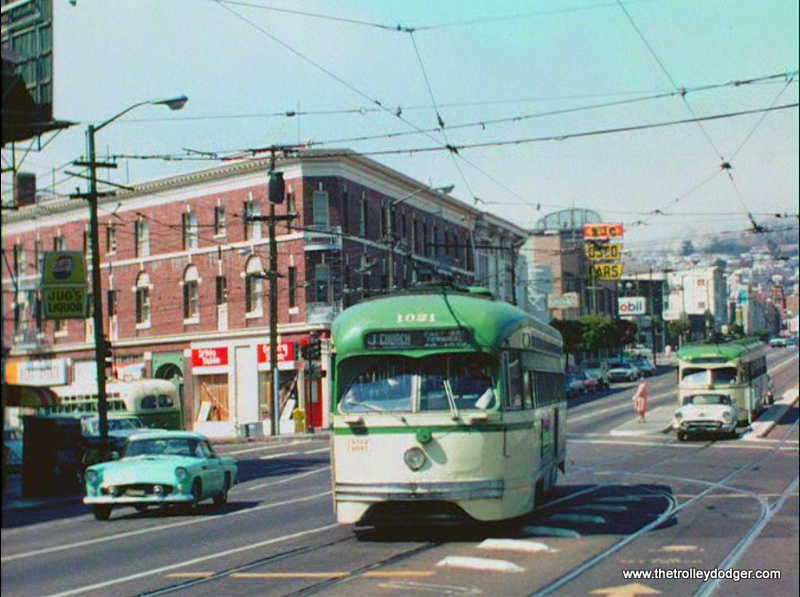 You had some great footage in other places too, like in San Francisco, amazing shots of all that wonderful old equipment. 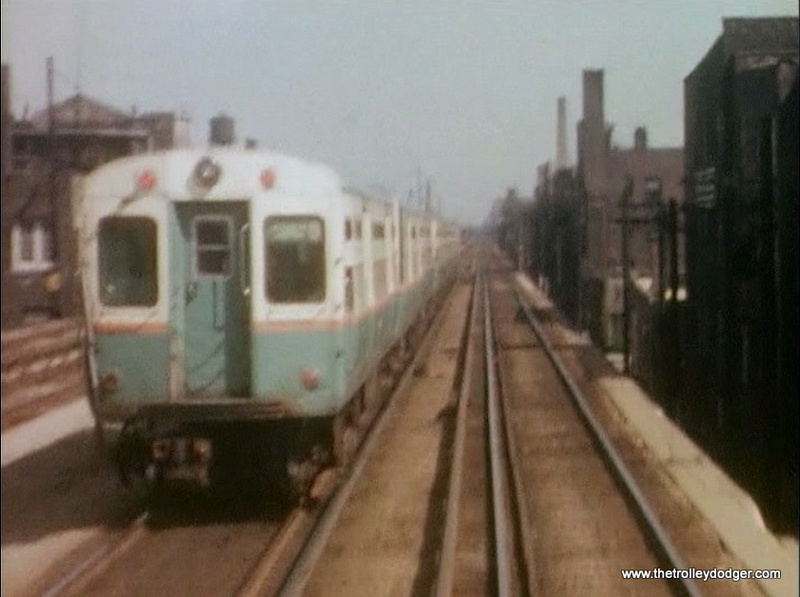 Fortunately, they still have some old equipment running, on those historic lines they’ve come up with, and then Red Arrow, some great footage there of the Red Arrow Lines. 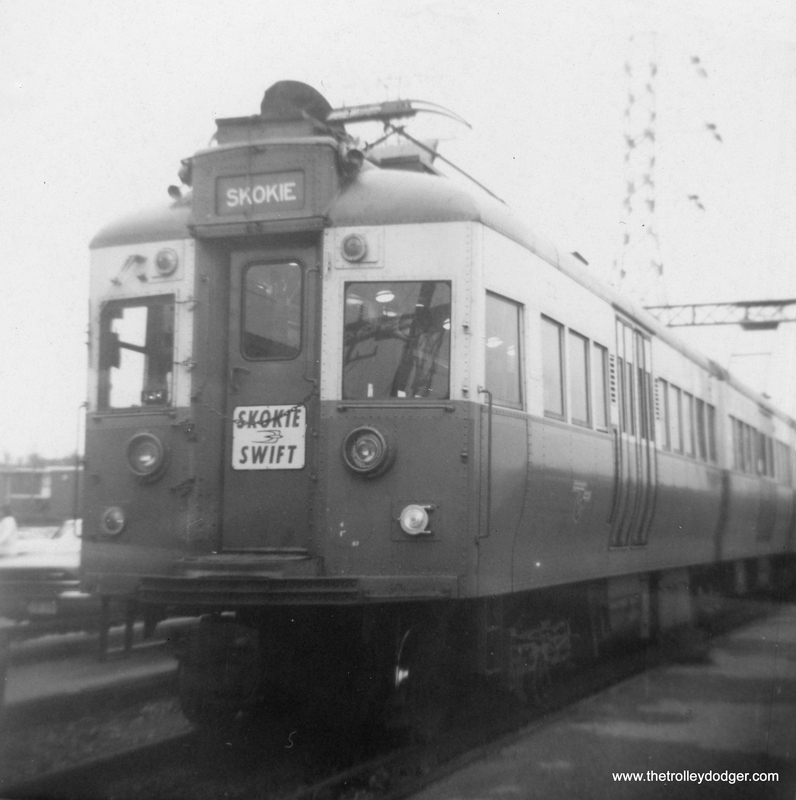 Do you have some memories of those visits? Oh yes. I have some memories, but I don’t have the details. I have to watch the videos to see what I saw. There’s a lot out east, New York and New Jersey. 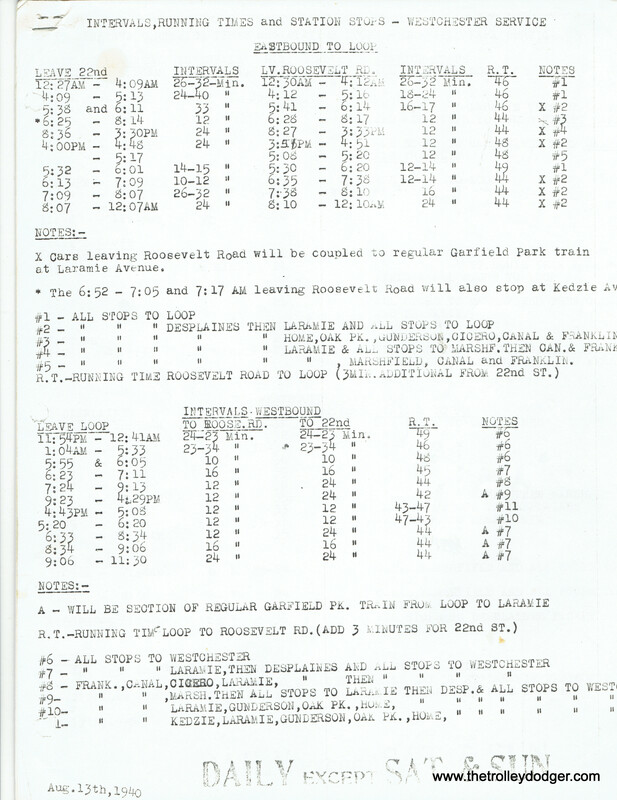 I’ve got a lot of, oh dear, Conrail. 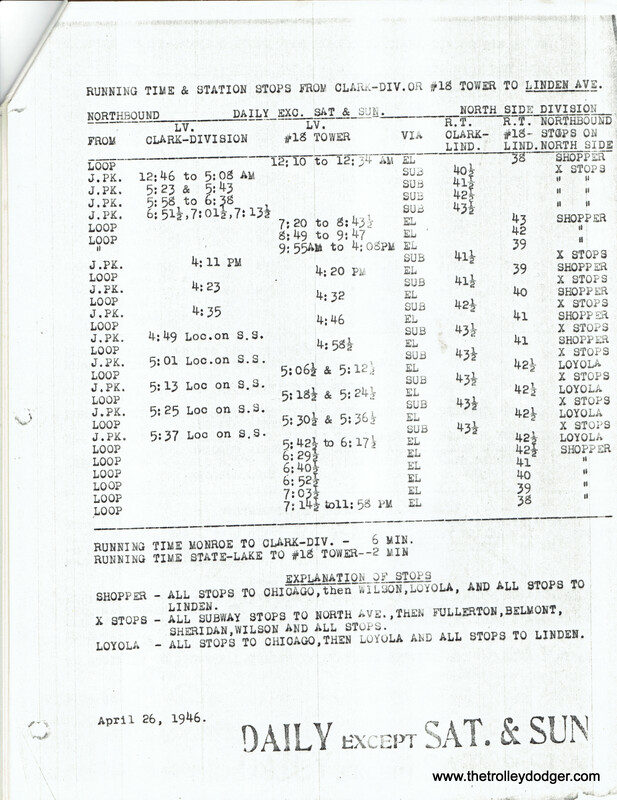 I was looking here, I’ve got Minnesota Transportation Museum, September ’74, that’s 11 minutes. 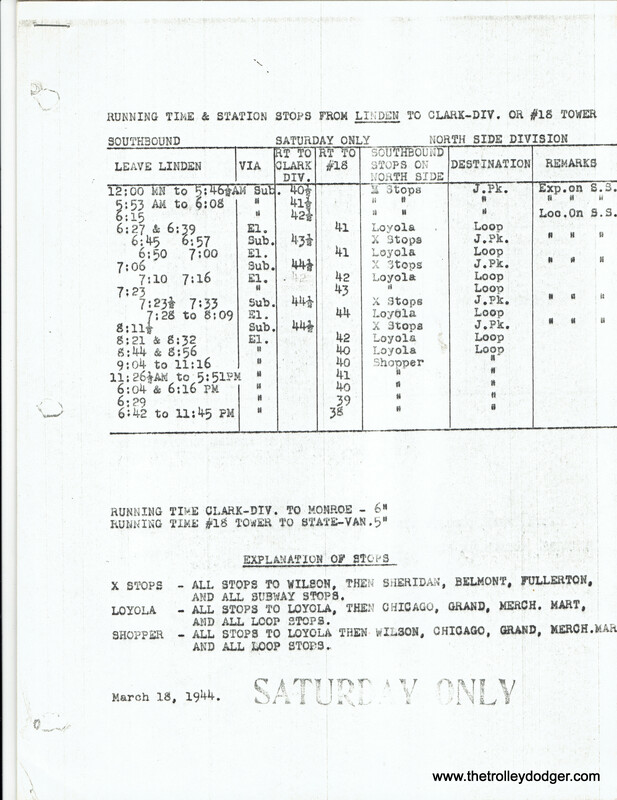 There’s another one that’s about 15 minutes, that shows the same stuff years later. 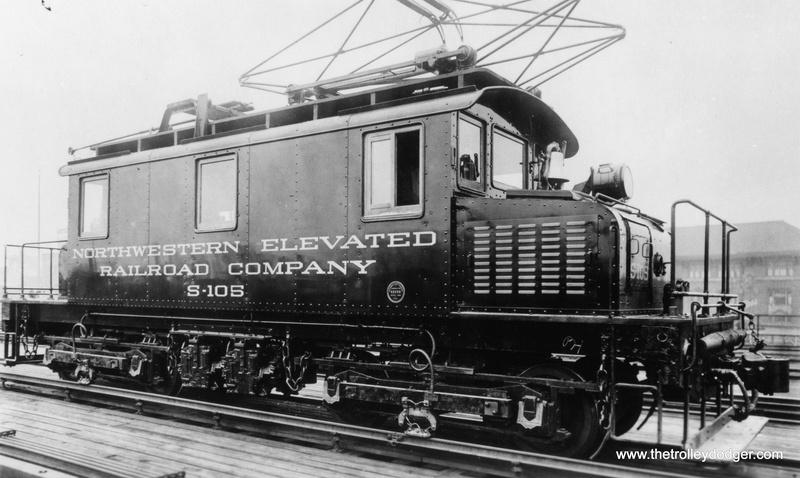 Some of the east coast stuff would be interesting to many people. There’s a friend of mine who lives in New Jersey. 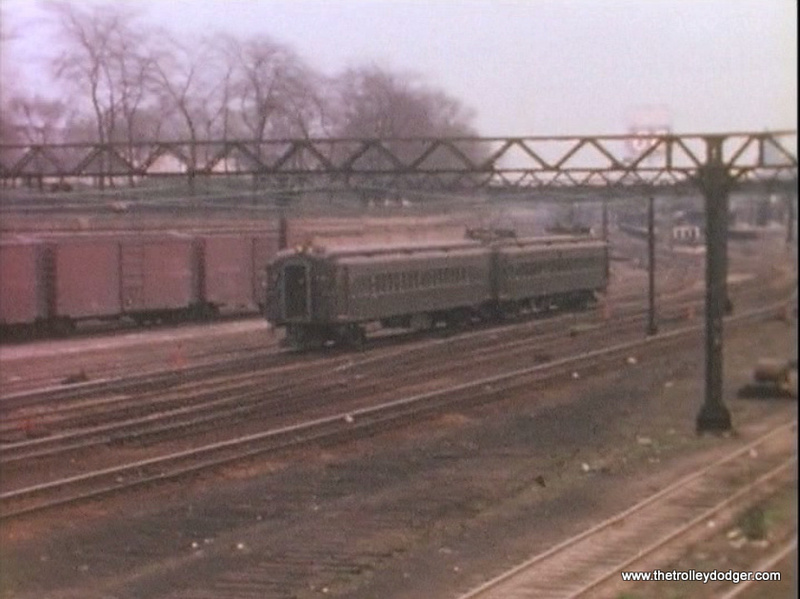 I’m sure he would love to see your footage of the Gladstone Branch, the Erie Lackawanna. 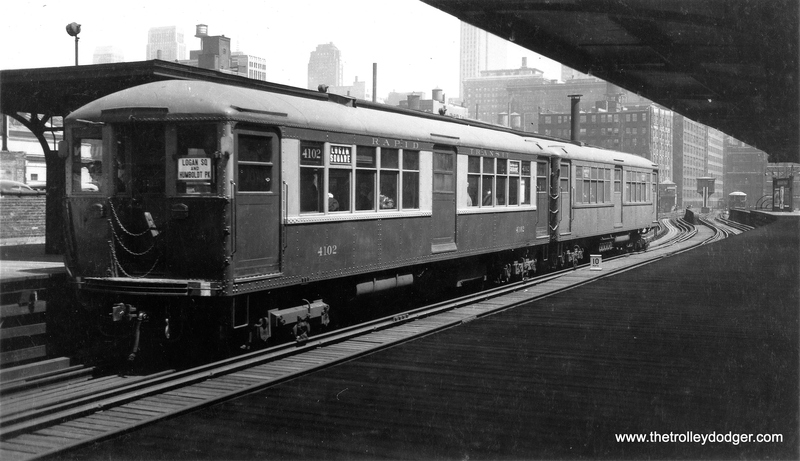 Some of that reminds me of, the old cars there, reminds me a lot of the ones that were used on the Illinois Central. 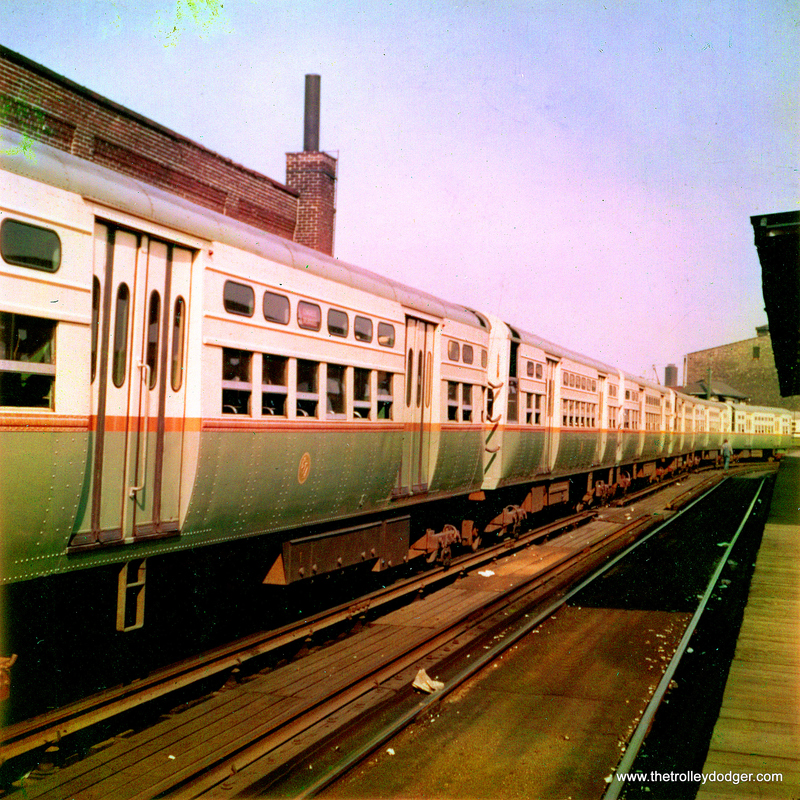 Trains have changed so much in the last 50 years. 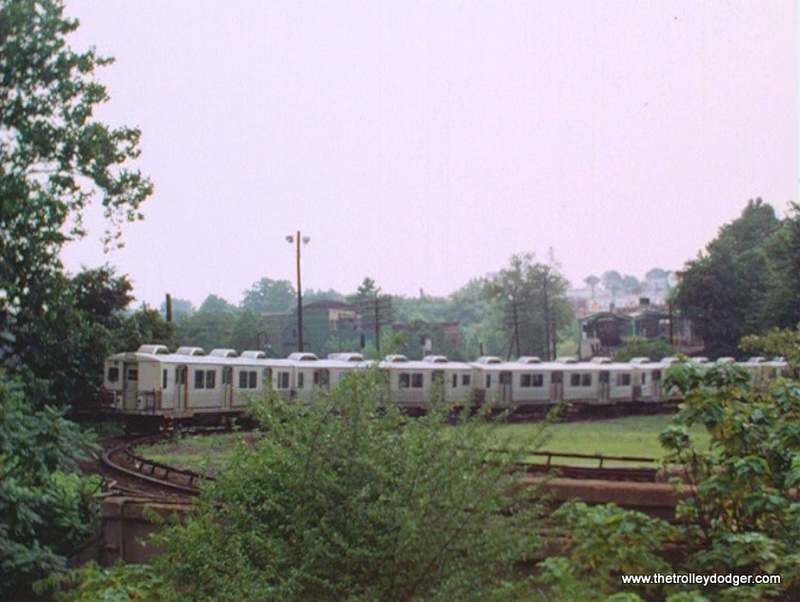 Sure, those lines are running too, but they’re all NJ Transit. 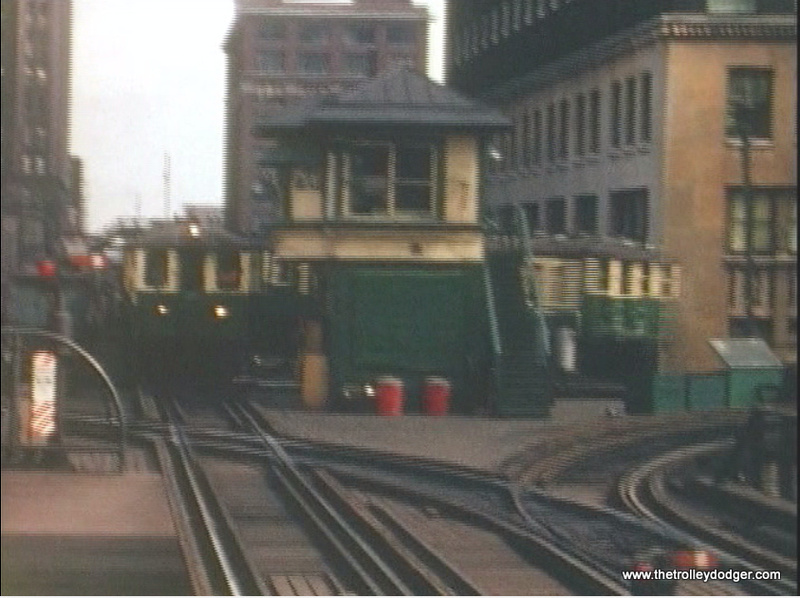 Now, the Como-Harriet trolley (Minneapolis-St. Paul), I have the one reel from 1974, and another one that shows the same thing in 1998, with expansion and so on. Anyway, I’ve got these two, which add up to another oh, 26 minutes. They might be of some small interest too. 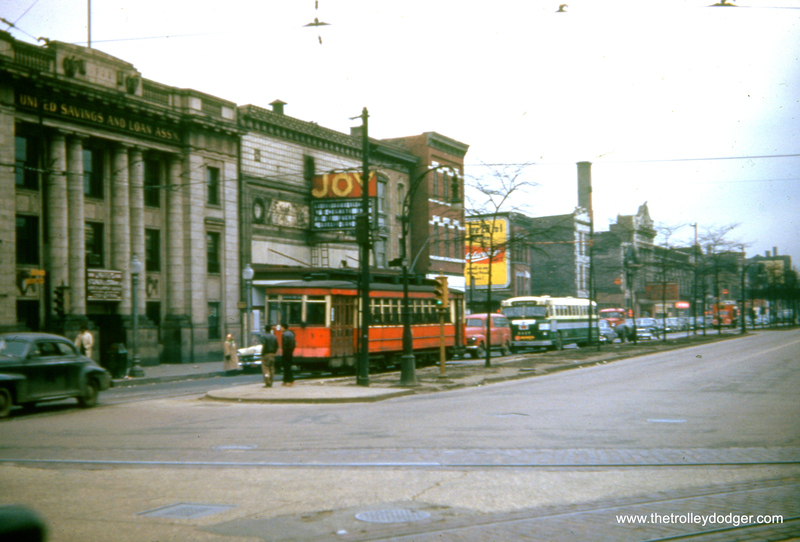 I used to show my movies to the Syracuse chapter of the NRHS. I wore out a projector doing that. Now I’ve gotta get off the phone. My wife is calling me for supper. I have no objection to your making copies of these DVDs, and to sell them. I am quite happy with it. My thought is, it does no good sitting on my shelf. I would rather have it spread as widely as possible, and you look like you might be a good person to do that. It’s been so nice talking to you. We’ll be in touch. Thanks so much. Take care. 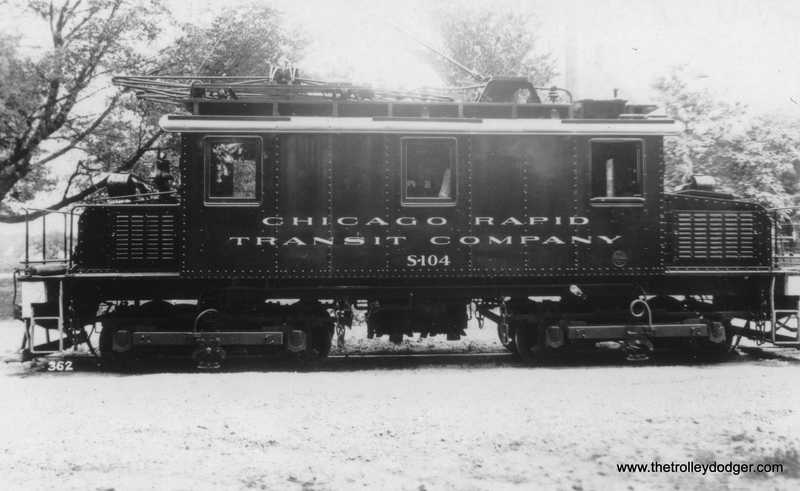 The original Illinois Central Electric trains, which were built in 1926. 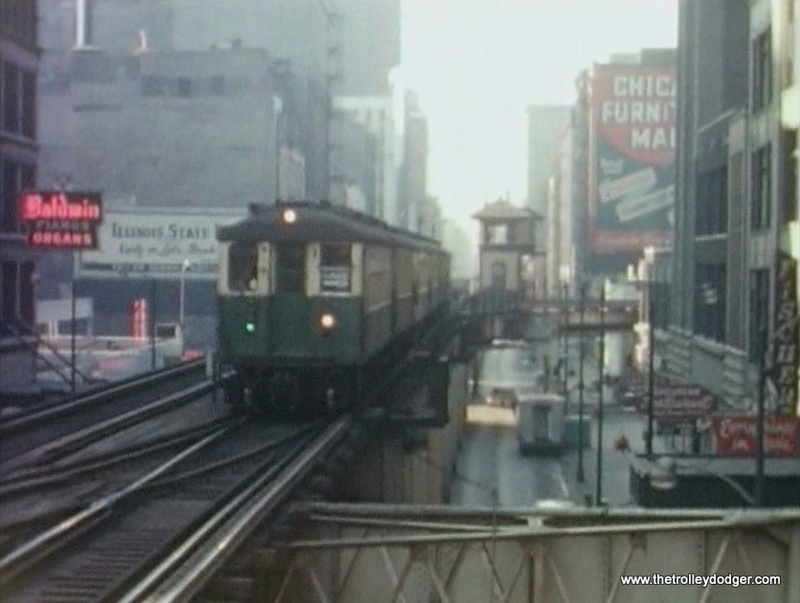 4000s pass the old Tower 12 at Wabash and Van Buren in Chicago’s Loop. 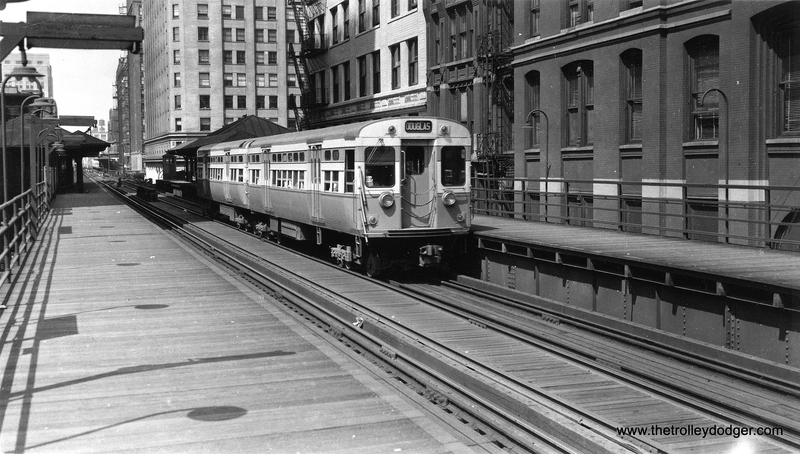 A Lake train of 4000s approaches Adams and Wabash in 1963, when the Loop was single-directional. 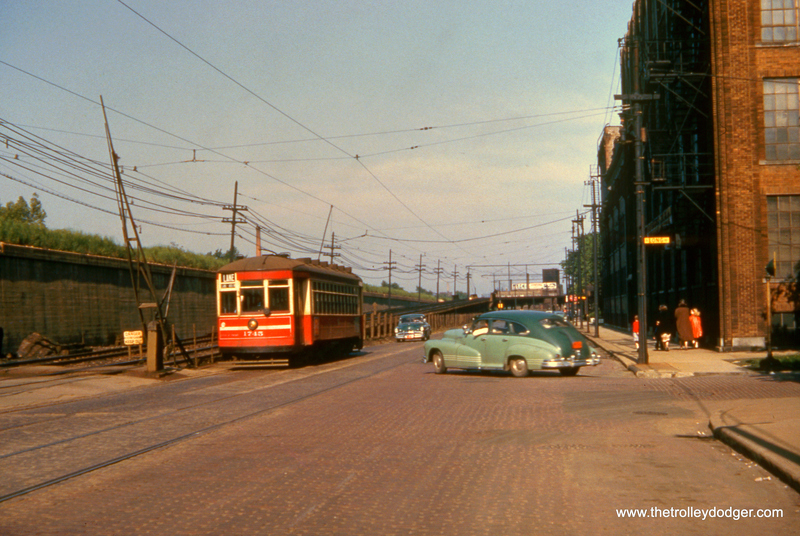 A two-car CTA Ravenswood train approaches Adams and Wabash in 1963. 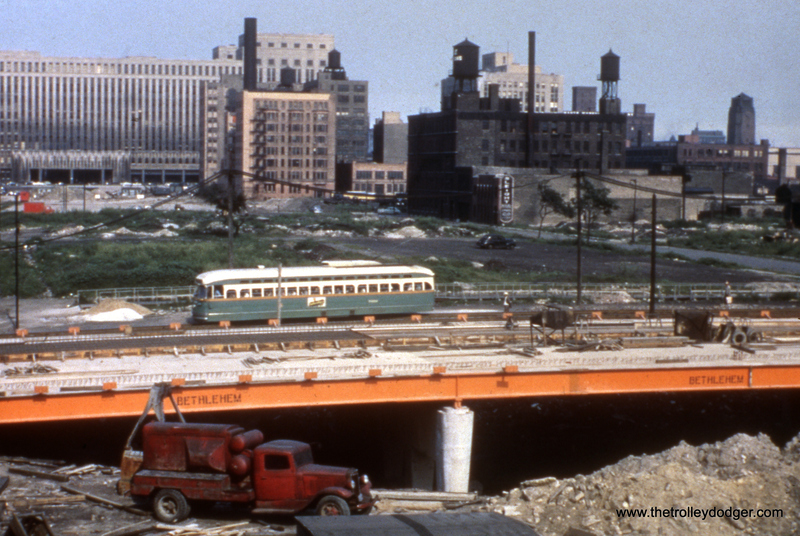 In 1963, the old Lake Street Transfer station had not yet been torn down. 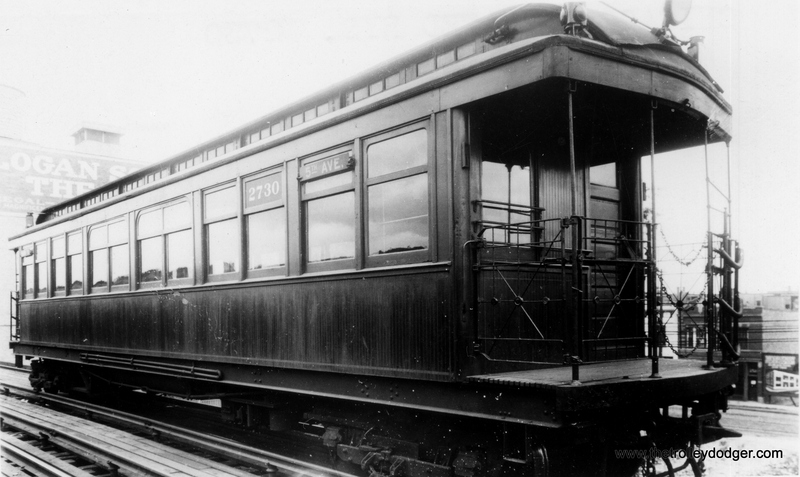 It was removed the following year. 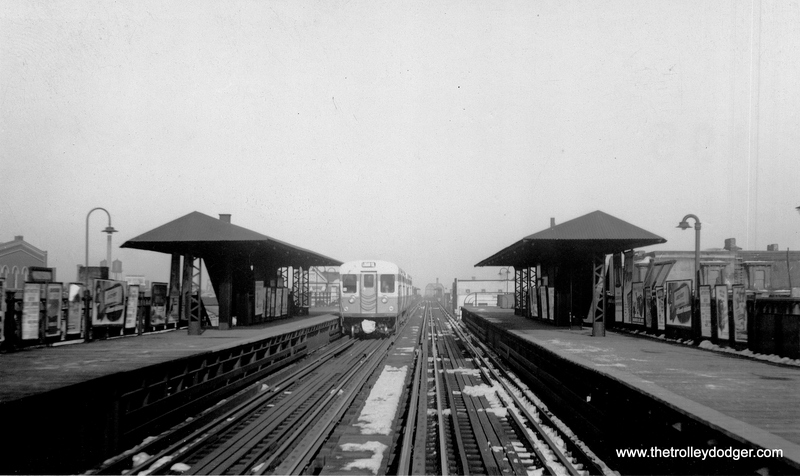 Logan Square and Humboldt Park trains stopped running on the other level here in 1951. 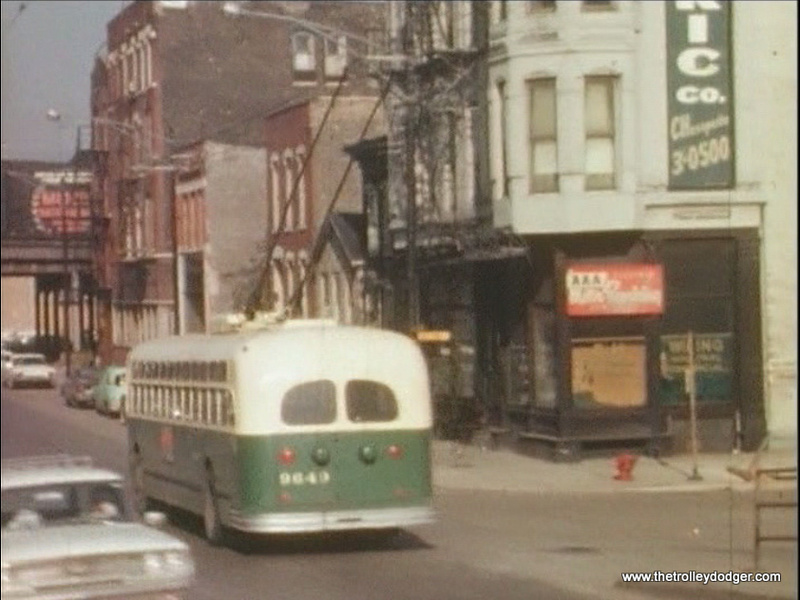 A quick glimpse of CTA trolley bus 9649. 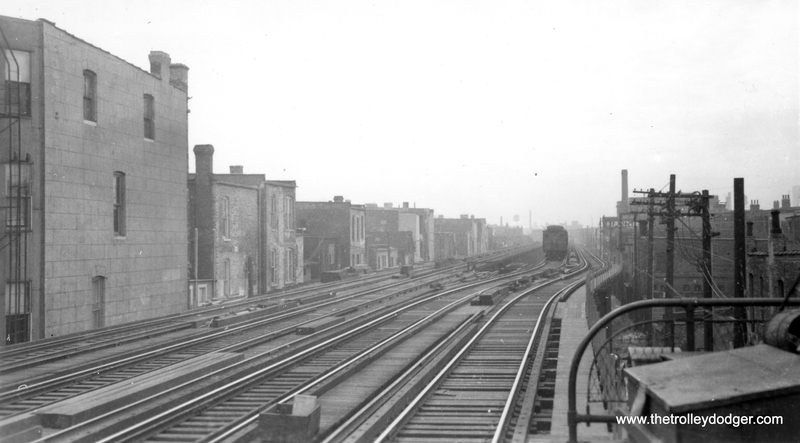 The photographer was on a northbound Evanston train that was pacing a Howard train of 6000s. 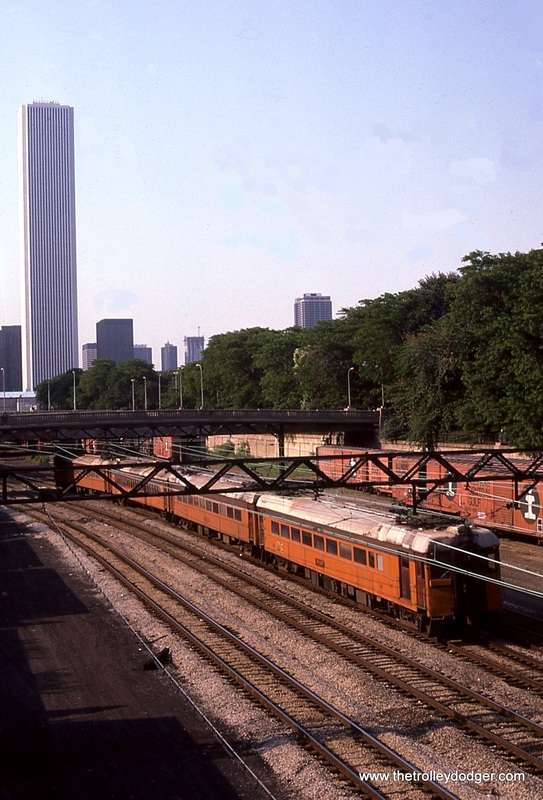 4000s pass the old Tower 18 in Chicago’s Loop. 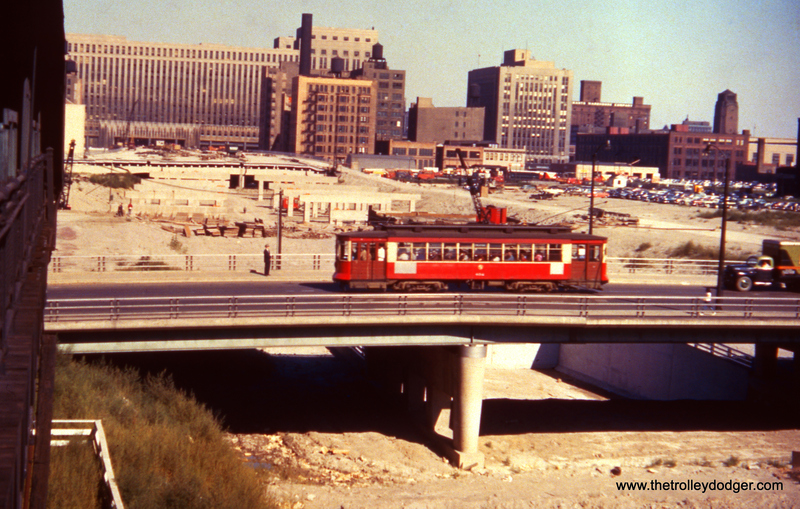 It was torn down and relocated in 1969 so that Lake Street trains could go directly east at this point, when that line was paired with the new Dan Ryan service. 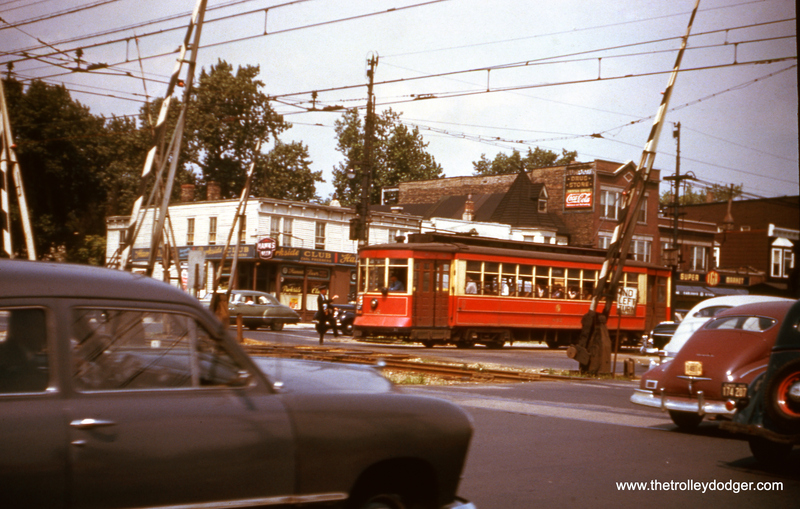 CTA single-car units under wire in Evanston in 1963. 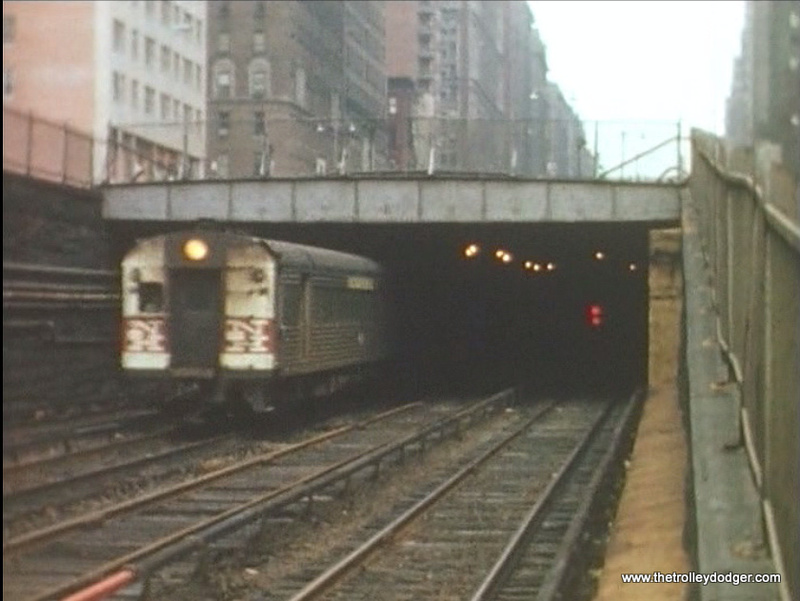 A New Haven train emerges from a tunnel in Manhattan. 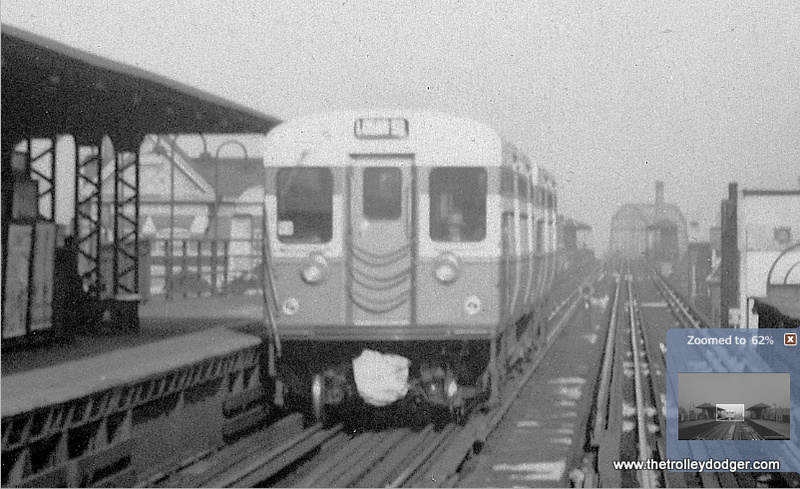 A New York rapid transit train on the 7 line in 1964. 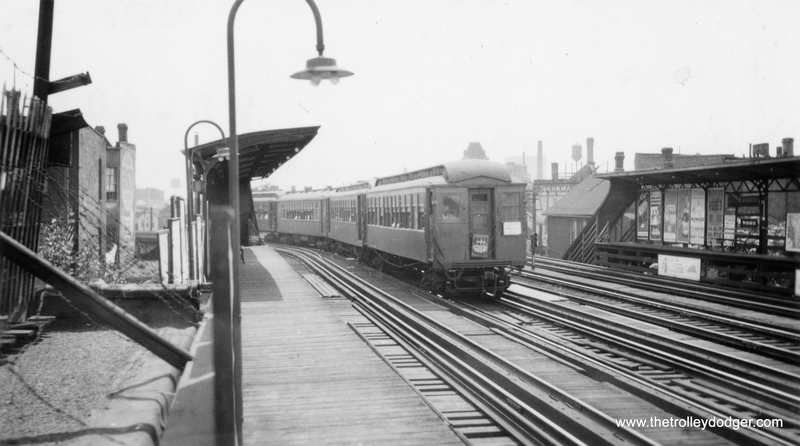 The New York Central in Manhattan. 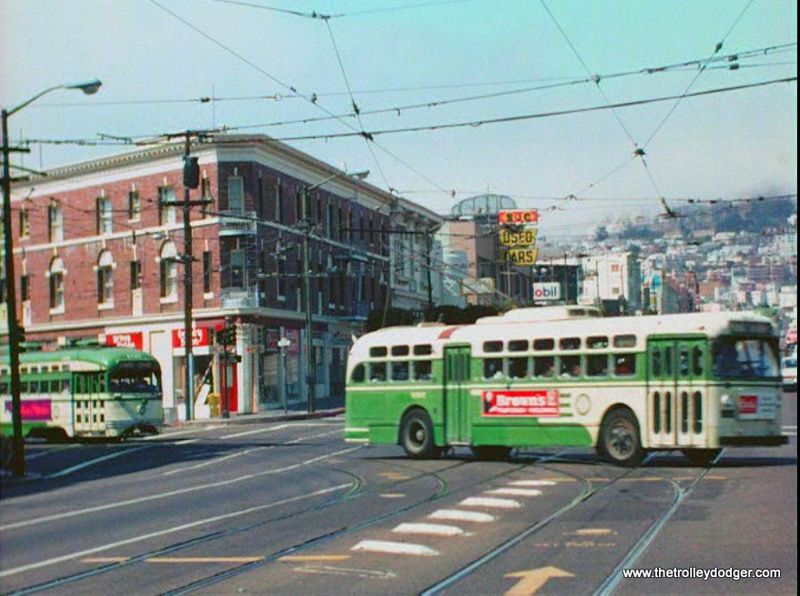 To this day, San Francisco operates trolley buses as well as PCCs. 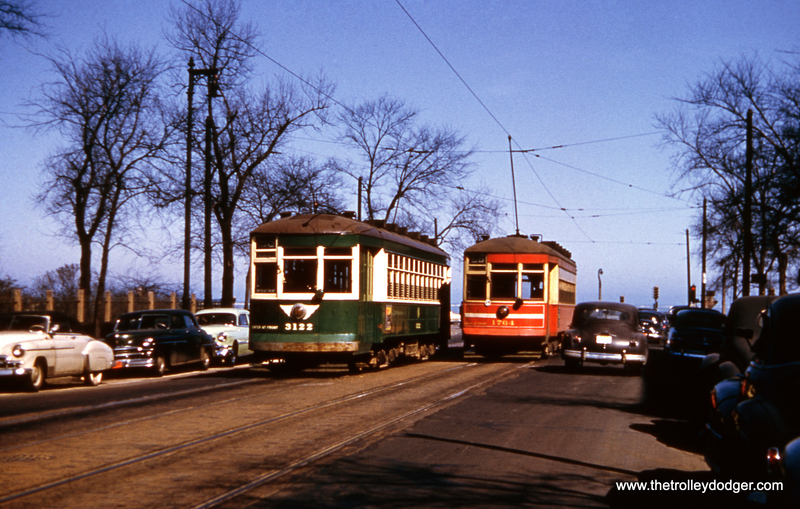 SF Muni PCC 1021 and a 1955-57 two-seater Thunderbird roadster. 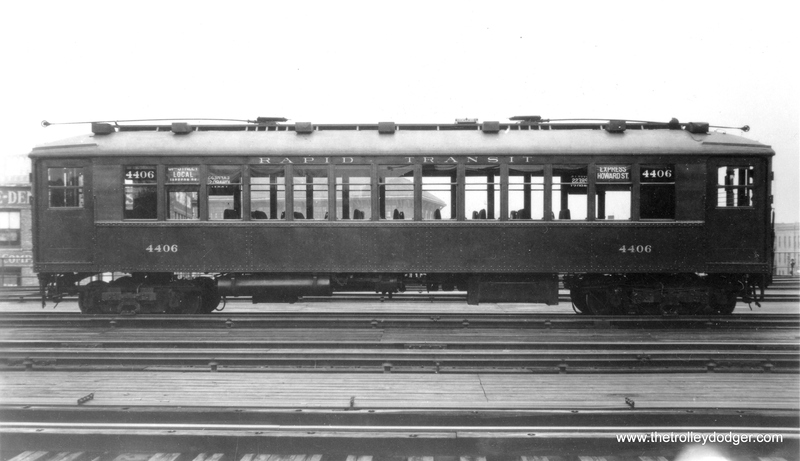 SF Muni double-end PCC 1015. 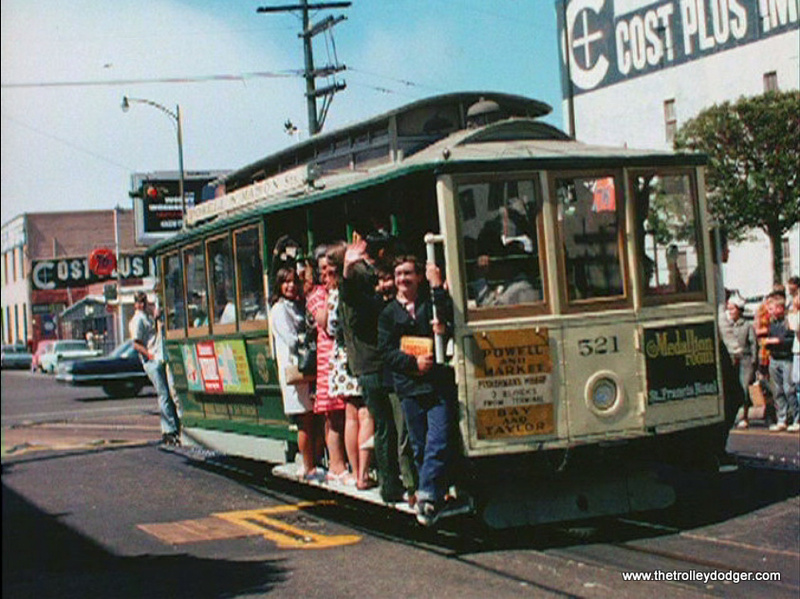 A San Francisco cable car in the late 1960s. 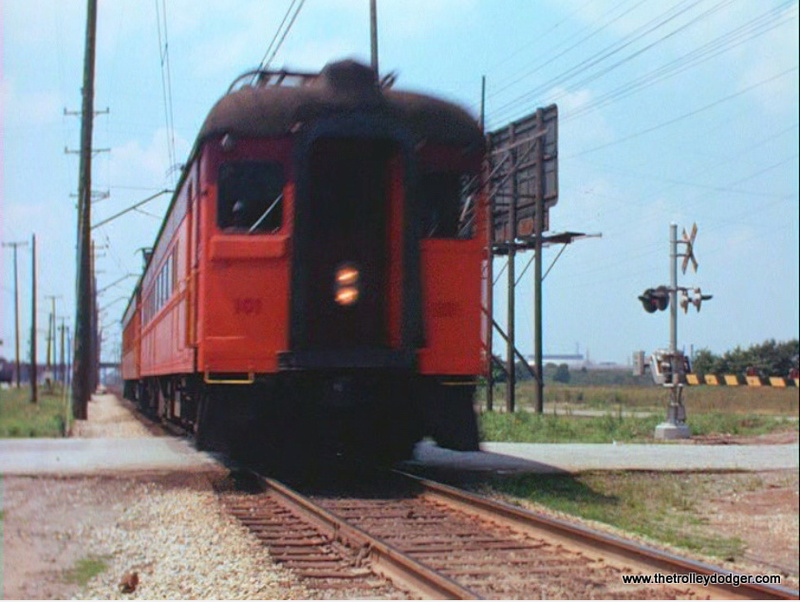 Red Arrow Strafford car 163 on a curve. 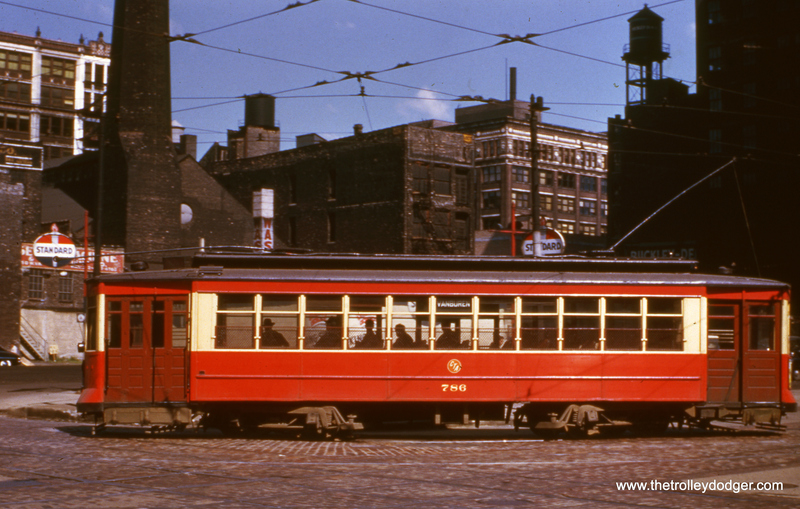 Red Arrow Strafford car 164. 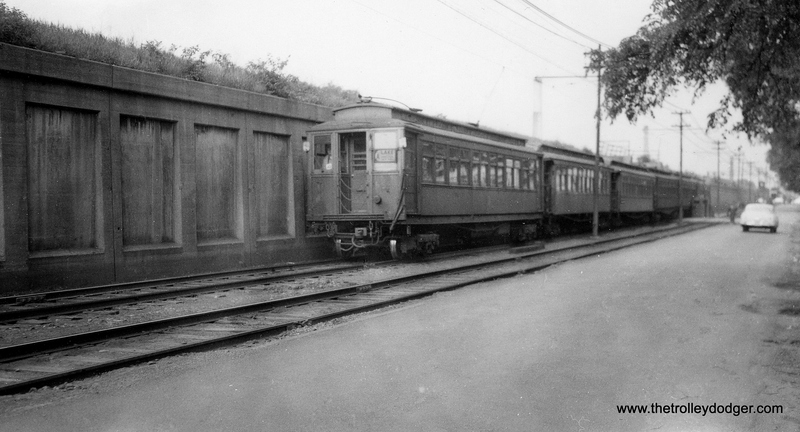 A Strafford car with a Liberty Liner (ex-North Shore Line Electroliner) behind it at 69th Street. 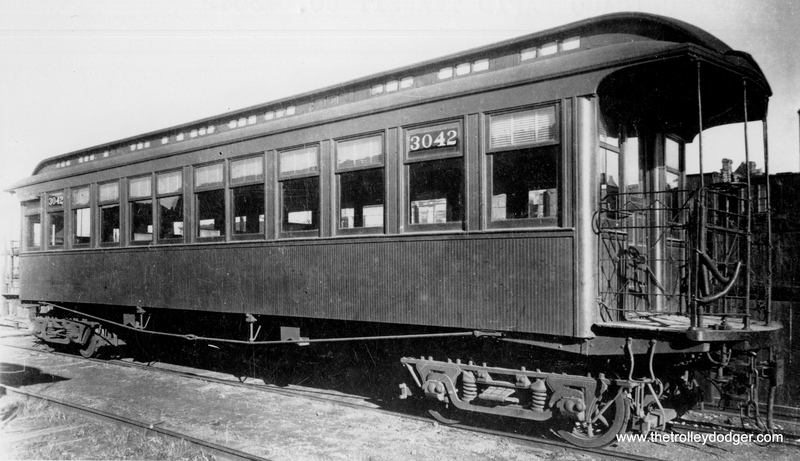 A Bullet car on the Norristown High-Speed Line. 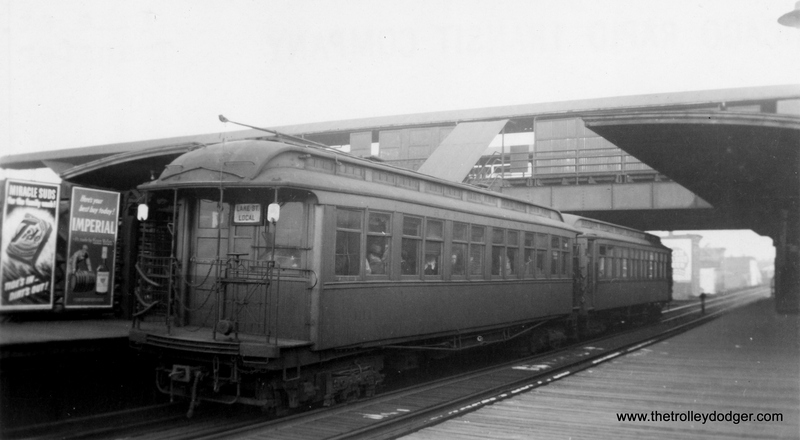 A train of Philadelphia “Almond Joys” at 69th Street Terminal. 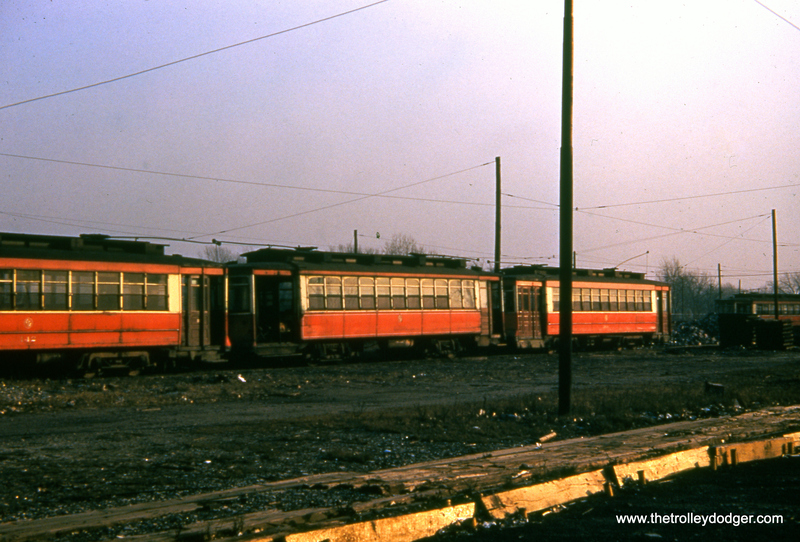 St. Louis-built double-end car 16 (not an official PCC, although it certainly looks like one) on the Red Arrow. 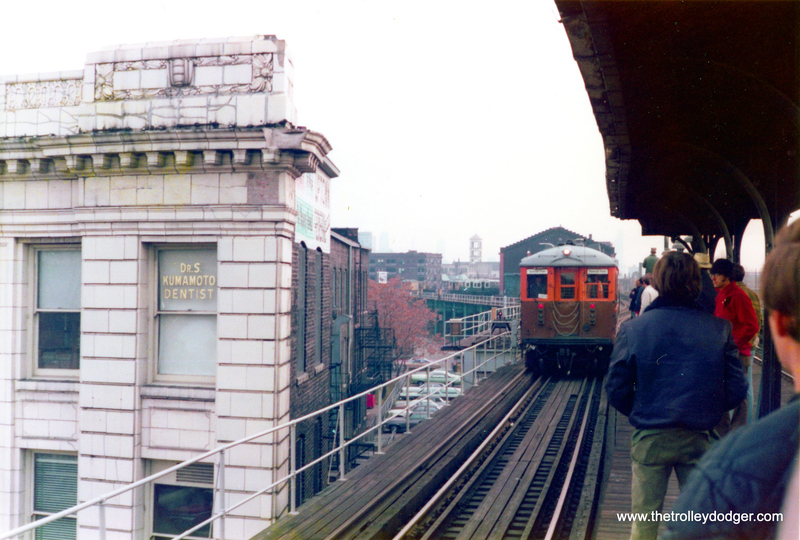 Red Arrow Brilliner #1 at 69th Street. 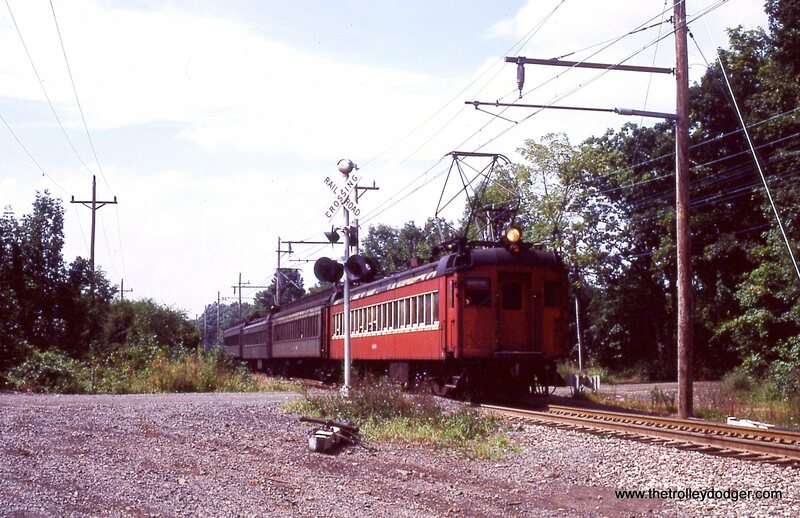 An Erie Lackawanna train in New Jersey. 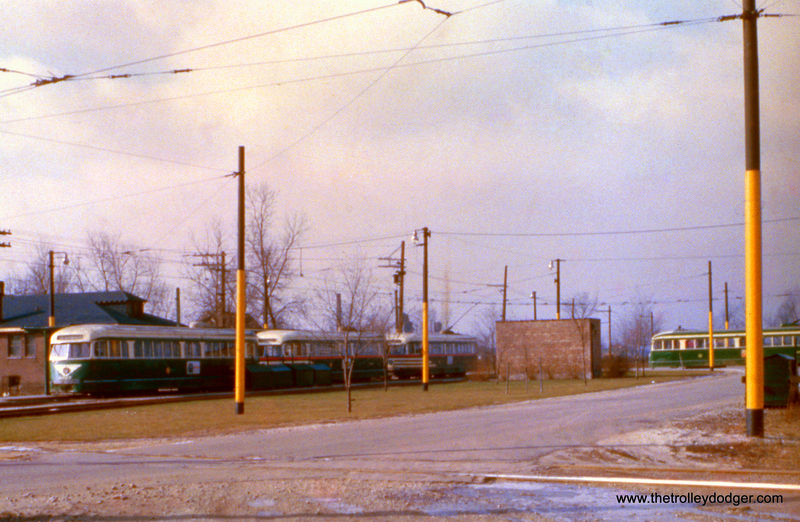 The South Shore Line shops in Michigan City. 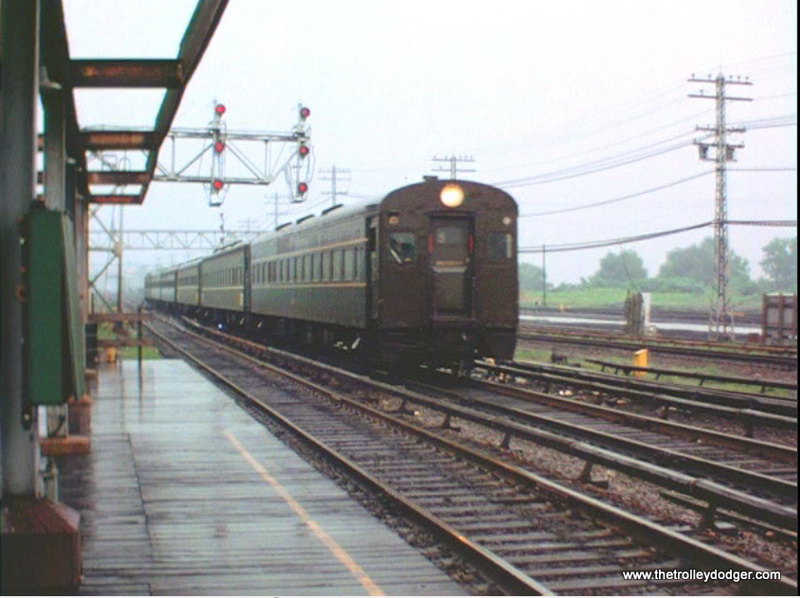 The South Shore Line in Indiana. 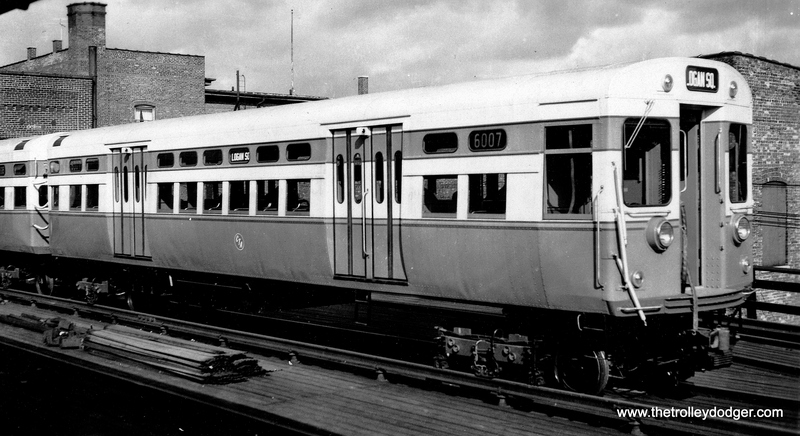 South Shore Line car 108 in Chicago. 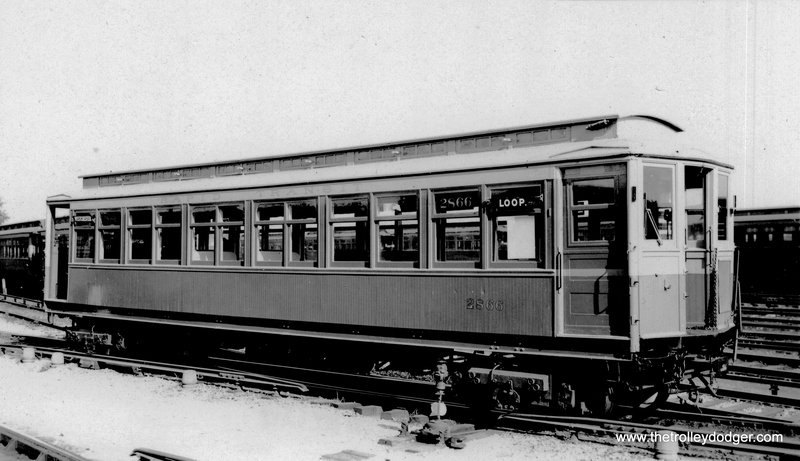 An Illinois Central bi-level whose end has not yet been repainted in brighter colors. 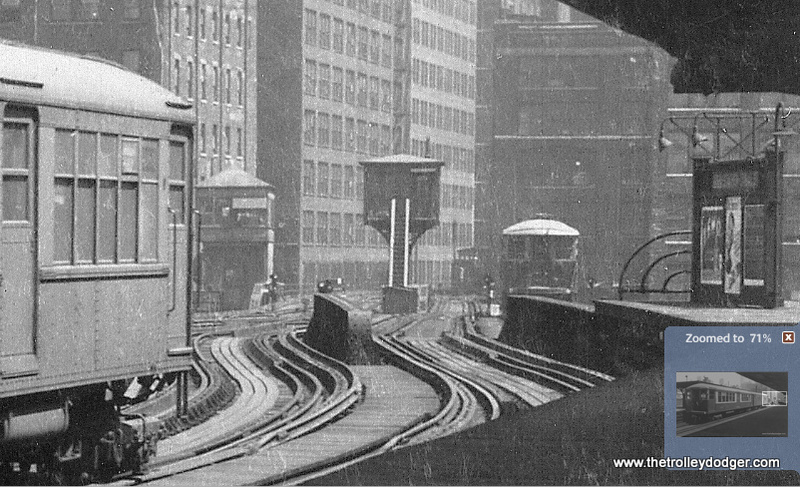 Illinois Central bi-levels in Chicago, with the old Central Station in the background. Hello…hope you can point me in the right direction. 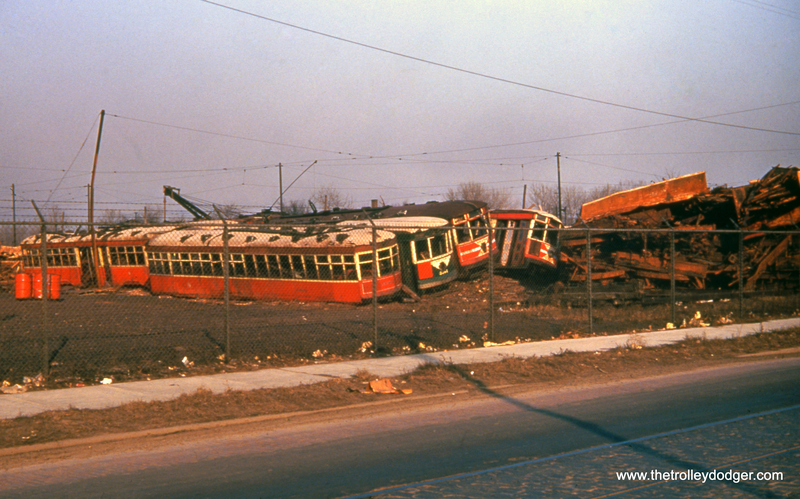 I remember seeing CTA wreck wagons as a kid and was always fascinated by them. 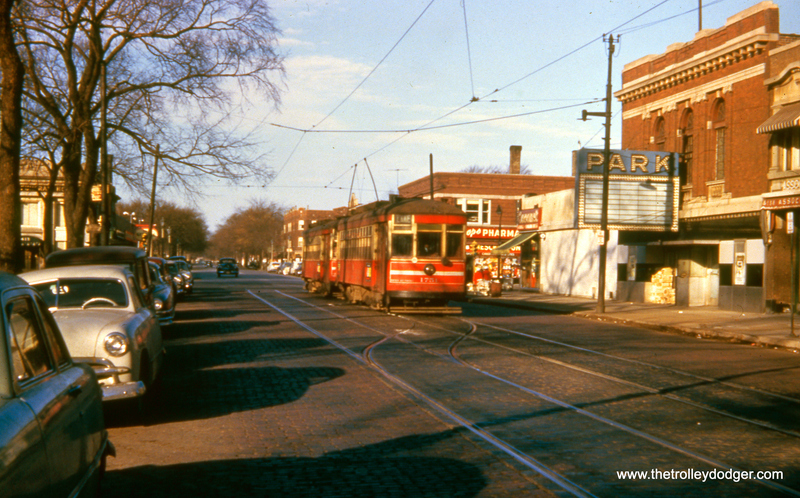 They looked like CFD rigs to me with Mars lights, gongs and sirens and even red and green headlights. 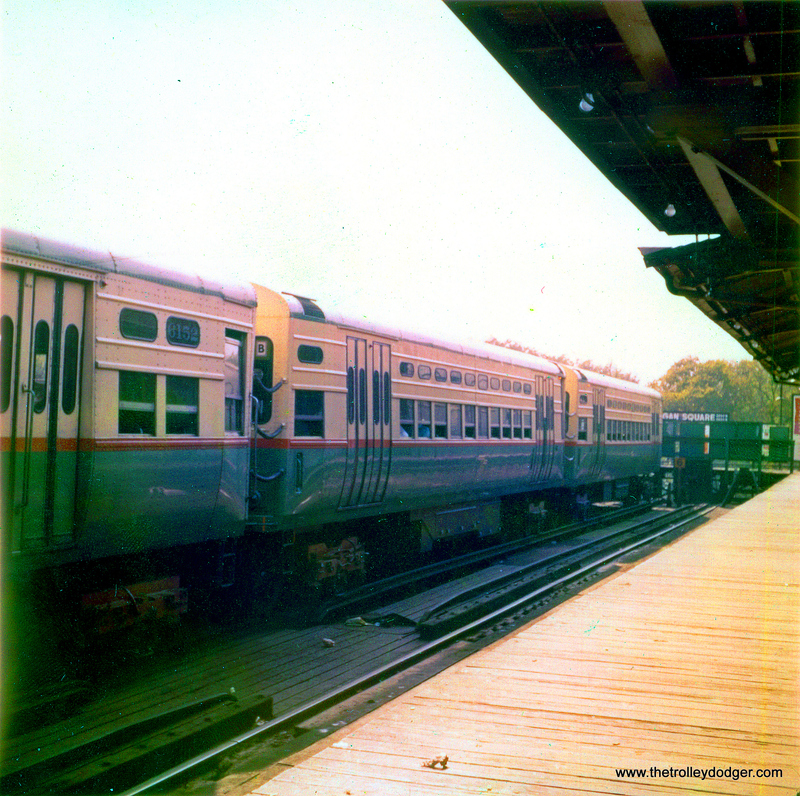 Are there any photos of them available anywhere? I’ve googled them and come up empty. Thank you. 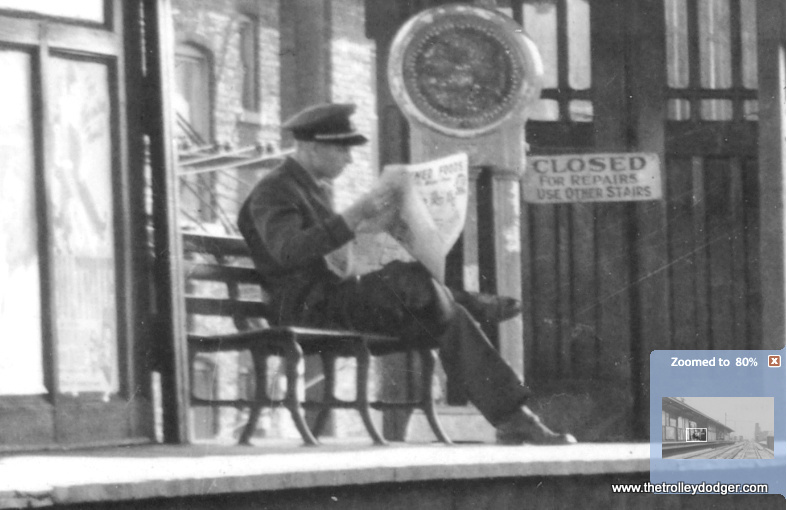 Perhaps our readers may have some pictures, thanks! 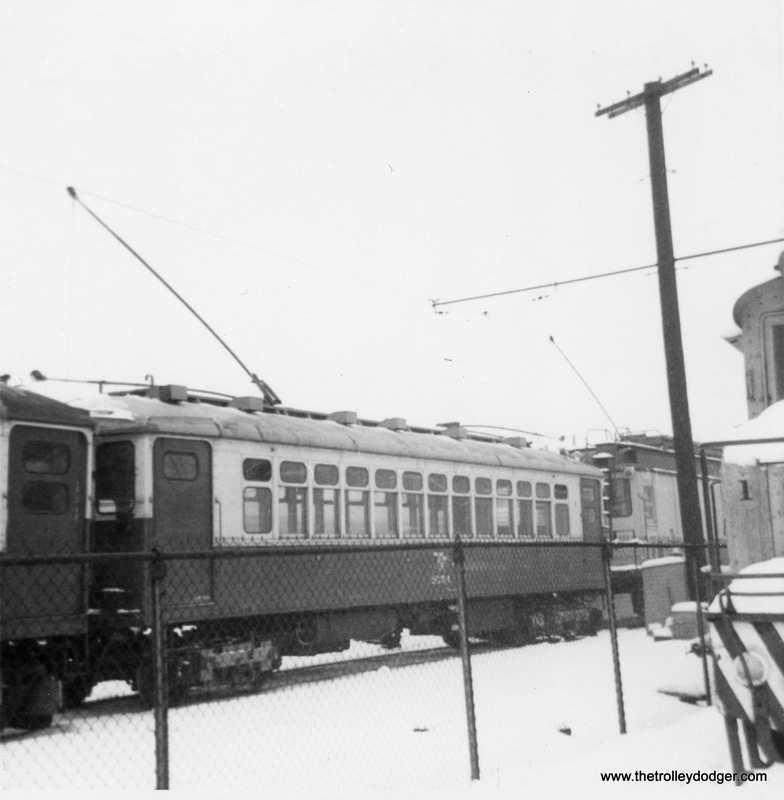 Why didn’t the CSL/CTA ever install Post War PCC cars on Ashland Avenue? 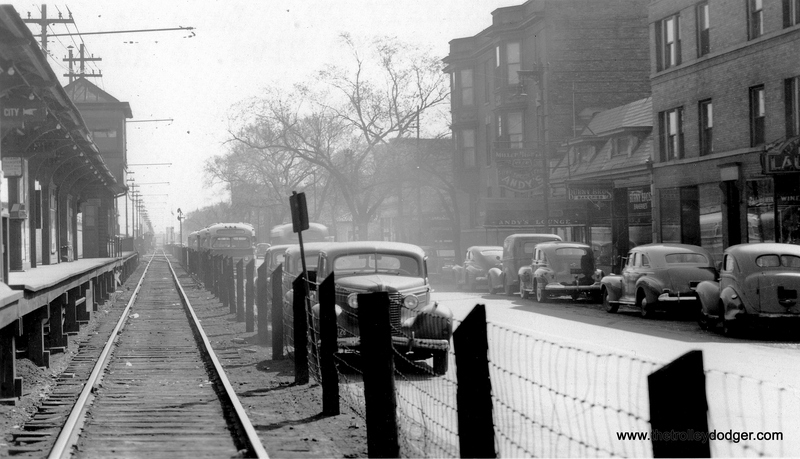 The street was as wide as Western Avenue from the north end to the south end. 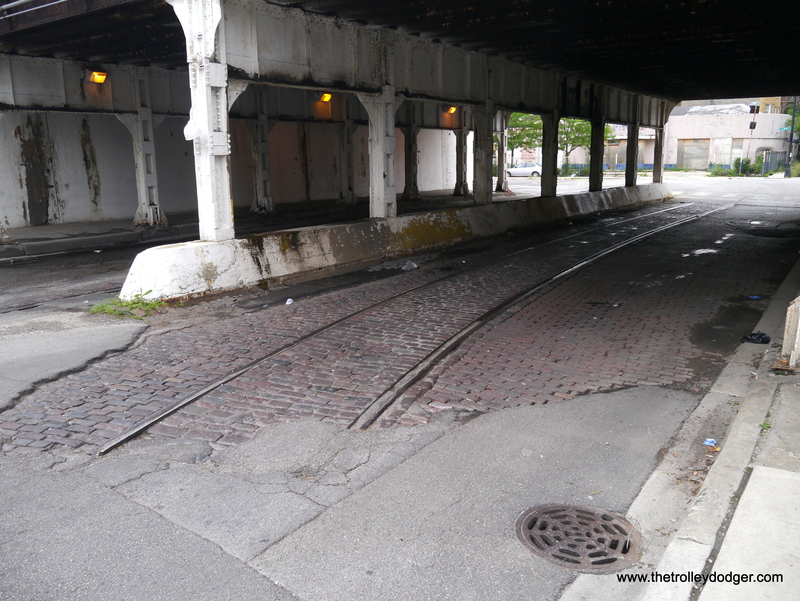 All that would have been necessary would have been the construction of an off street loop (such as Western and Berwyn) at 95th Street and a connecting track off of northbound Clark to southbound Southport at the north terminal. 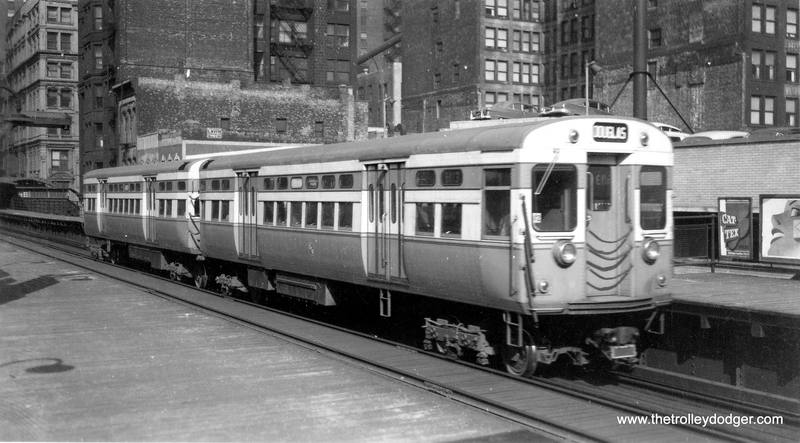 PS: Is it possible that Ashland and Milwaukee might have been slated for PCCs if they had ordered 1,000 as had been originally thought? 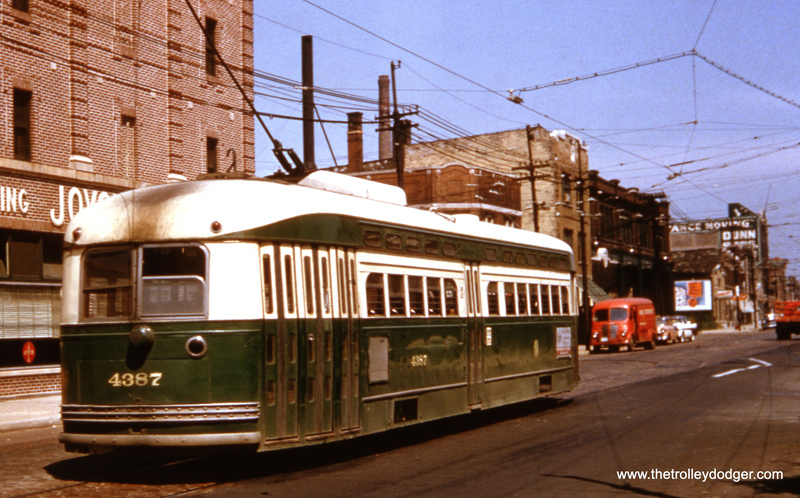 In 1937, when the “Green Book” plan was issued, the City of Chicago envisioned replacing half the existing streetcar fleet with PCCs, and the other half with buses (some of which would have been trolley buses). 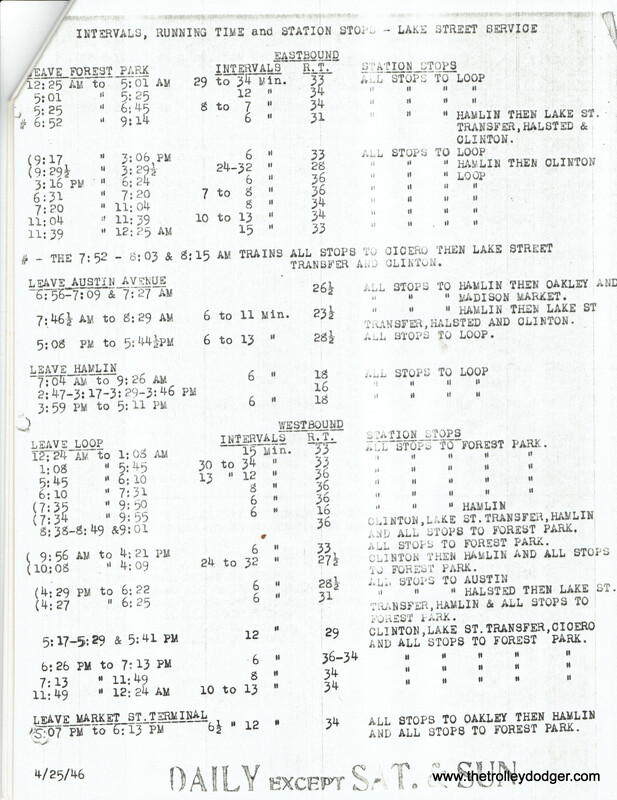 But the report noted that at some future date, buses might be able to handle all the traffic. 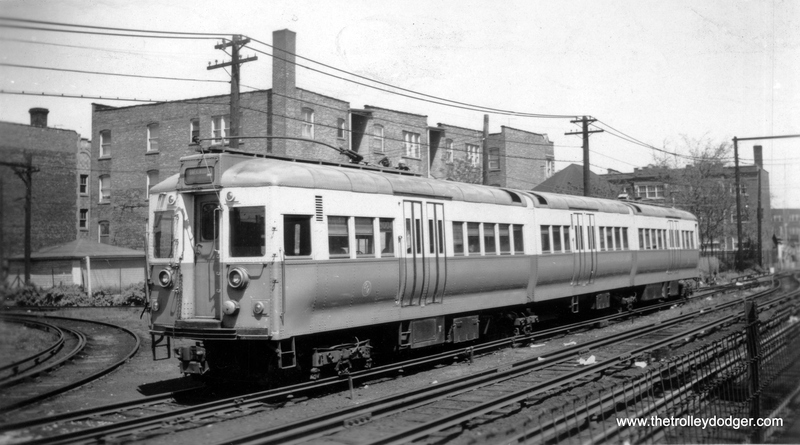 Half the fleet, at that time, would have been something more like 1,500 PCC cars. 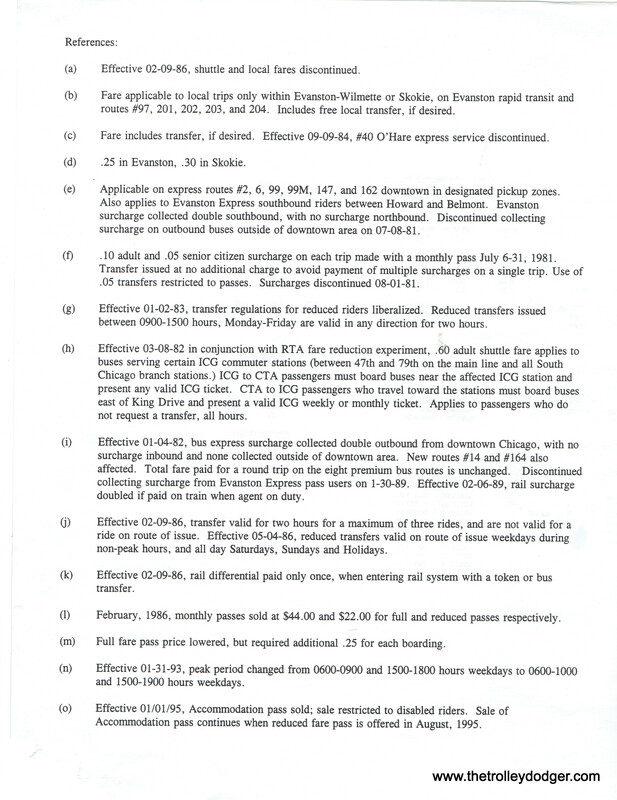 That the number was soon reduced to 1,000 probably reflects the continuing trend toward buses. 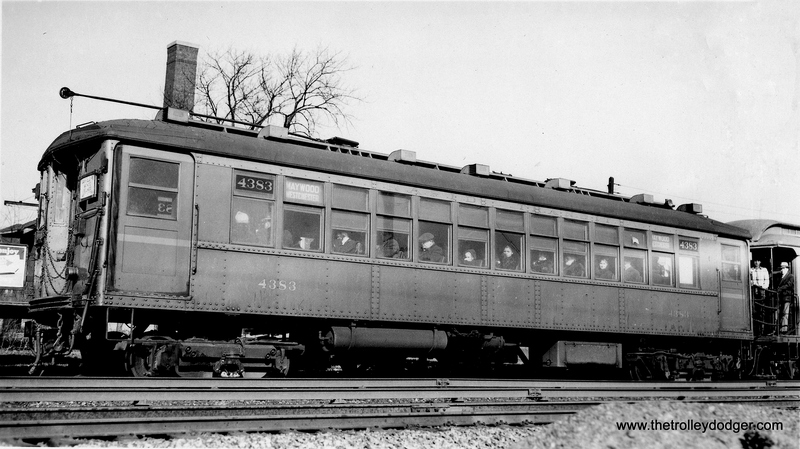 Milwaukee would have to be a candidate for PCCs, since one PCC (4051) was operated there in 1940-41, on a test basis with the altered door configuration that CSL adopted for the postwar cars. 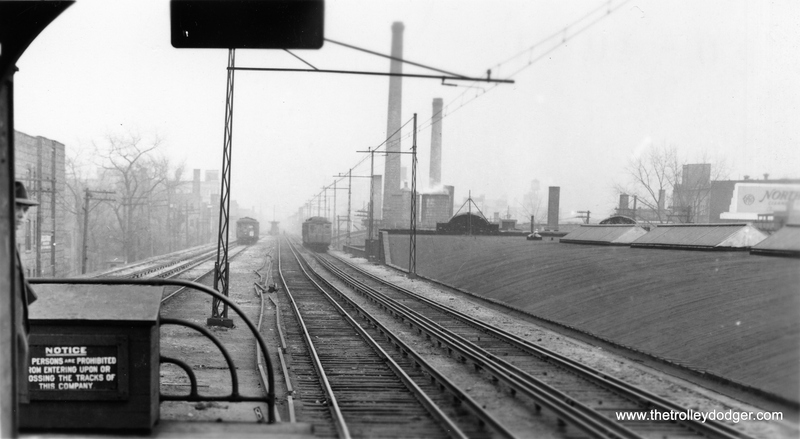 On the other hand, arguing against that is the plan, formulated in 1939, for the Dearborn-Milwaukee subway. 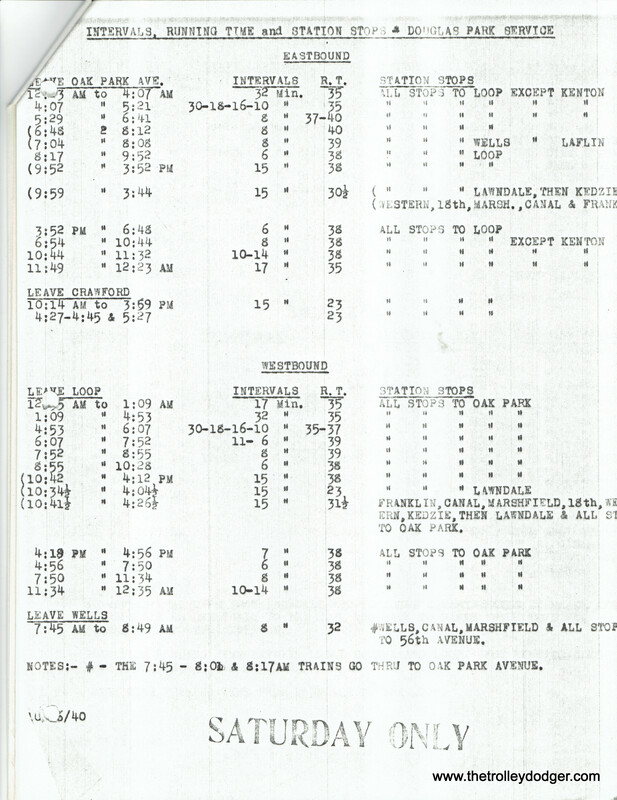 Only the outer portion of Milwaukee truly made sense to run PCCs if you were going to have a greatly improved, more direct rapid transit service running in a subway on Milwaukee. 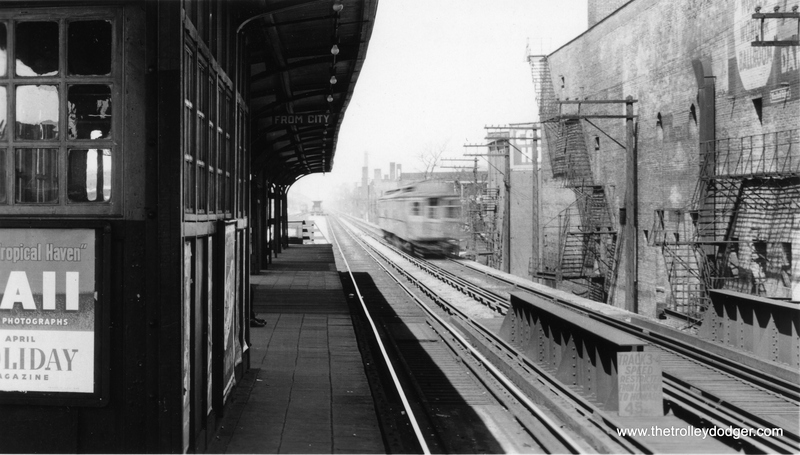 PCCs would have done well in feeder service between the Imlay Loop at the city limits and the Logan Square terminal. 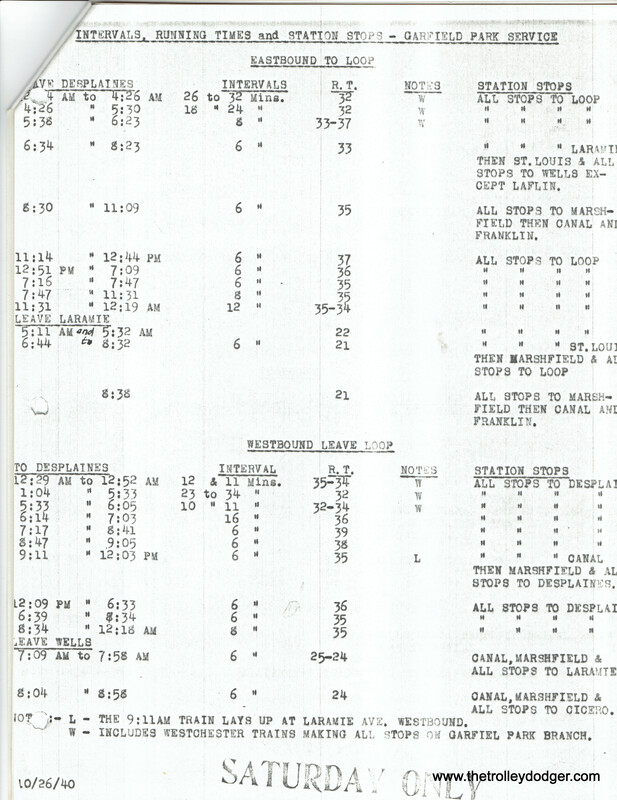 Offhand, I don’t know where Ashland would stack up in a list of the heaviest lines. 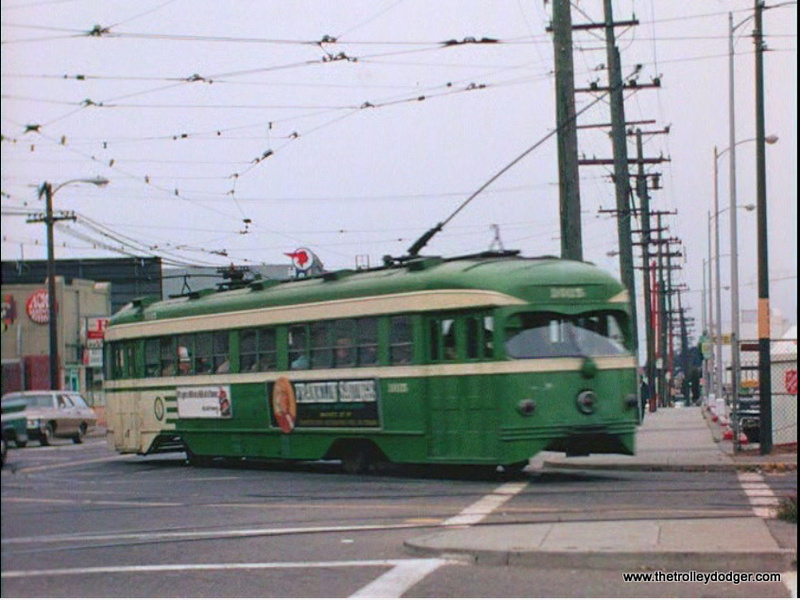 But certainly the prevailing wisdom at CSL in the 1930s and 40s was to use streetcars for the heaviest lines, trolley buses for the medium ones, and gas or diesel buses for the rest. 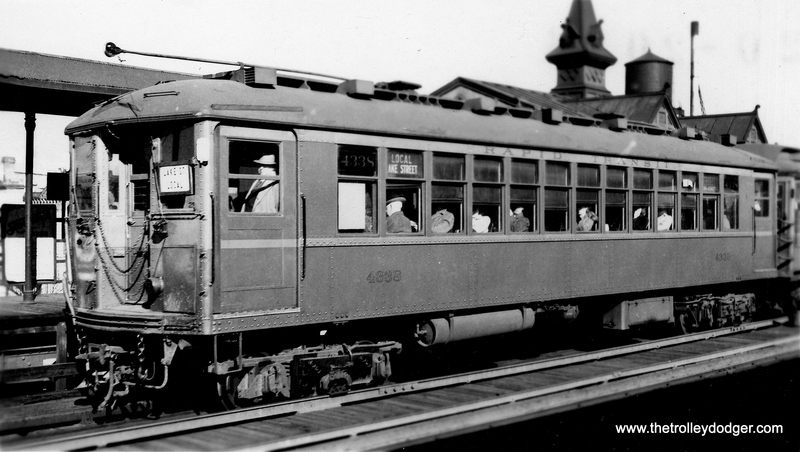 I assume that Ashland had plenty enough ridership to be considered for PCCs, though, and it would have been an excellent choice. 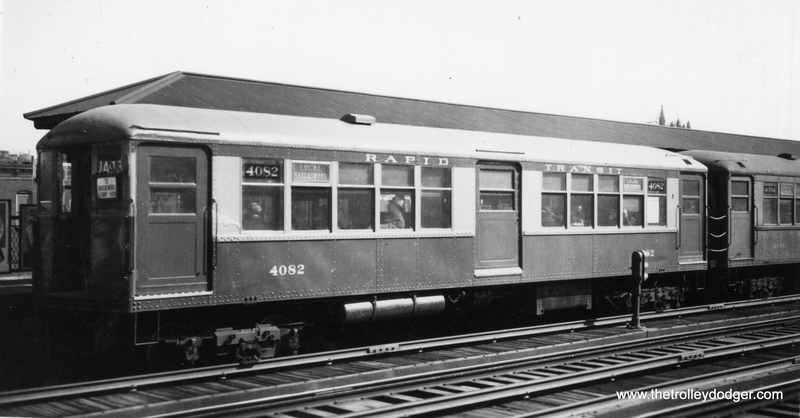 Ridership in the WWII era was heavy enough that CSL and the City planned to assign the 600 postwar PCCs to just four major lines. 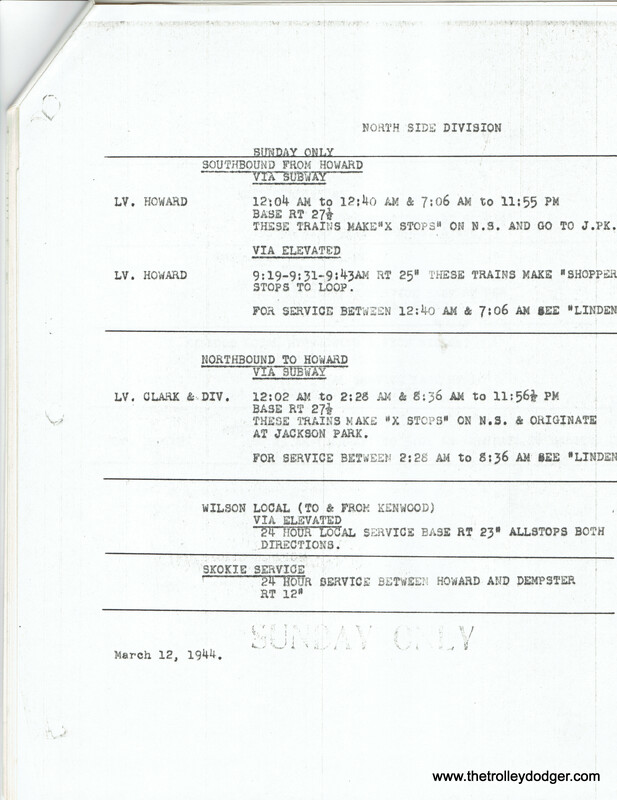 But by the time the deliveries were complete, this had been expanded to six lines, since ridership was declining. 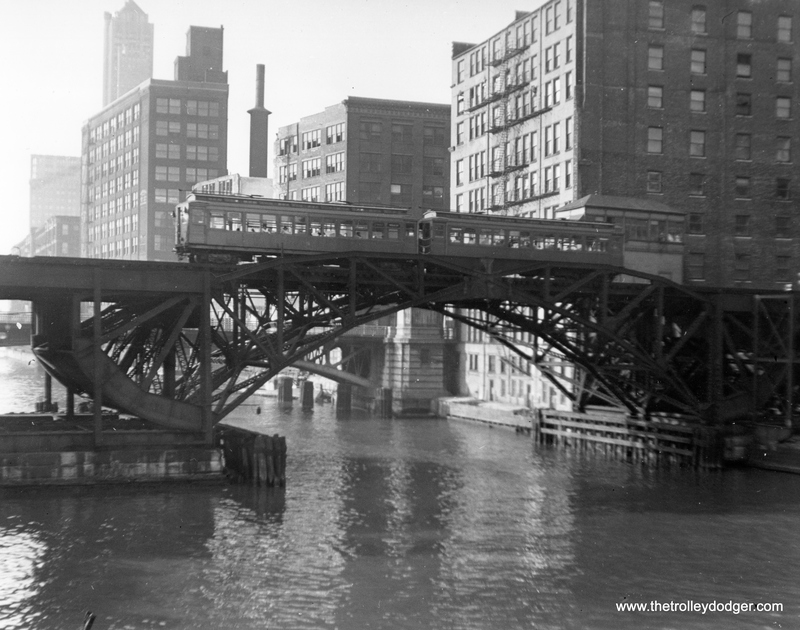 What we don’t know is how strategic these assignments were, with the thought of creating an ongoing streetcar system for Chicago that could have continued into the future. 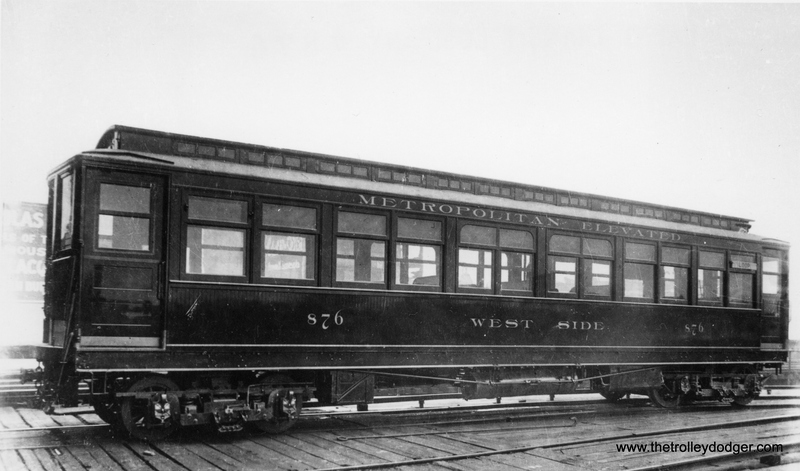 One thought is that perhaps the CTA and the City felt that they had to spread the new cars around, so that more neighborhoods would benefit from the new service. 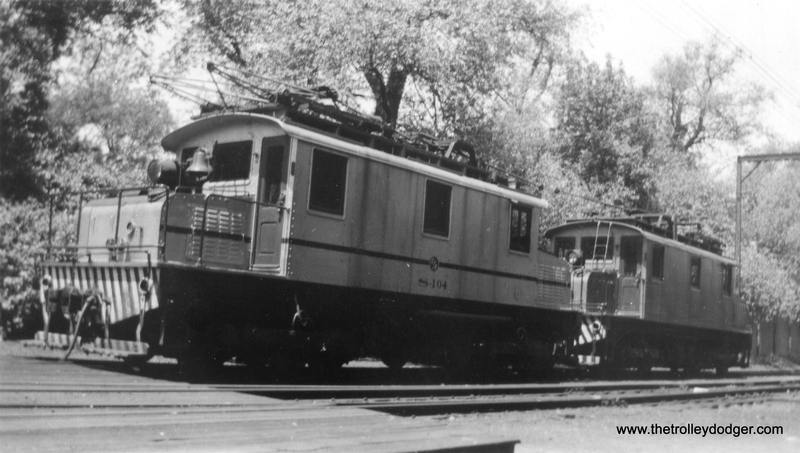 If that was a consideration, it would argue against Ashland, since it ran parallel to Western and went to many of the same parts of town. 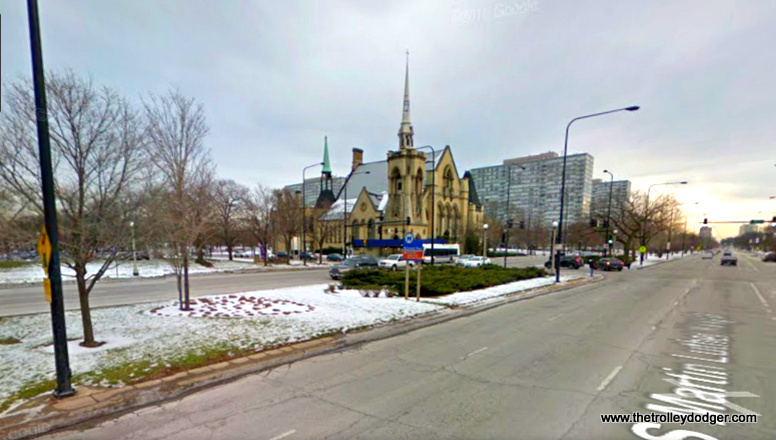 It would argue in favor of choosing a street like 63rd, which ran east-west on the south side and therefore served different neighborhoods. 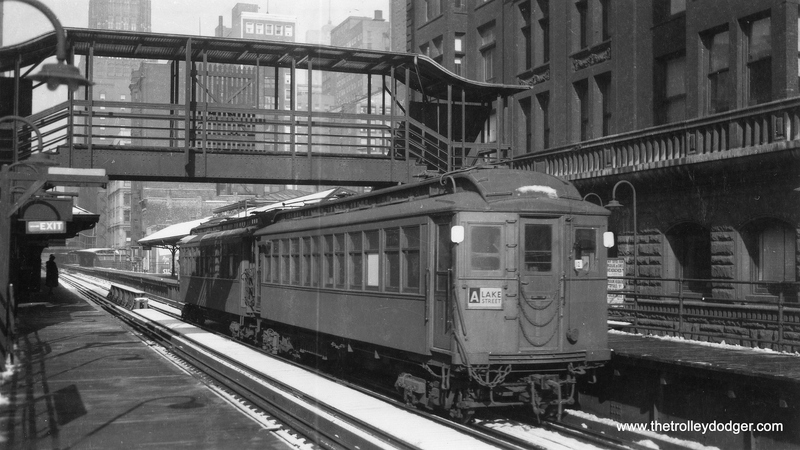 In any event, by 1947 the CTA, even as it was still taking deliveries on the postwar order, seems to have planned for the gradual phasing out of streetcars, even the PCC ones. 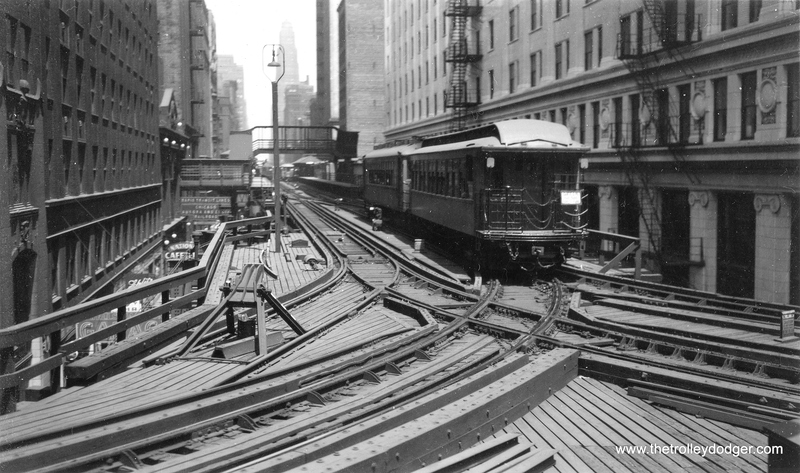 The 1947 CTA modernization plan (which you can read in my E-book Chicago’s PCC Streetcars: The Rest of the Story), which covered the years 1946-1955, anticipated having only three streetcar lines left by 1955, which is pretty much what actually did happen. 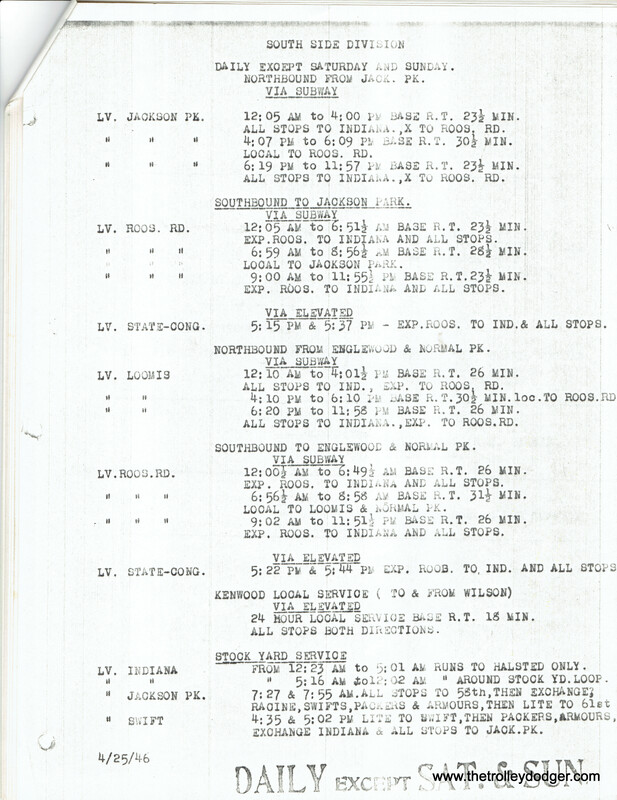 Presumably, they would have phased those out in the years following 1955, if another such plan had been published. 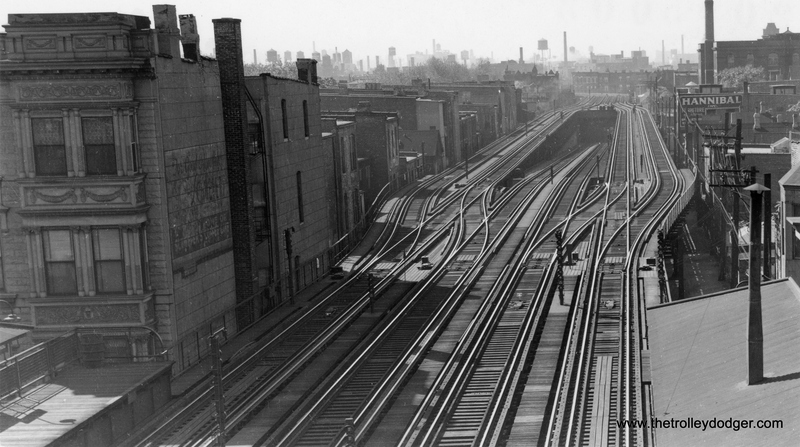 Furthermore, it was not always possible for CTA to put turnback loops where they wanted them. 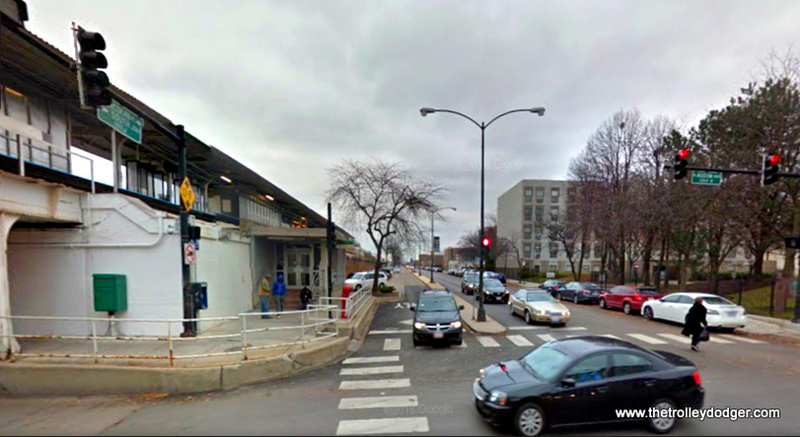 The area around 95th and Ashland was built up and who knows what locations would have been available. 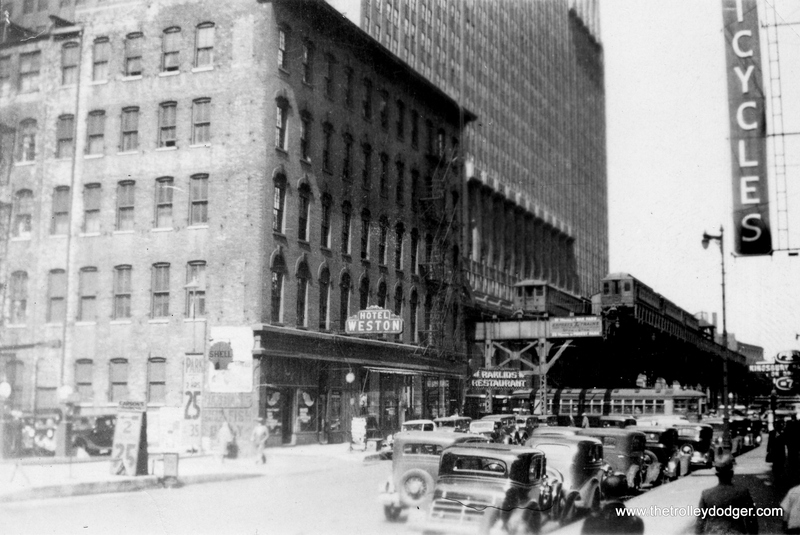 There were plans to build a loop for the 36-Broadway at 115th that never materialized, due to neighborhood opposition. 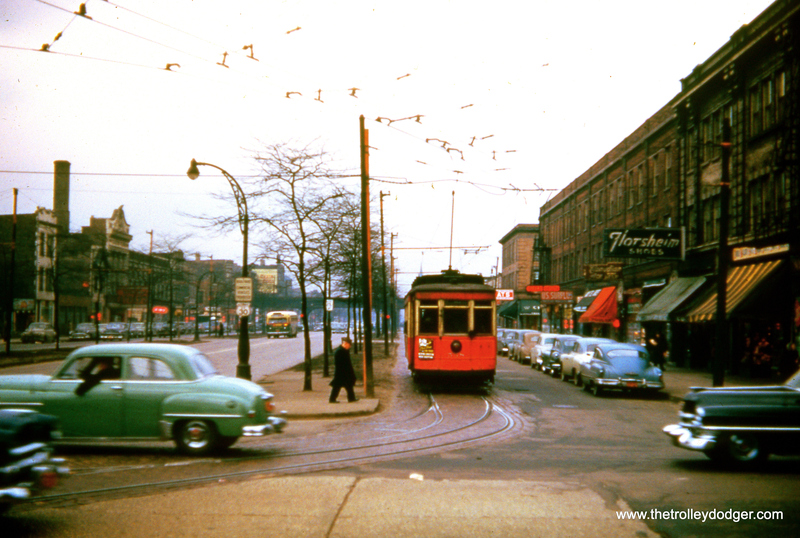 And the Grand-Nordica trolley bus loop for route 65 – Grand could only be put a couple blocks away from Harlem, which would have been much the preferred location. 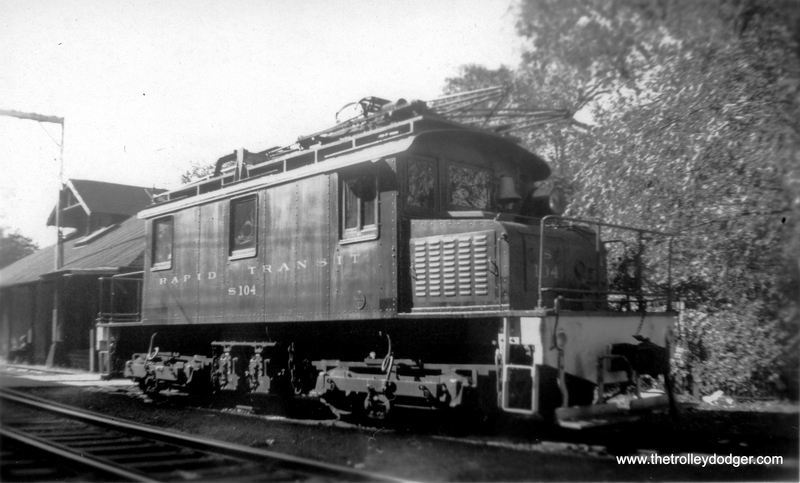 This is our 161st post, and we are gradually creating a body of work and an online resource for the benefit of all railfans, everywhere. 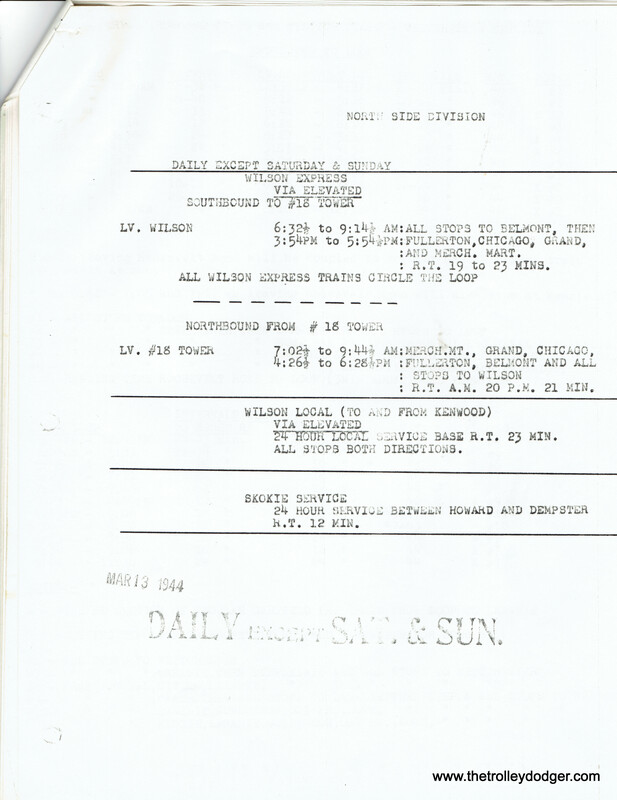 To date, we have received over 206,000 page views, for which we are very grateful.